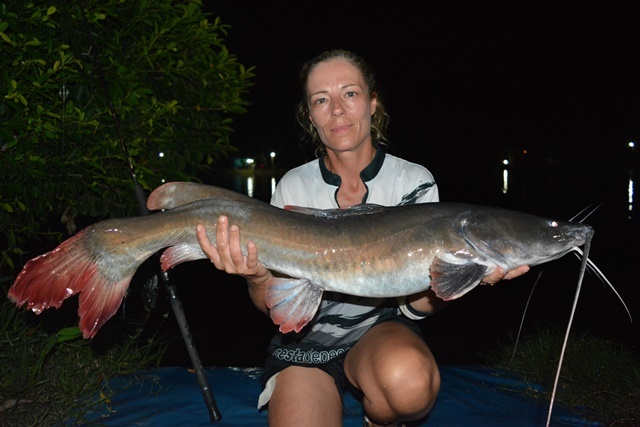 What a truly awesome session Marian Garpez had catching an enormous number of fish of a great variety of species in her first week of fishing at Palm Tree Lagoon. 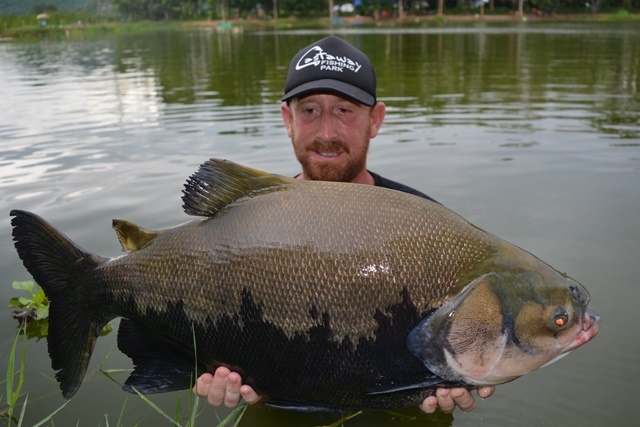 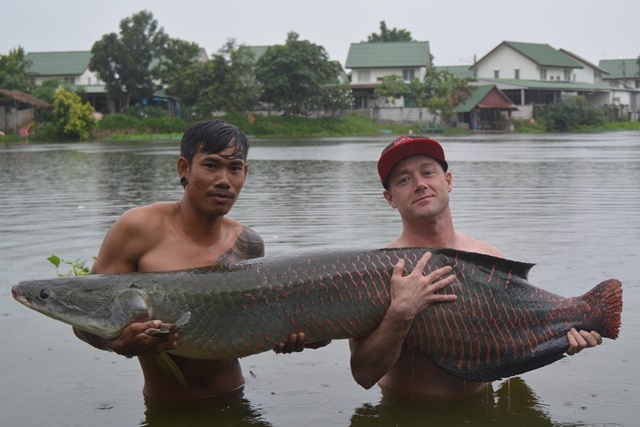 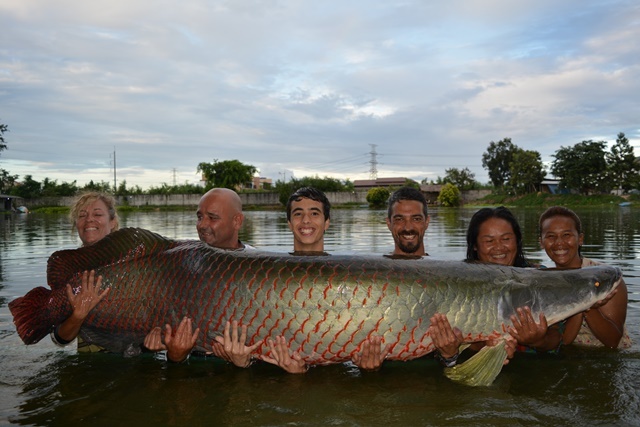 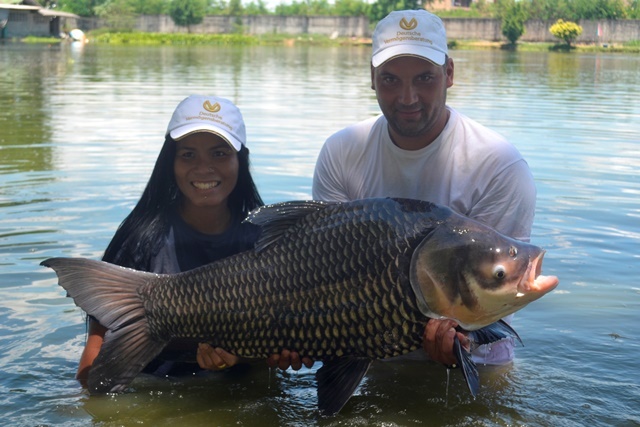 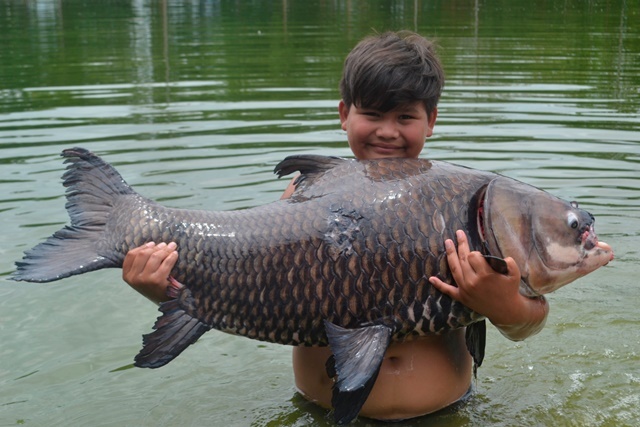 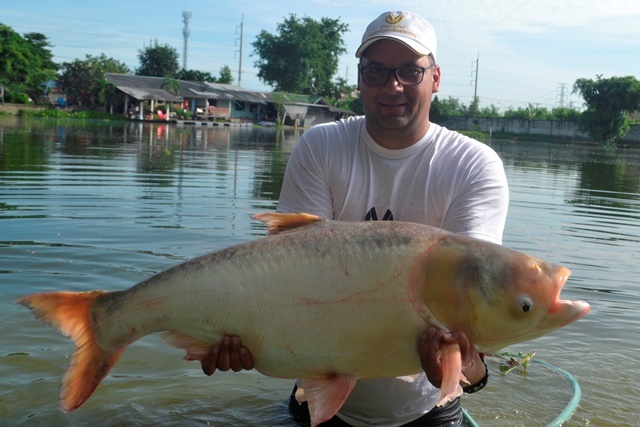 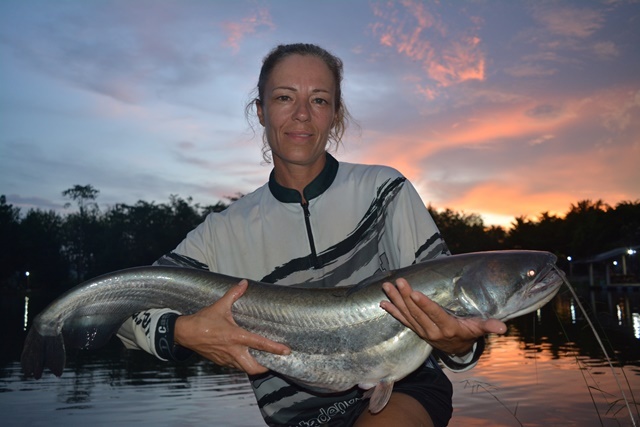 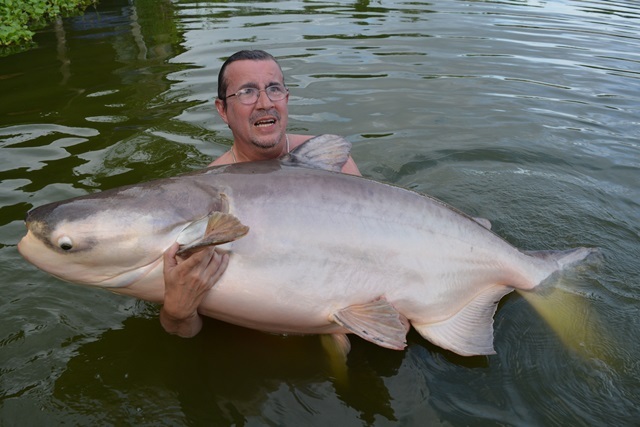 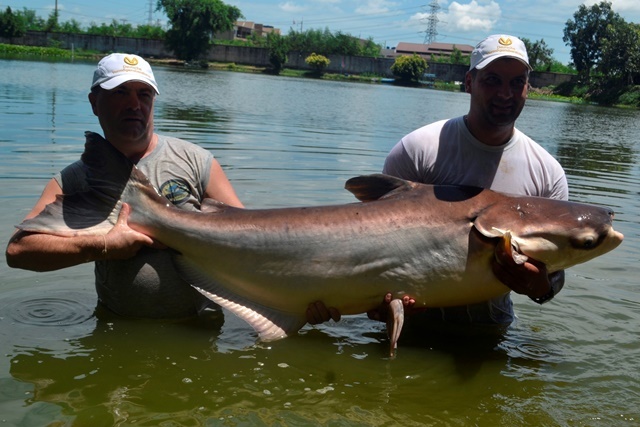 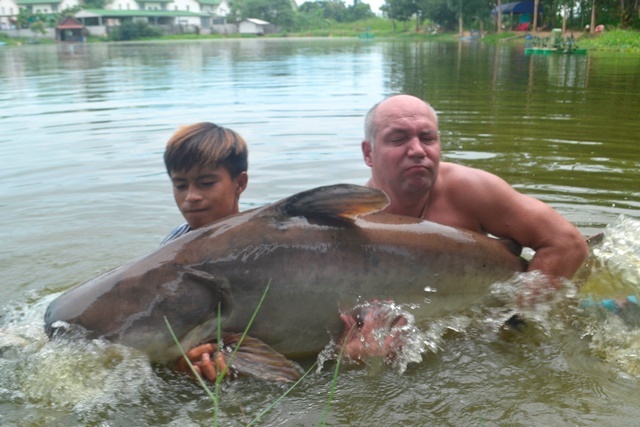 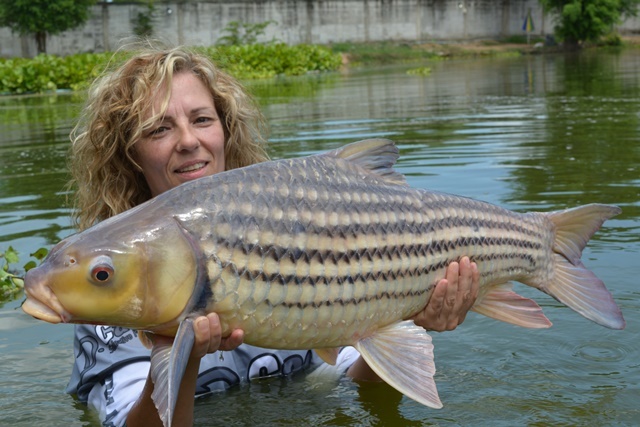 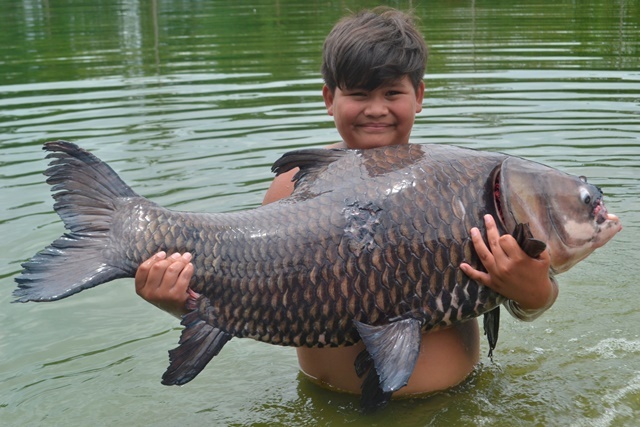 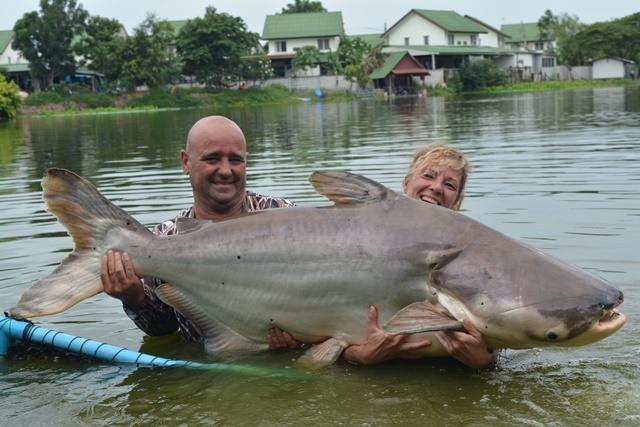 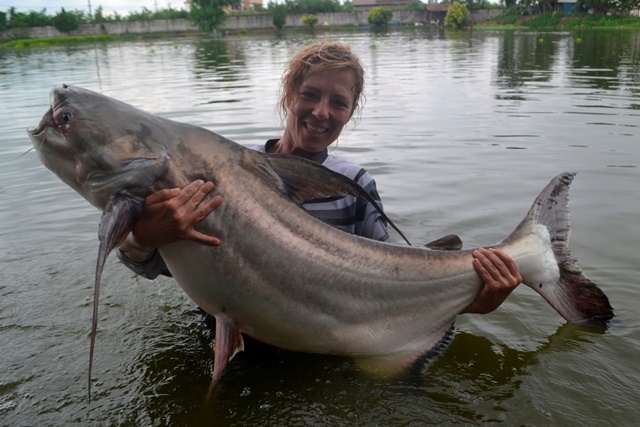 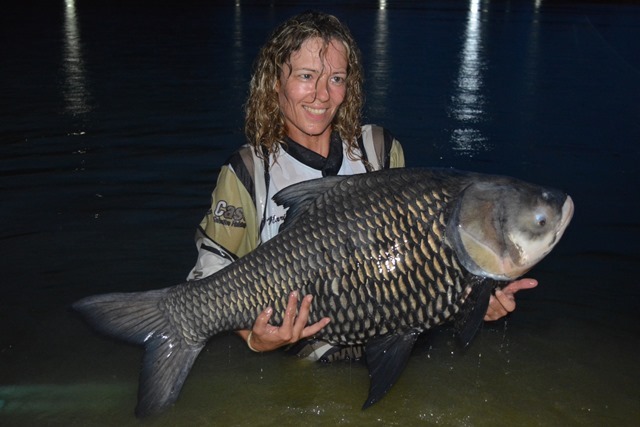 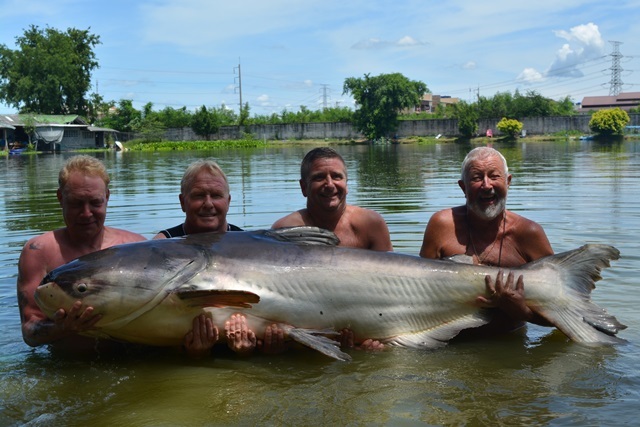 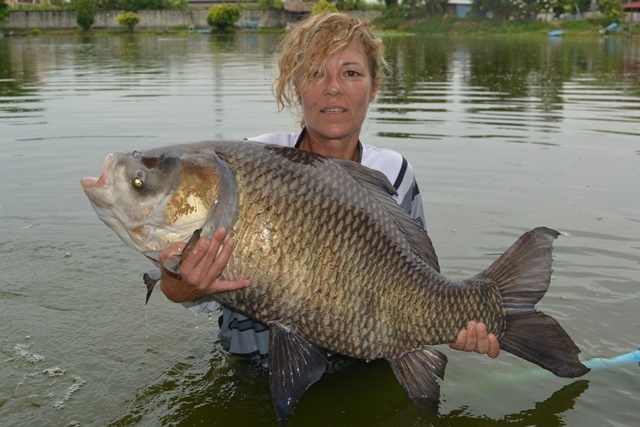 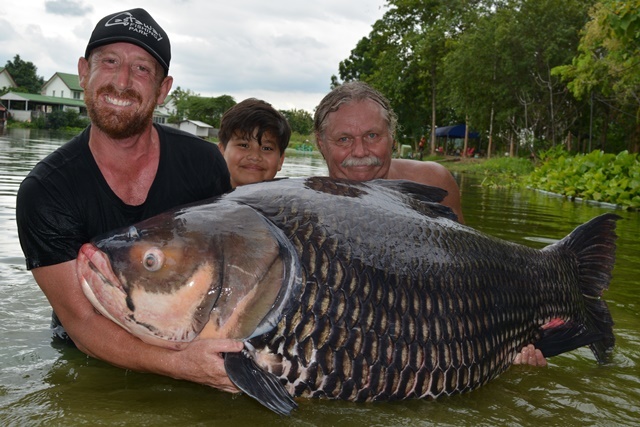 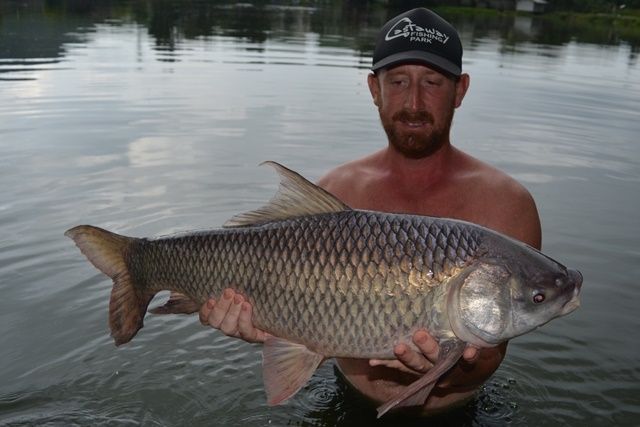 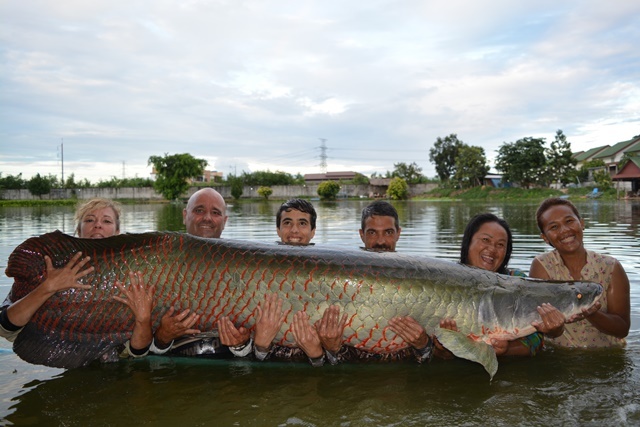 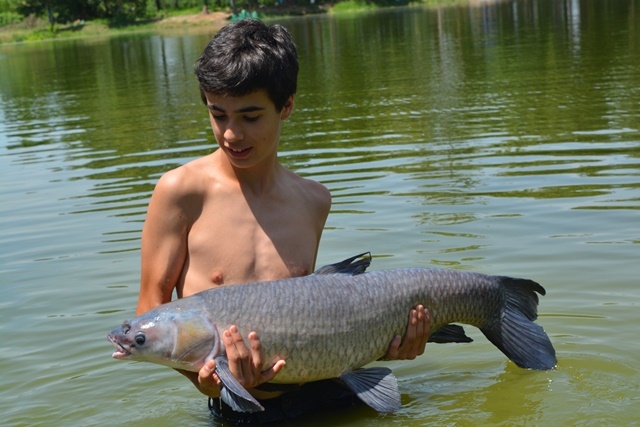 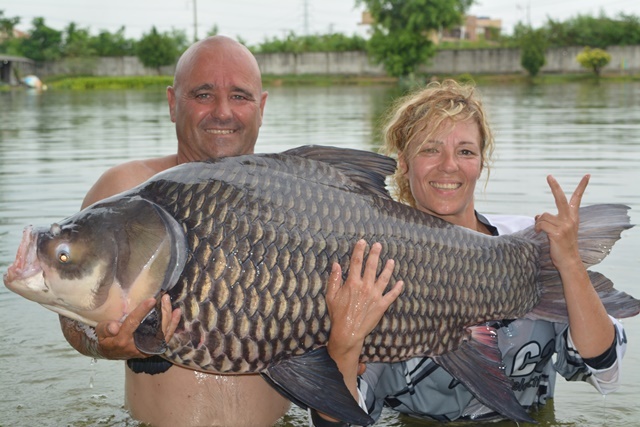 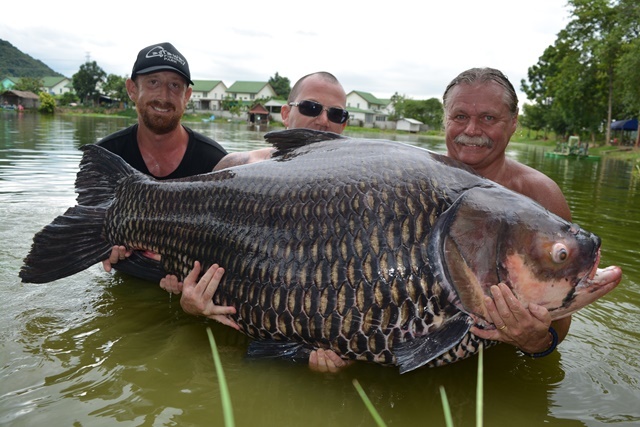 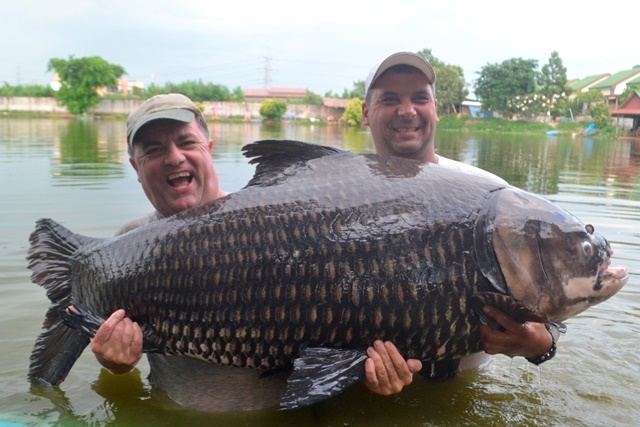 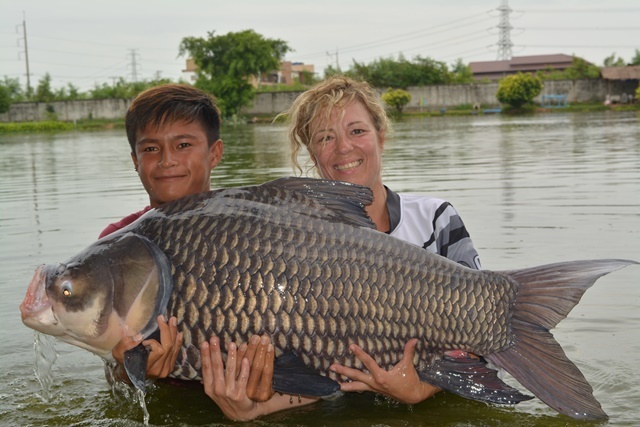 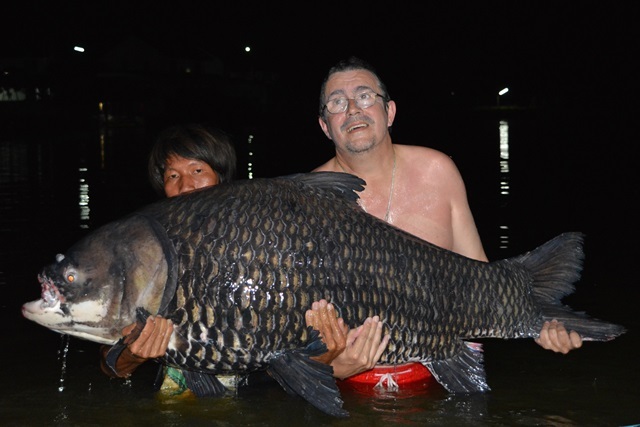 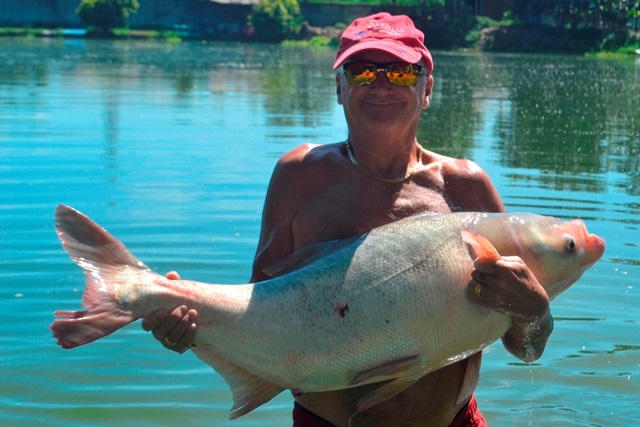 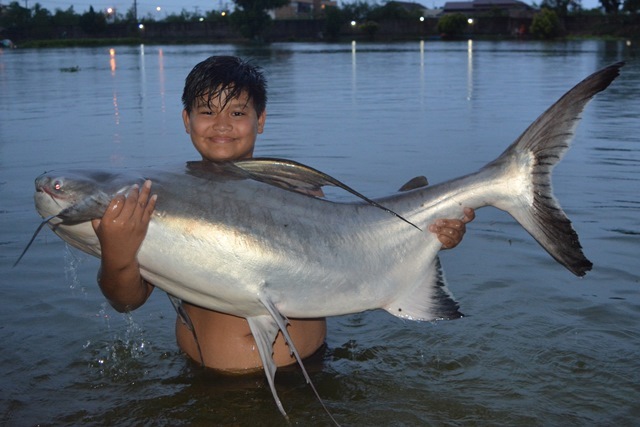 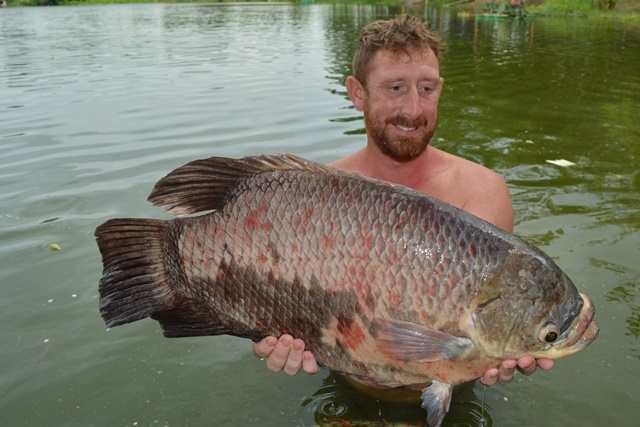 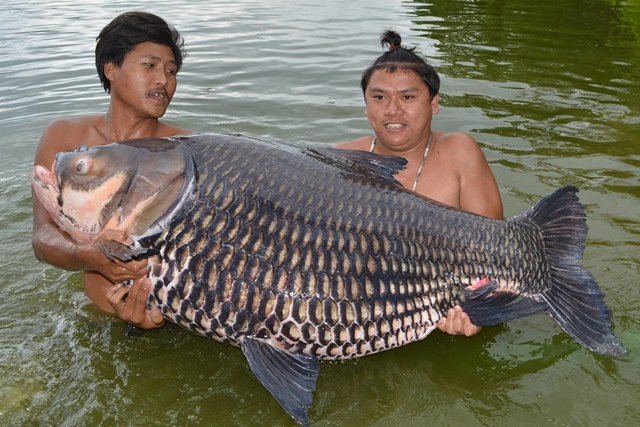 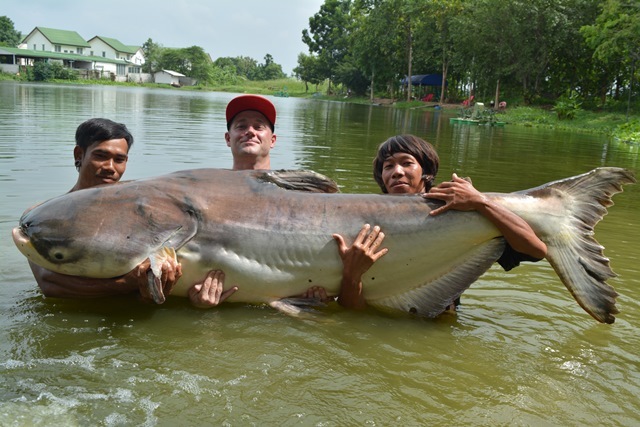 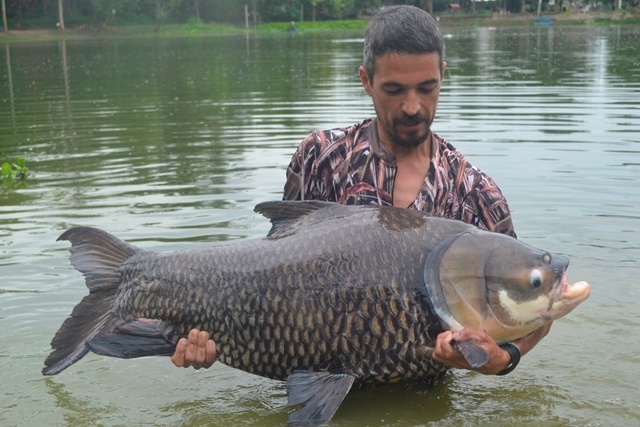 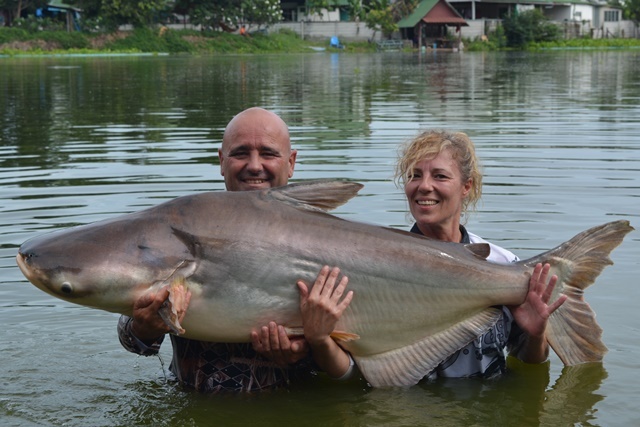 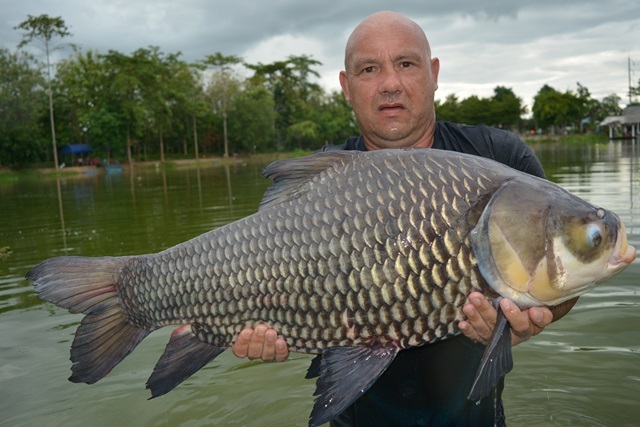 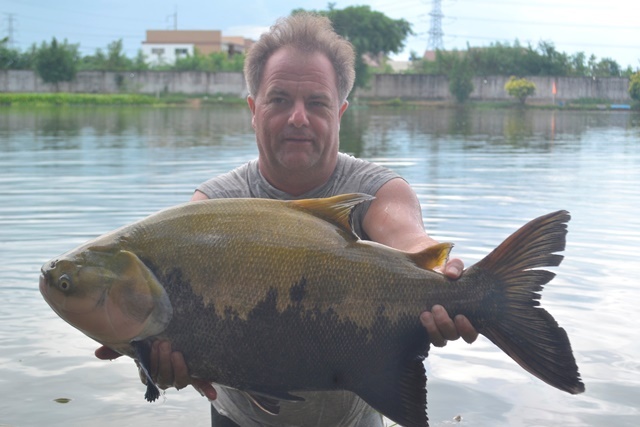 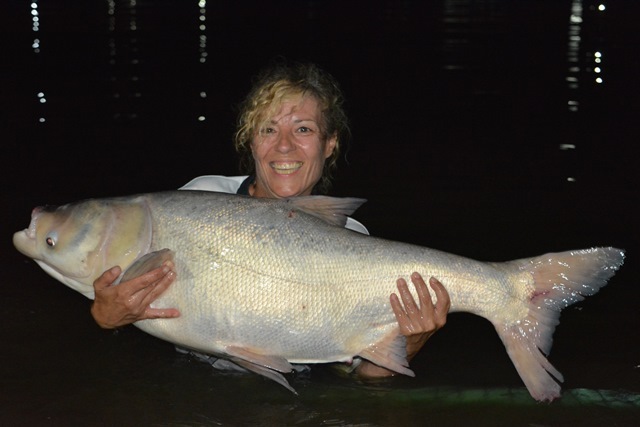 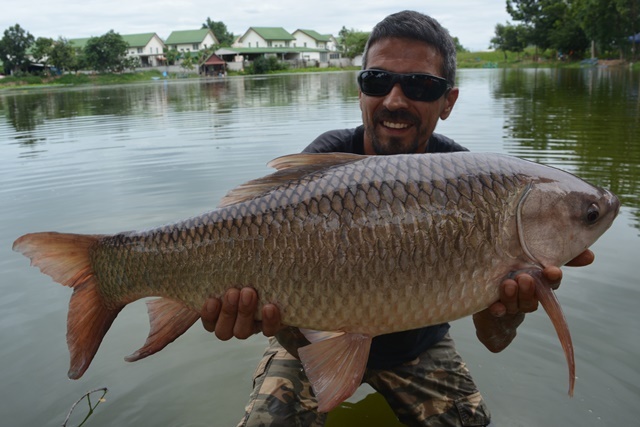 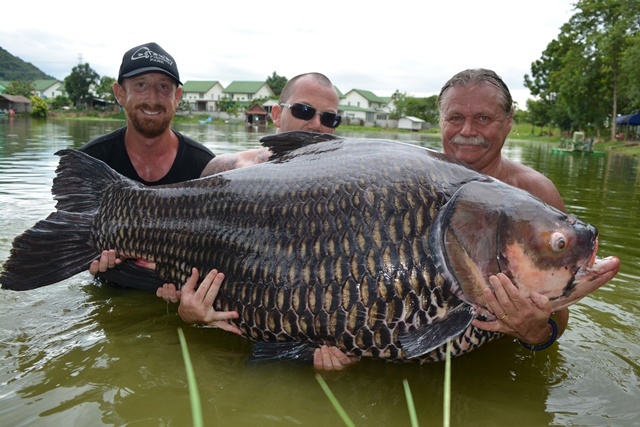 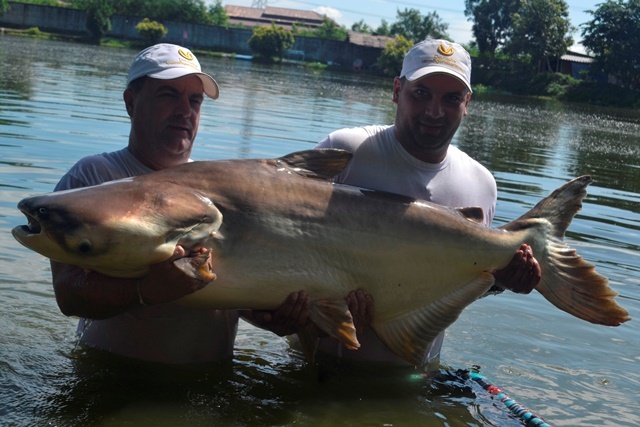 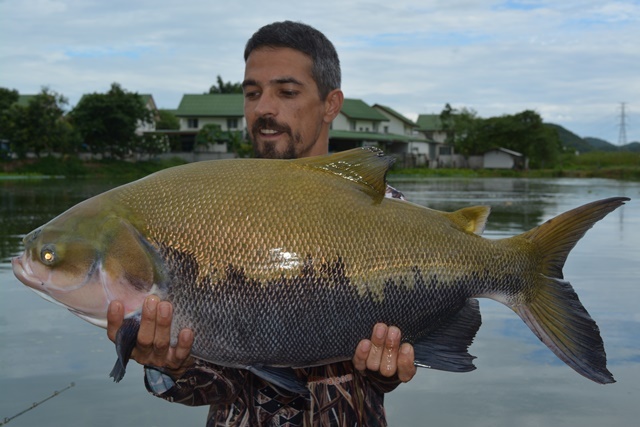 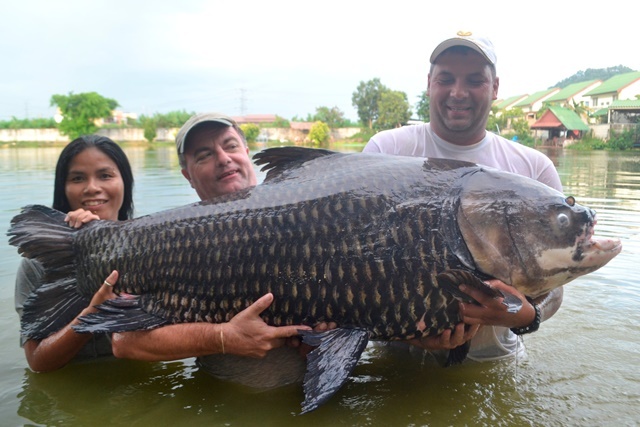 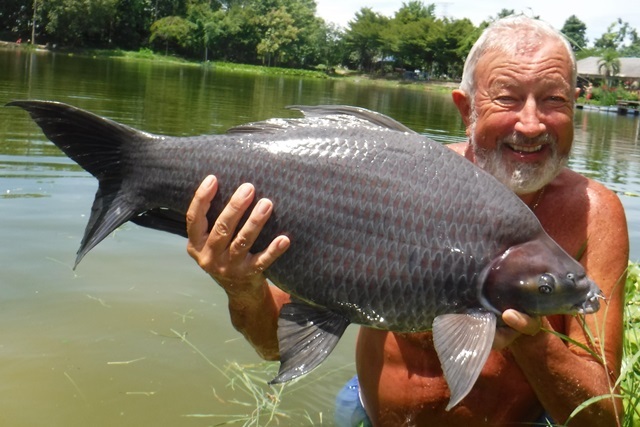 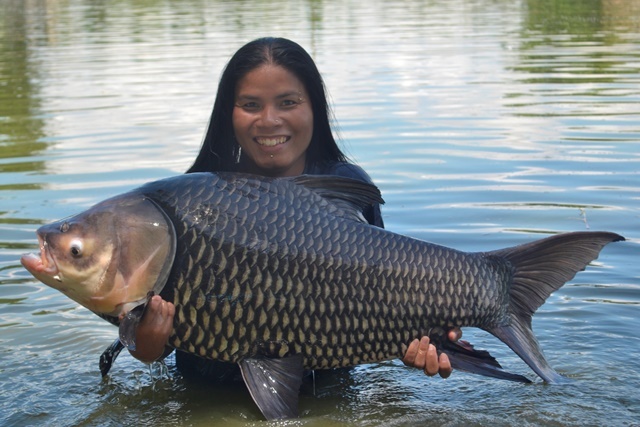 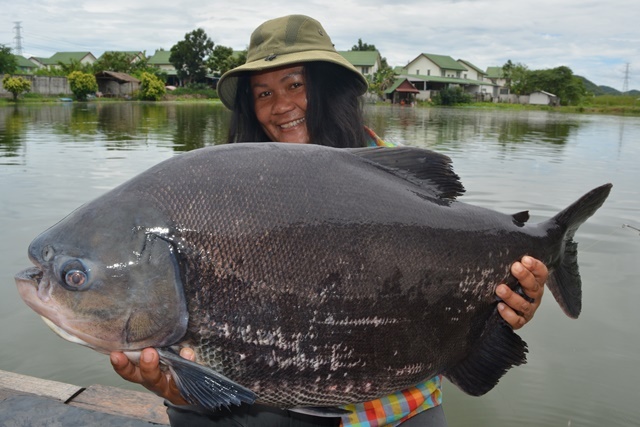 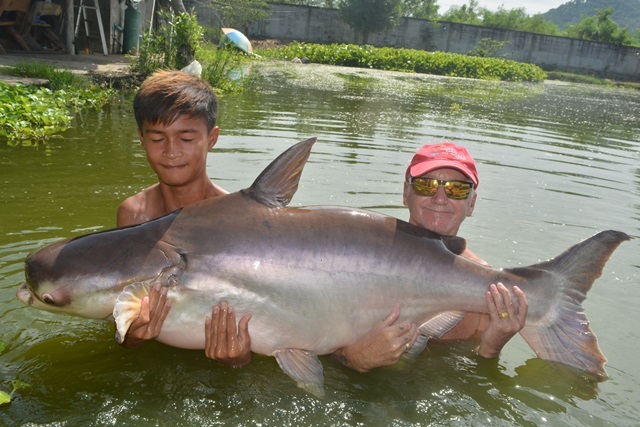 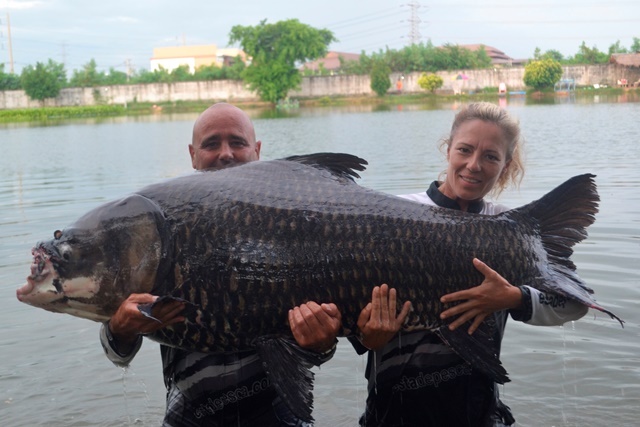 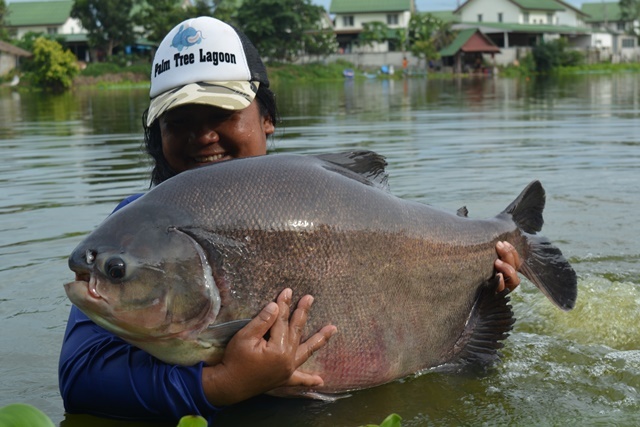 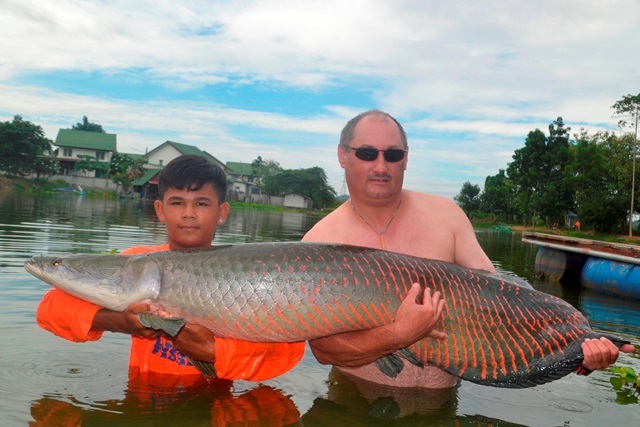 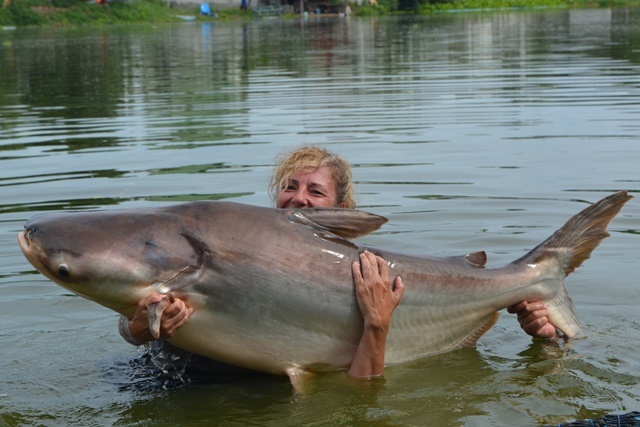 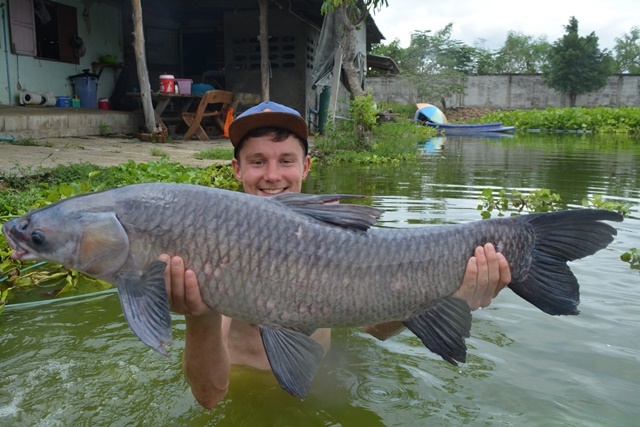 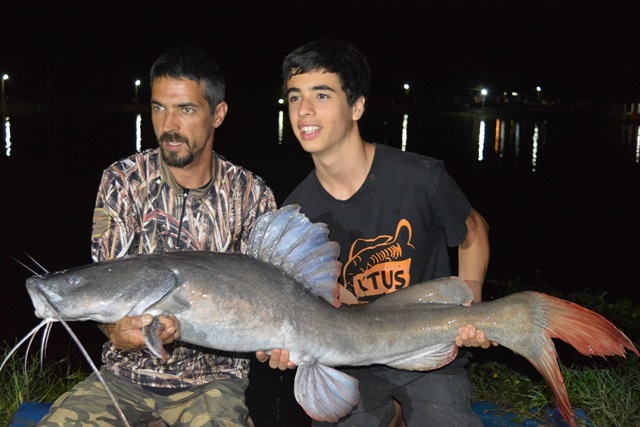 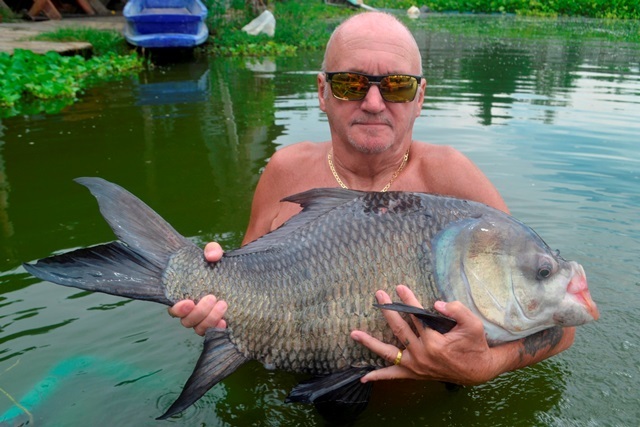 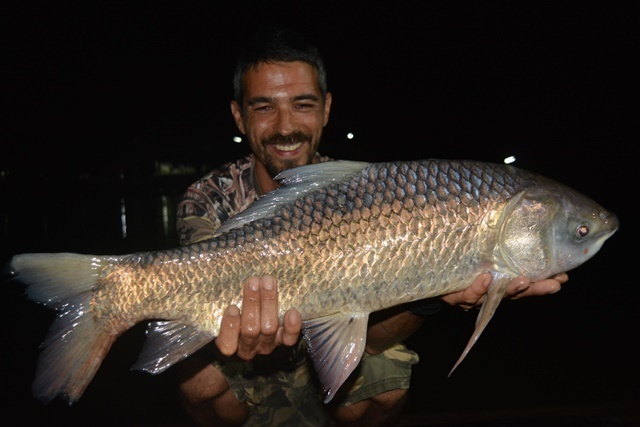 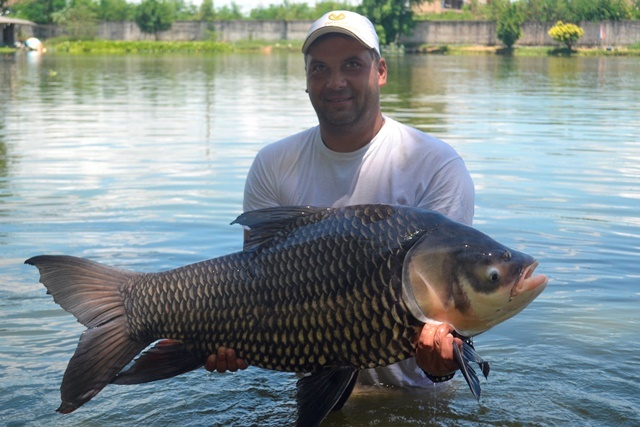 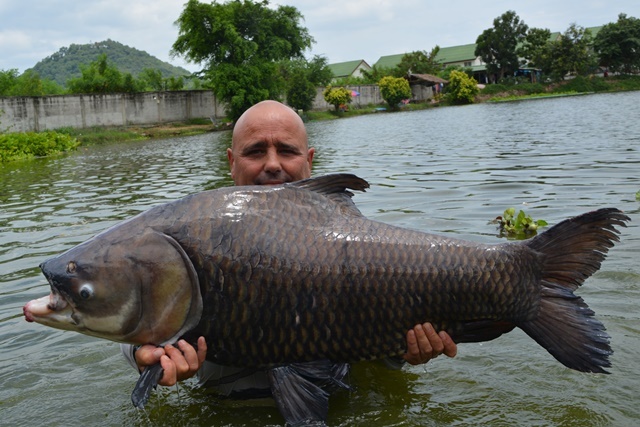 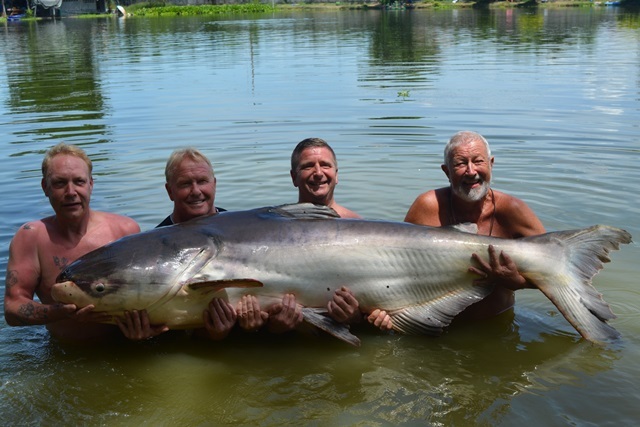 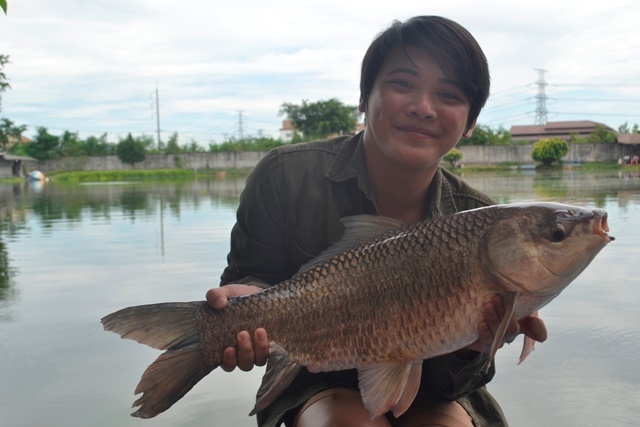 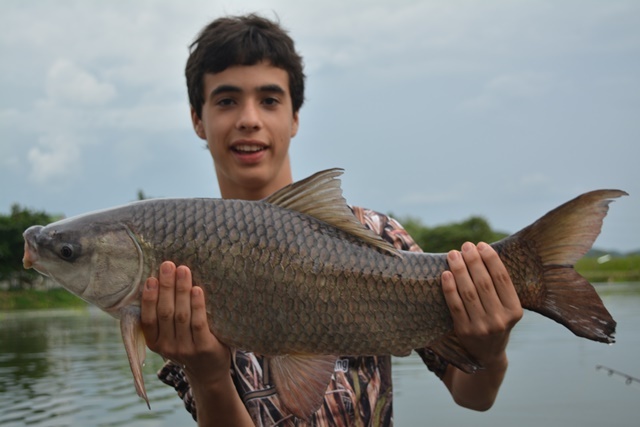 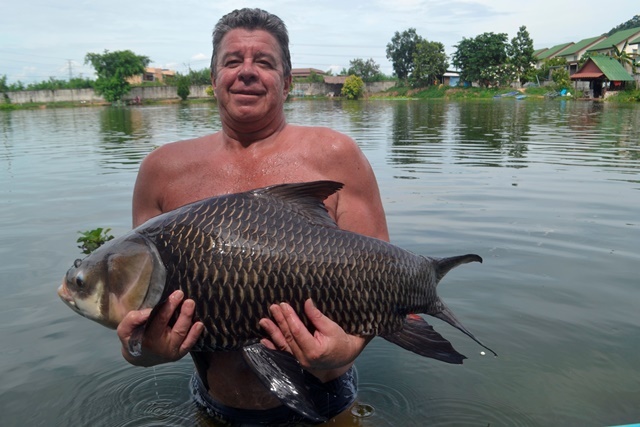 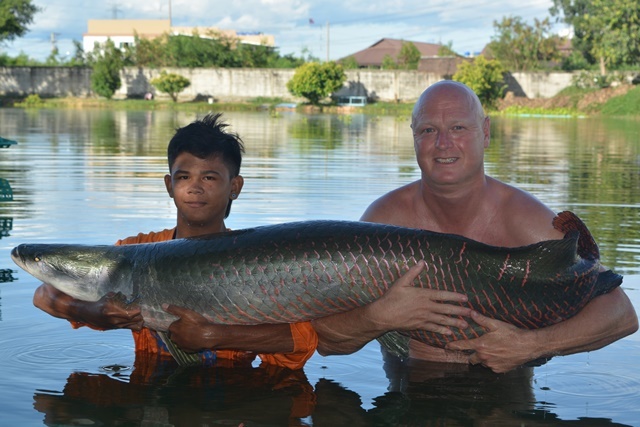 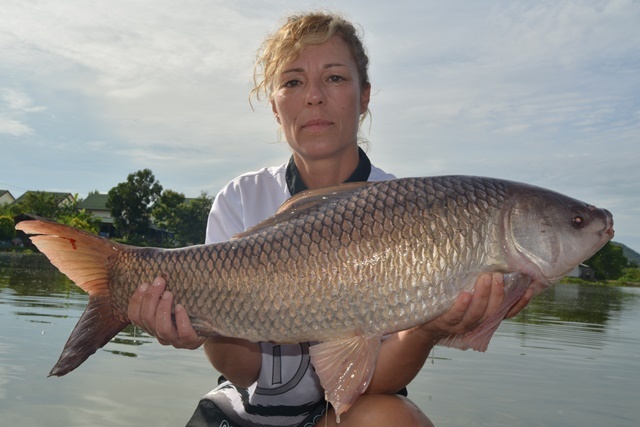 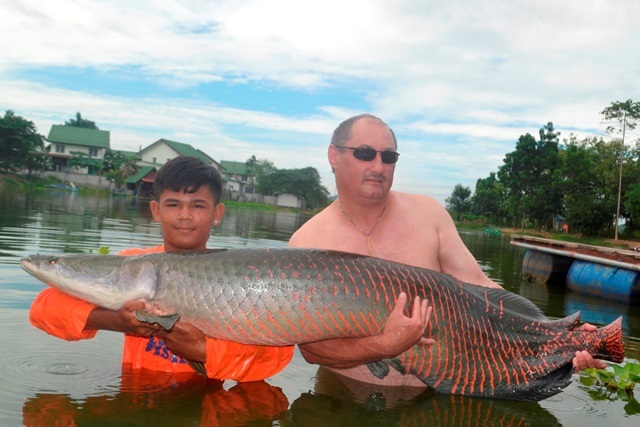 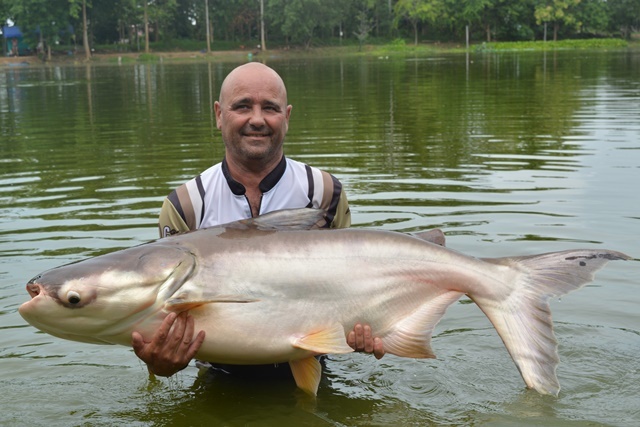 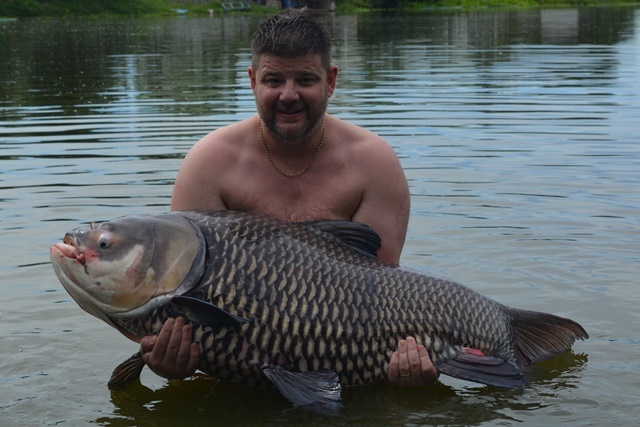 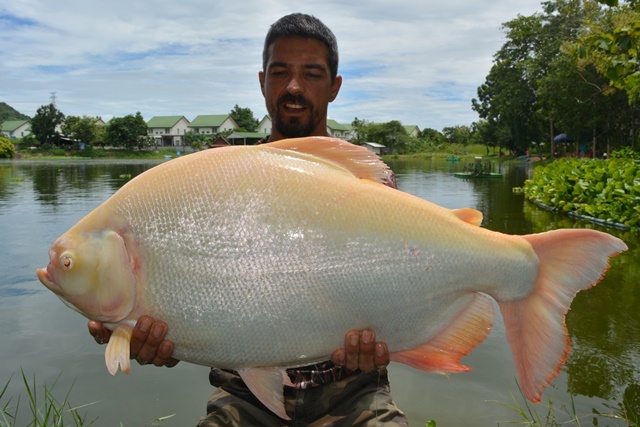 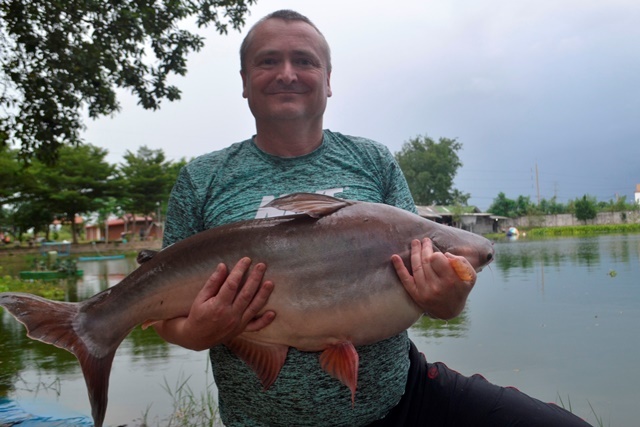 These included one of the biggest catla carp caught for years, as well as a huge alligator gar and Siamese carp to over the 100lb mark, a very impressive Chinese silver carp as well as wallago attu and black shark minnow. 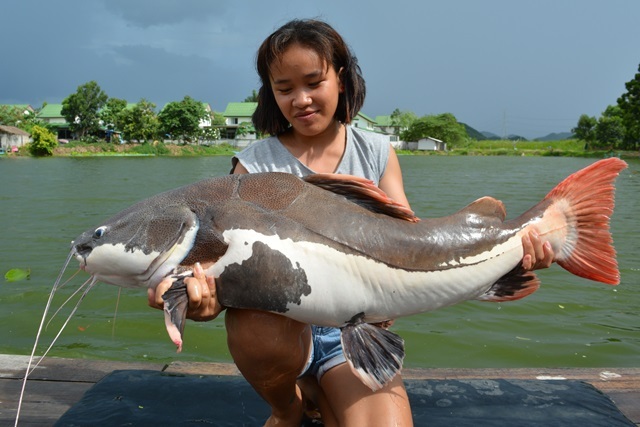 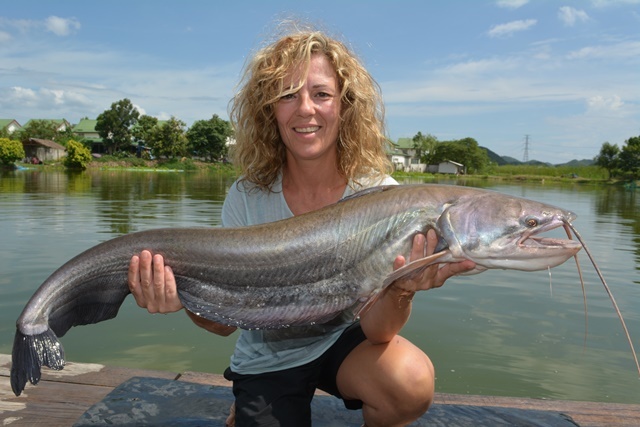 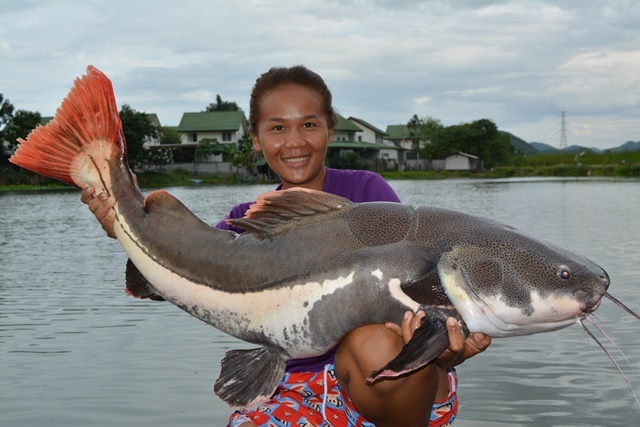 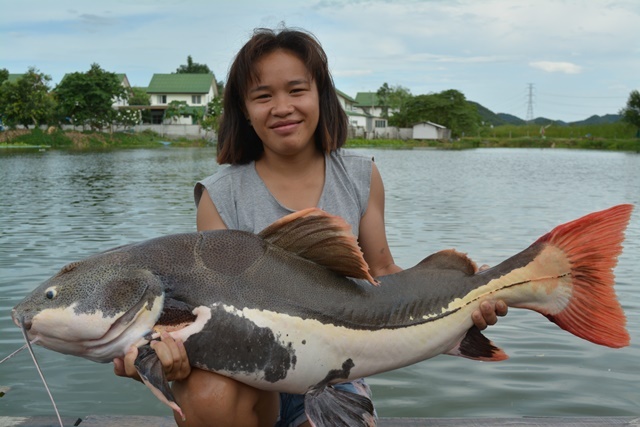 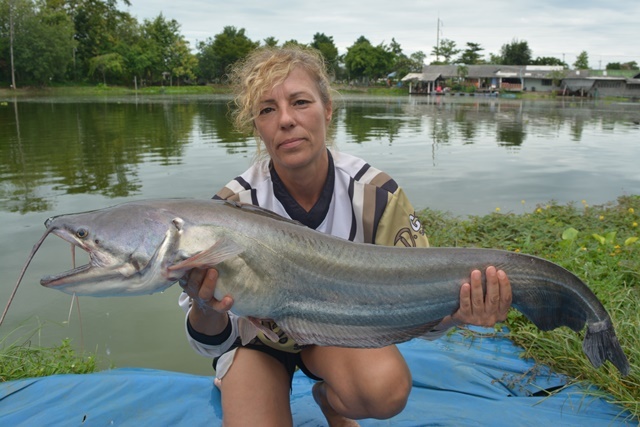 She also caught Mekong catfish, big-Y catfish, arapaima, yellow catfish, striped catfish, Juliens golden price carp, clown featherback, rohu, Chinese grass carp, chao phraya catfish, vundu catfish, as well as numerous Thai and Amazon redtails. 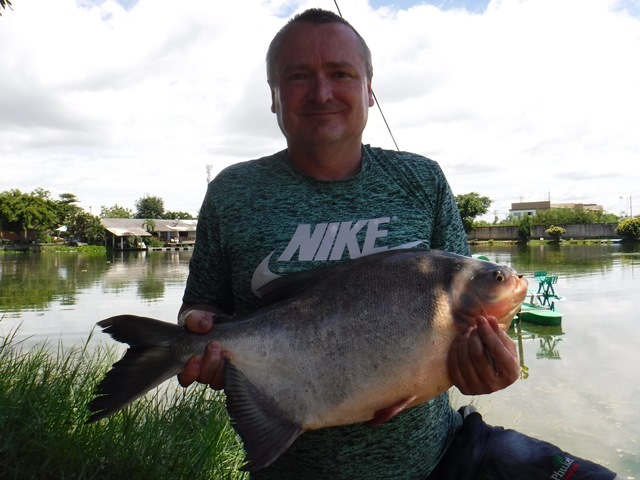 Spanish angler Dario Cast was another angler to successfully join the Palm Tree Lagoon 150lb+ Carp Club on his first visit. 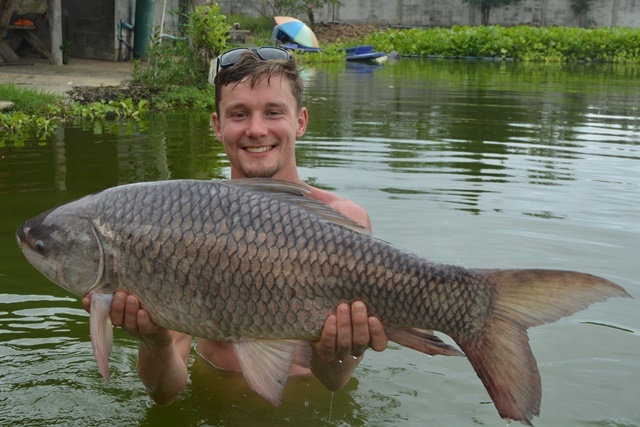 Over the week long session he caught a huge number of varying species that included a superb Chinese bighead carp, a very impressive bearded labeo, arapaima, alligator gar, tambaqui, Juliens golden price carp, striped catfish, chao phraya catfish, rohu, big-Y catfish, Mekong catfish, mollycot, pacu, as well as both Thai and Amazohn redtails. 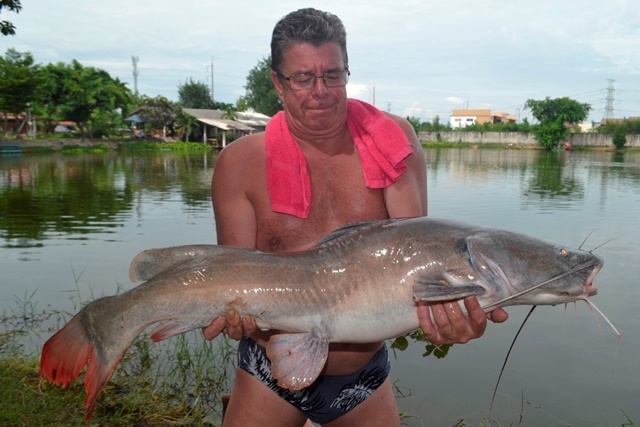 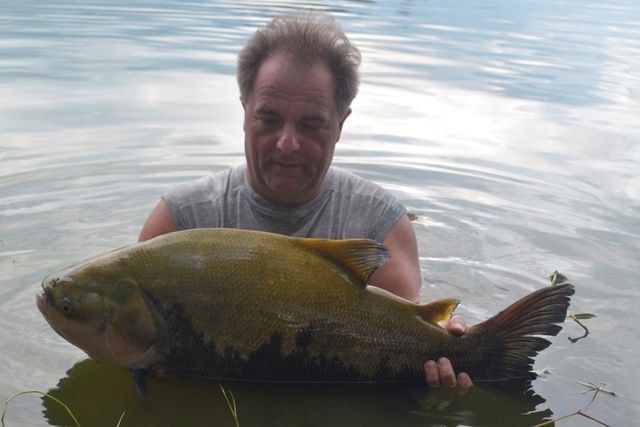 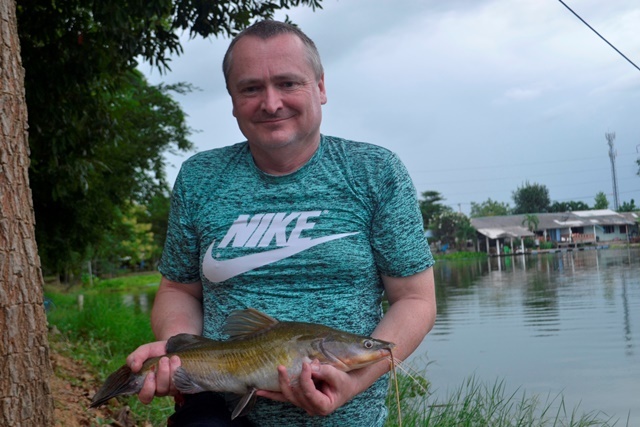 After a number of attempts Tim finally caught one of the big Siamese out of a nearby lake in Bang Pong after a 90 minute nail biting battle. 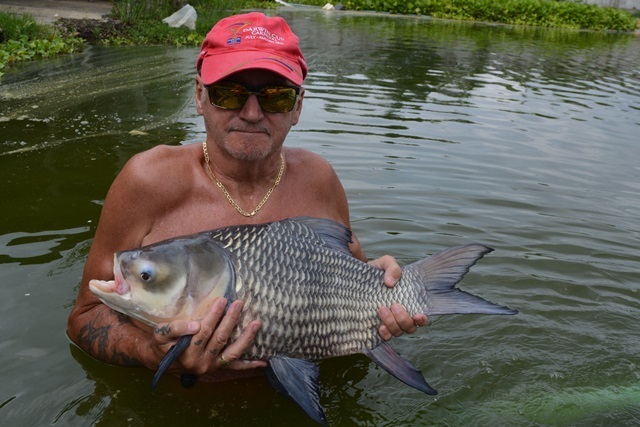 The more than awesome carp was then purchased and relocated to Palm Tree Lagoon. 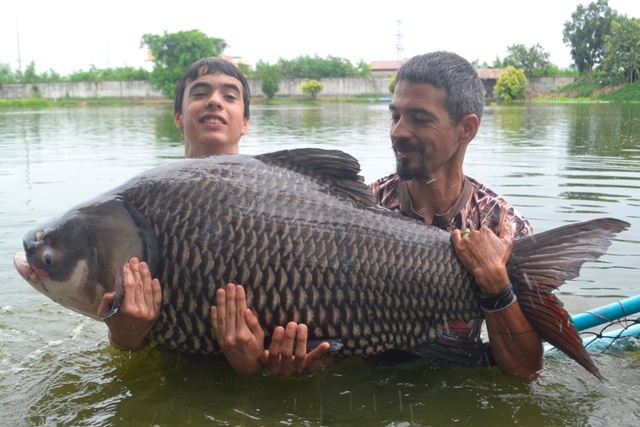 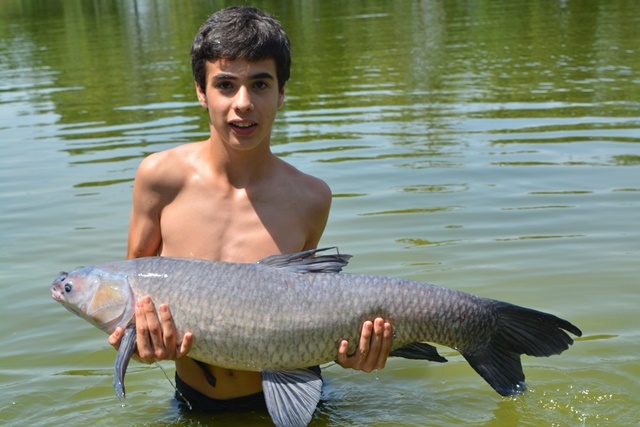 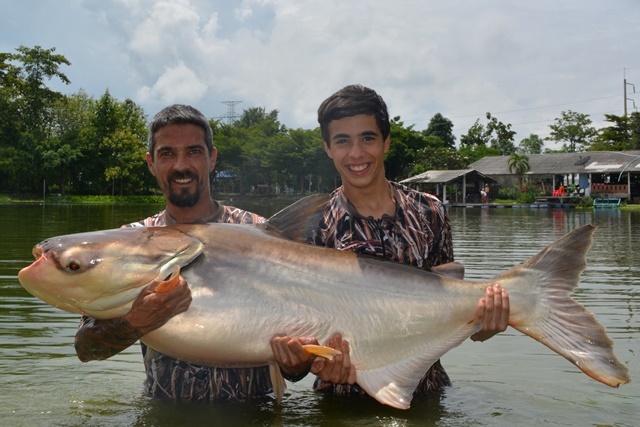 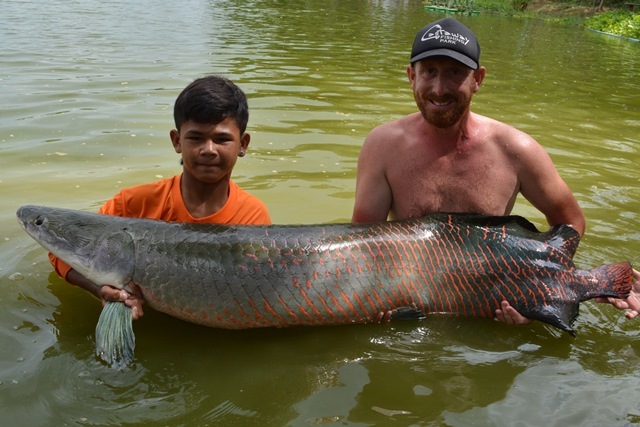 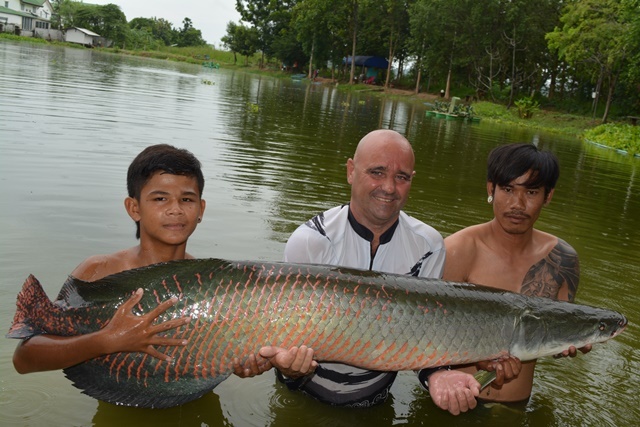 Spanish angler Iban Villarroya Domingues and his son had an amazing week as Palm Tree joining the Palm Tree 400lb+ arapaima club in the process with the lakes biggest inhabitant a 500lb+ arapaima that hadn't been caught since 2007. 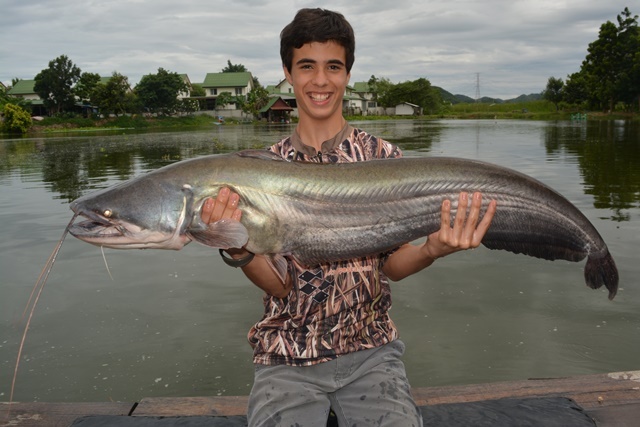 In addition to this more than awesome catch they also caught a huge variety of other species that included Siamese carp to over a 120lb, a superb Chinese black carp, black shark minnow, albino pacu, Mekong catfish, tambaqui, striped catfish, wallago attu, rohu, spotted fearherback, yellow catfish, African walking catfish, and numerous of both Amazon and Asian redtails. 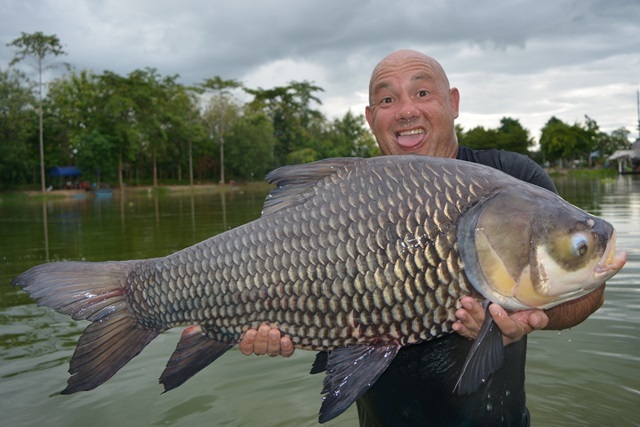 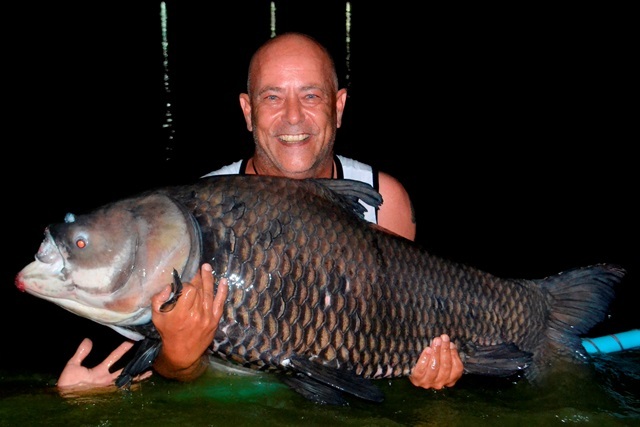 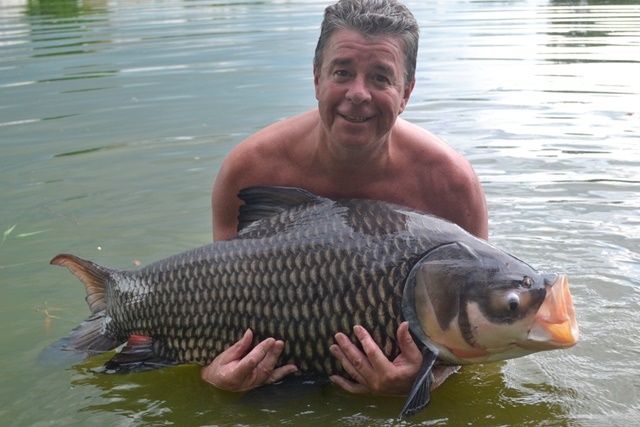 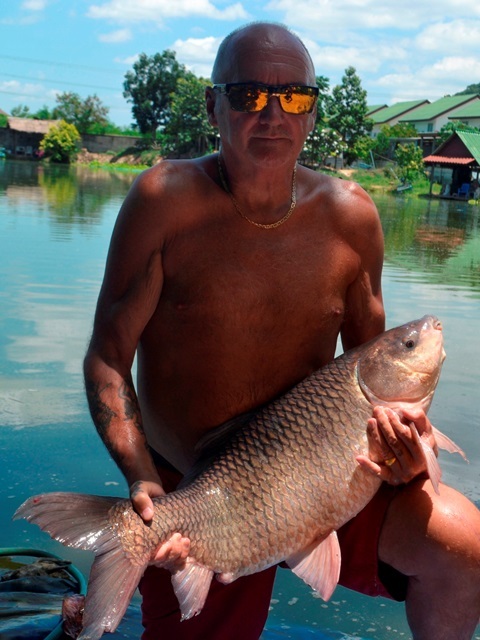 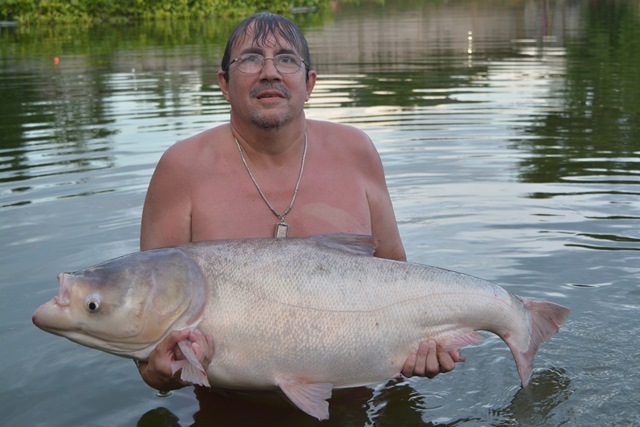 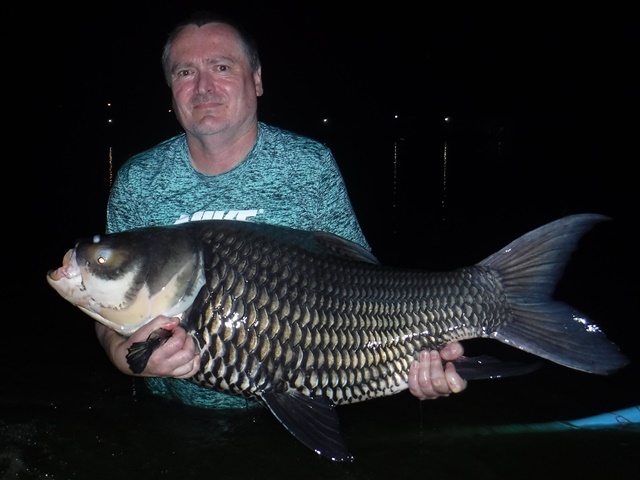 Pattaya resident Peter Butler made the journey down for another session and it wasn't long before he joined the list of Palm Tree Lagoon 150lb+ BIG Carp Club members with an awesome 170lb+ Siamese. 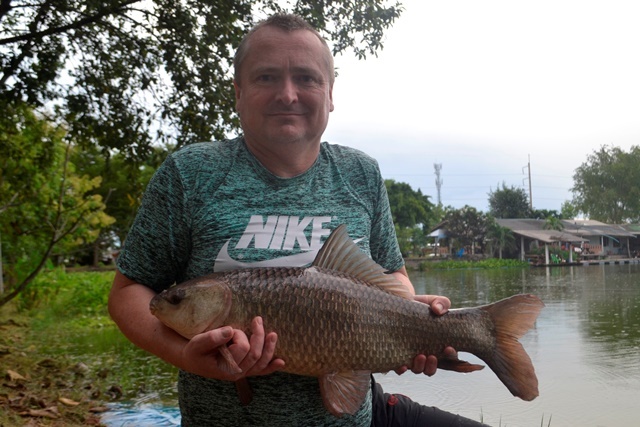 In addition he had some fantastic other catches that included rarely caught small scale mud carp and catla carp, as well as Chinese bighead carp, Mekong catfish, rohu, and both Asian and Amazon redtails. 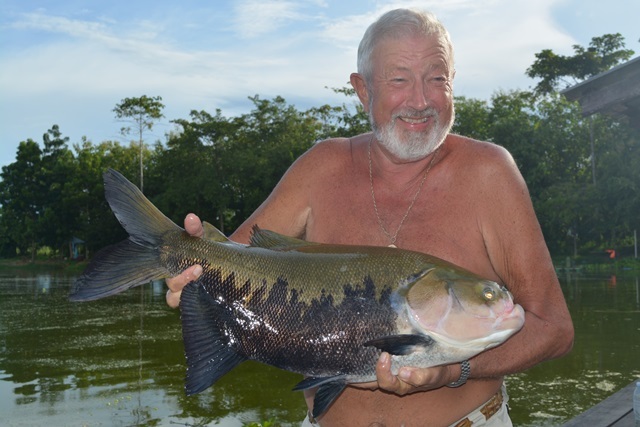 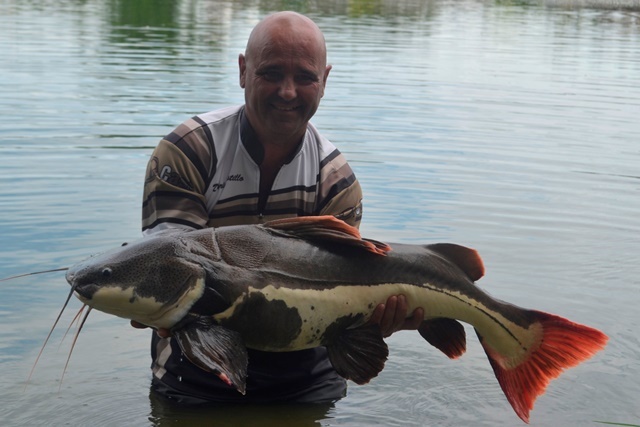 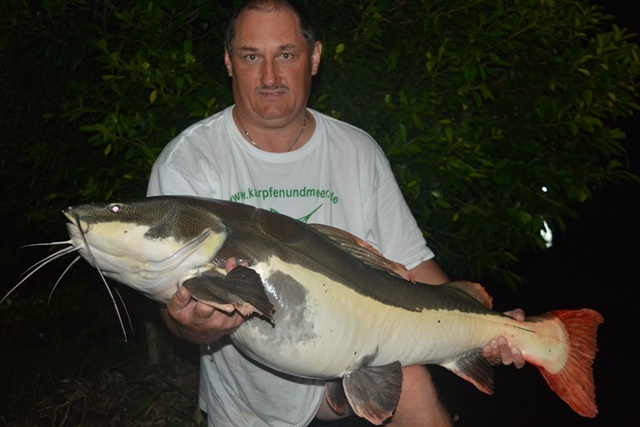 German angler Peter Bretschneider returned after a two year break and was immediately in the thick of things as he joined the Palm Tree Lagoon 300lb+ Catfish Club after an exhausting two hour battle. 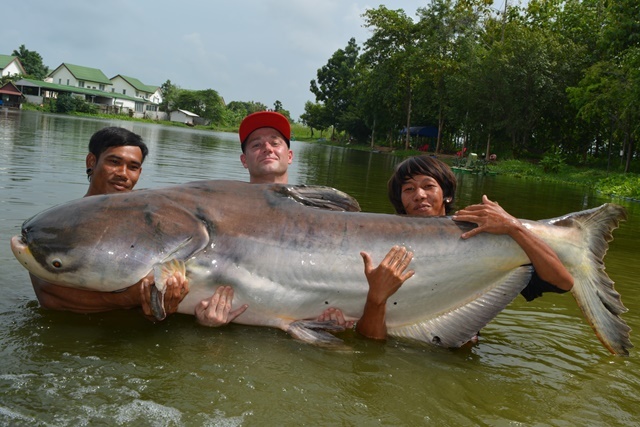 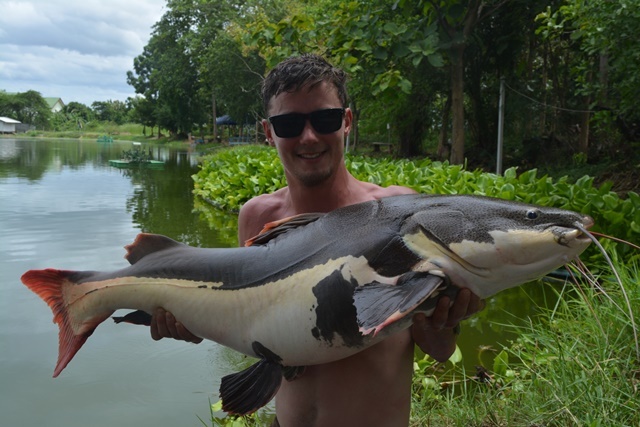 However, this was topped by him catching an awesome 70lb rare Salween catfish. 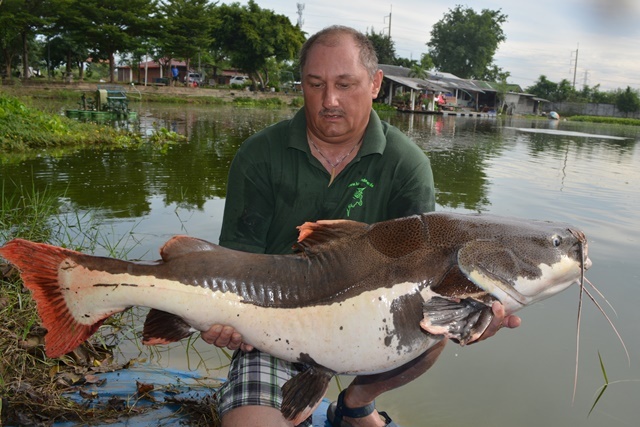 In addition he caught a myriad of other species such as Juliens golden price carp, ripsaw catfish, rohu, wallago attu, giant snakehead, arapaima, catfish shark, striped catfish, yellow catfish, as well as both Amazon and Asian redtails. 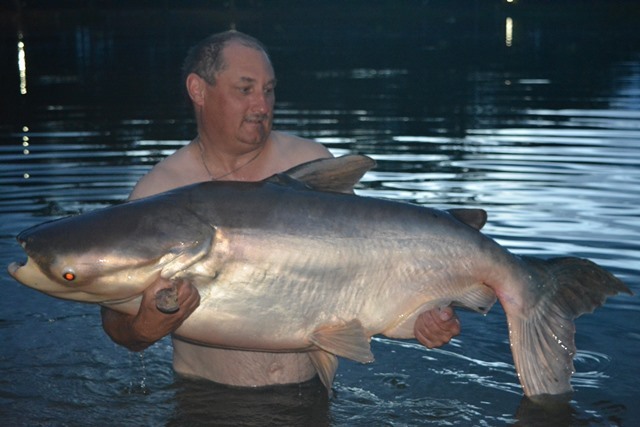 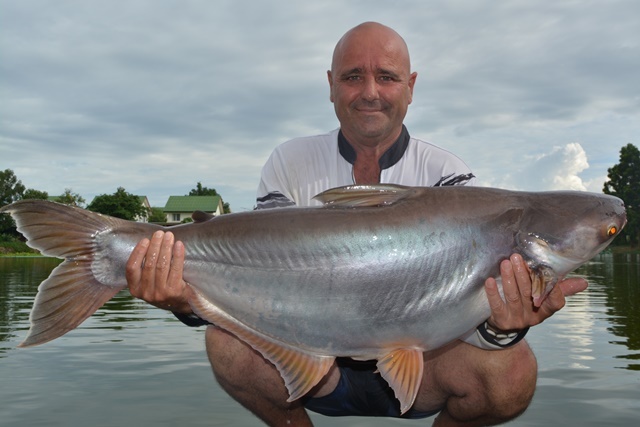 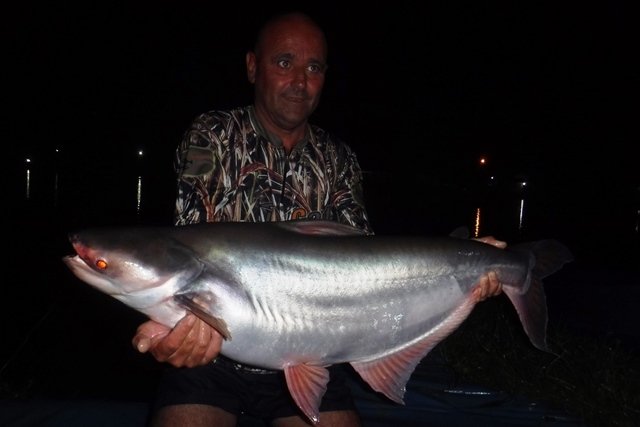 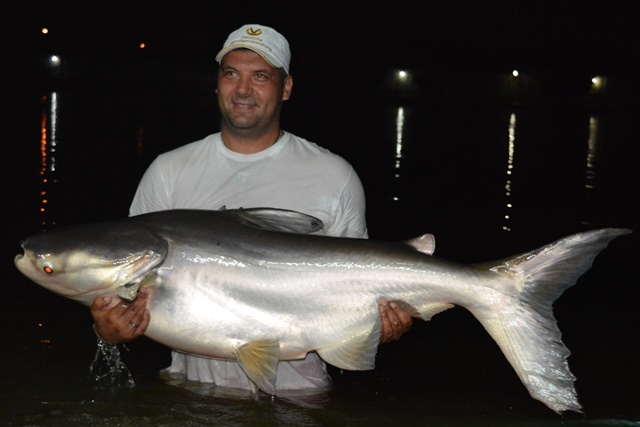 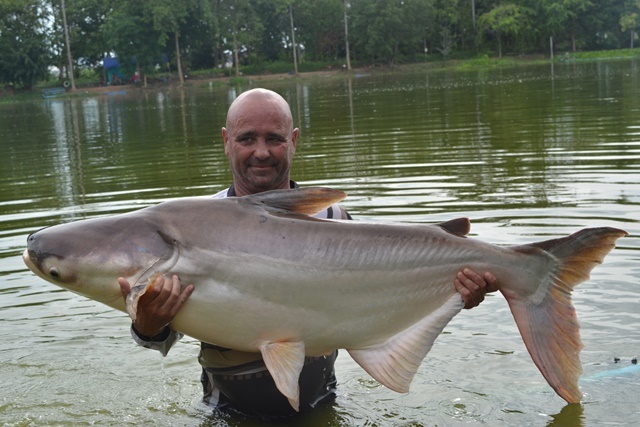 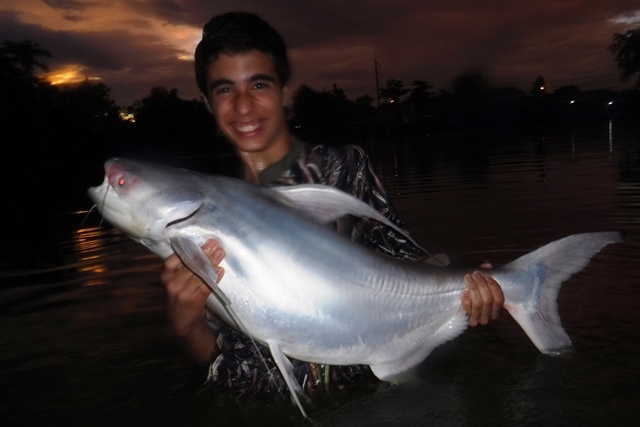 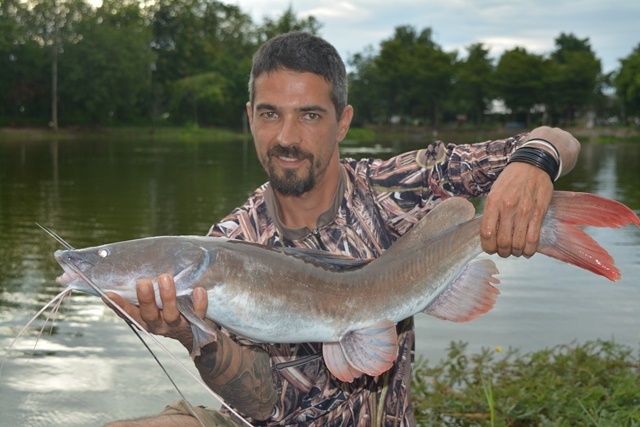 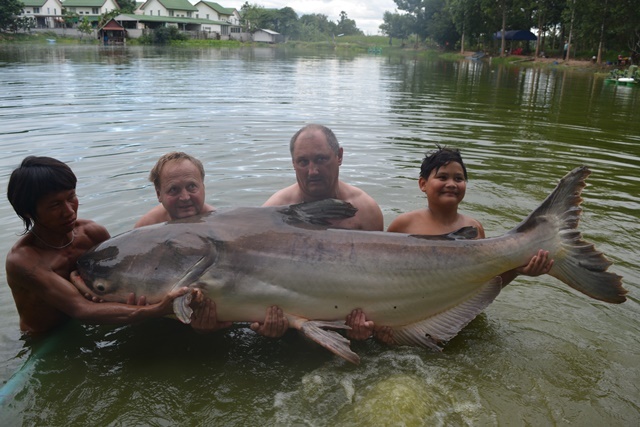 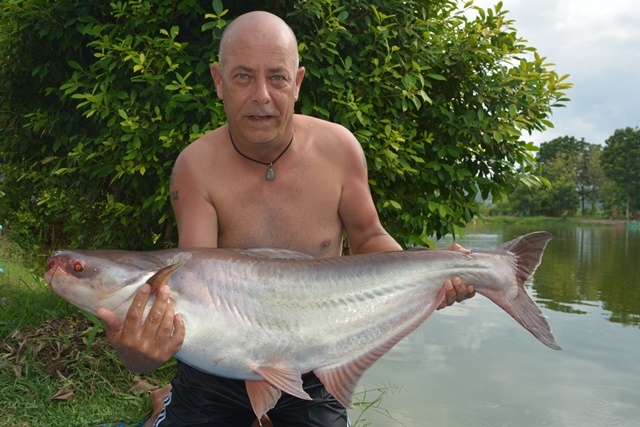 Regular Phillip Van Steeg was back with one of his fishing buddies and was soon into the fish with a rare giraffe catfish and his buddy catching an impressive Chinese silver carp. 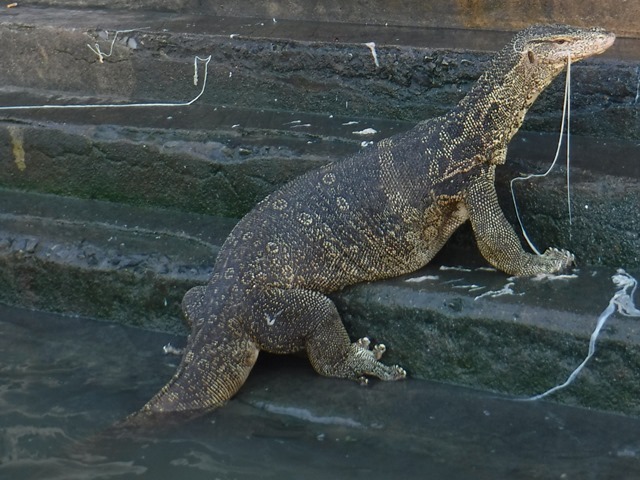 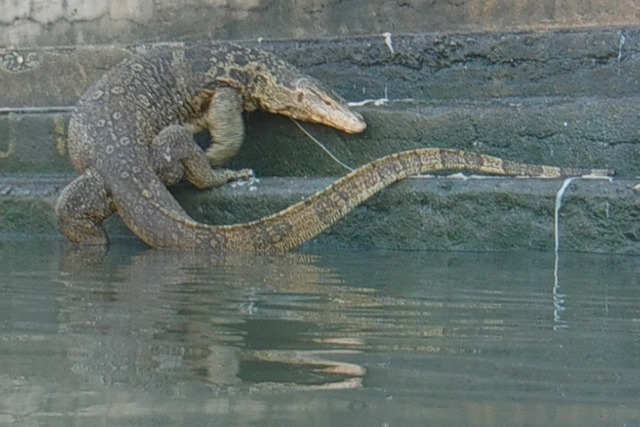 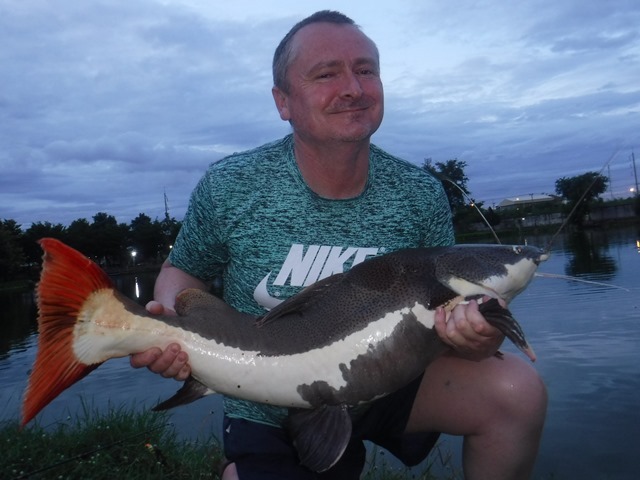 They didn't stop there though as they went on to catch arapaima, rohu, chao phraya catfish, yellow catfish as well as a number of both Thai and Amazon redtails. 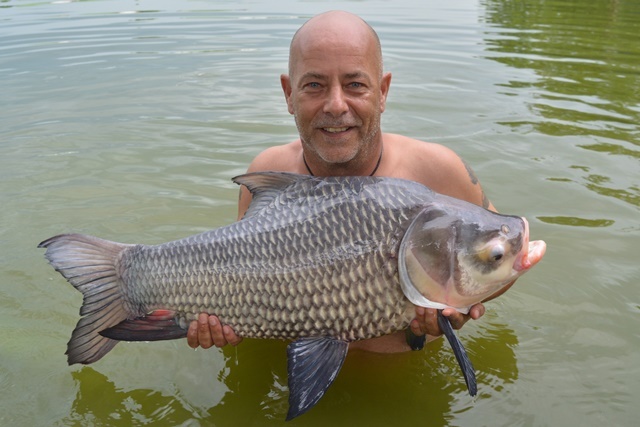 Michael Van Den Eeckhaut was another one to join one of the Palm Tree 'BIG Fish' Clubs on his first visit, this time it was the 150lb+ Carp Club with a superb 180lb Siamese carp. 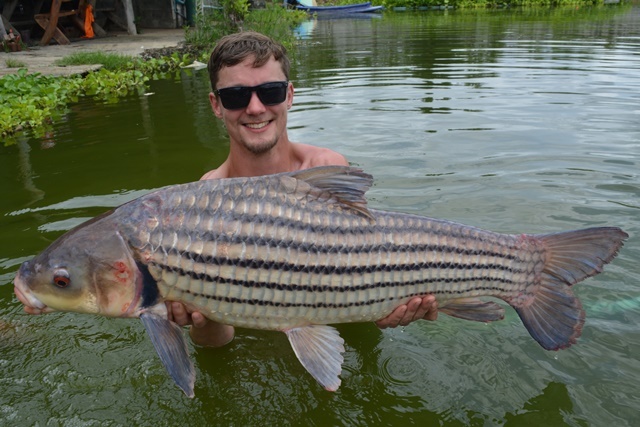 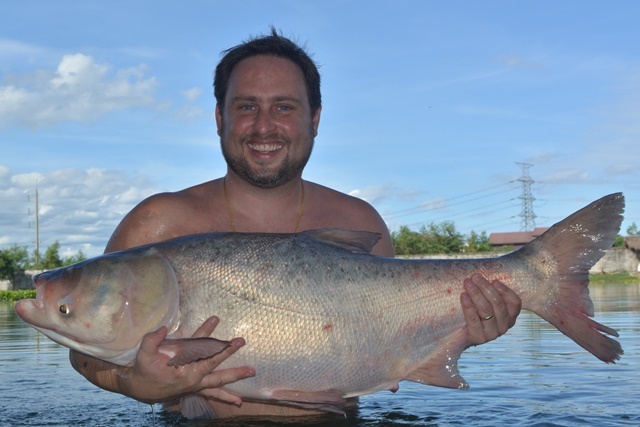 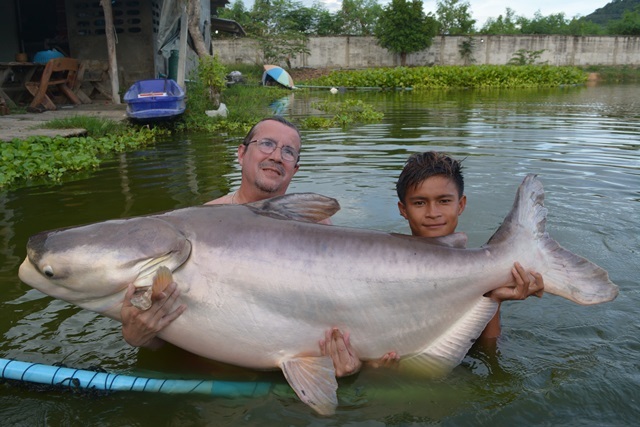 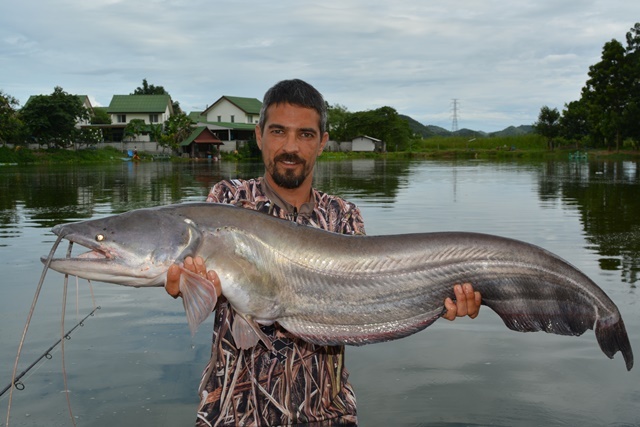 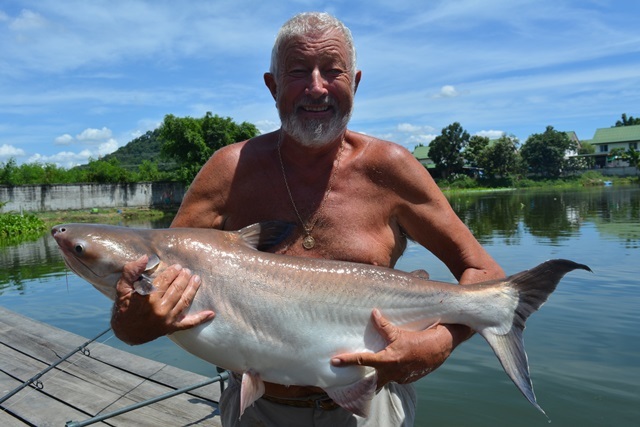 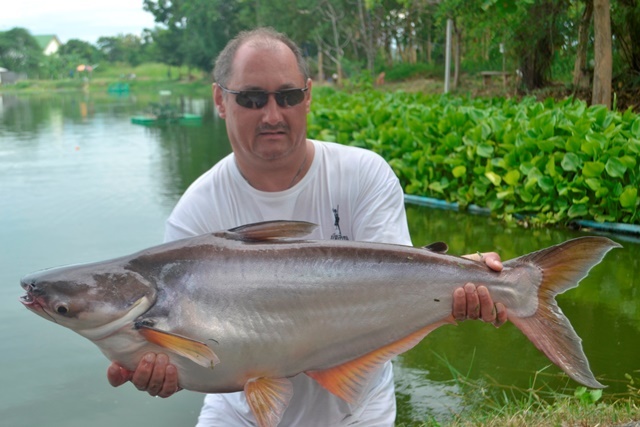 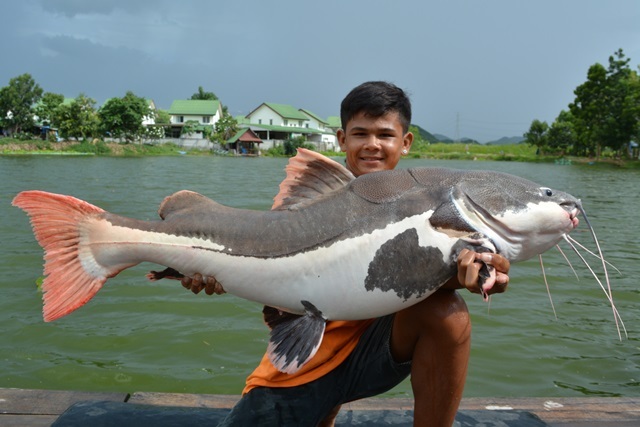 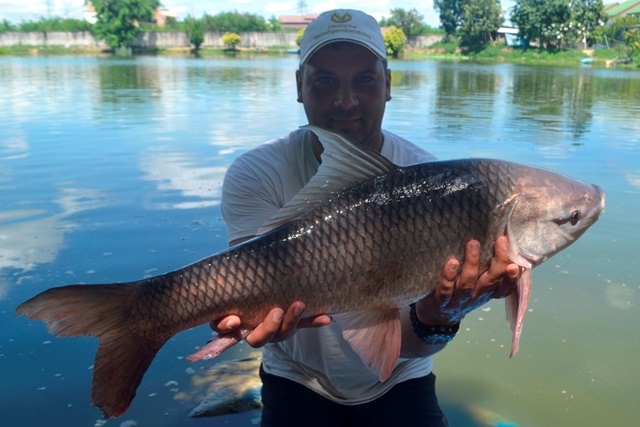 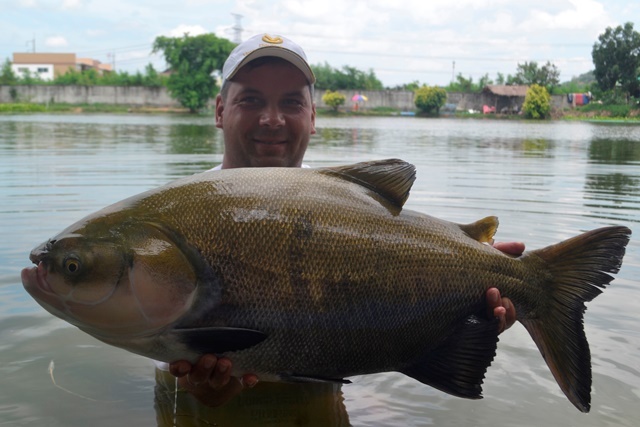 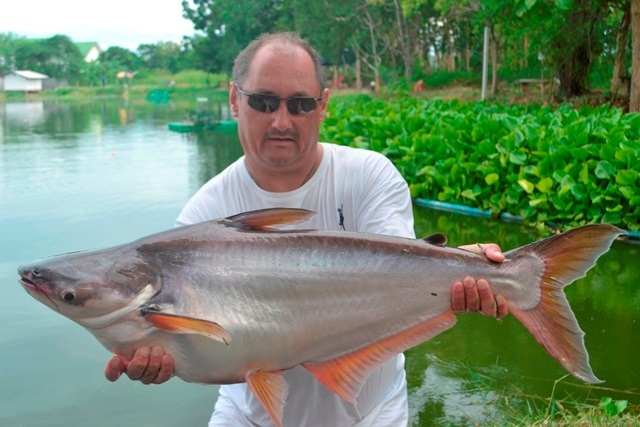 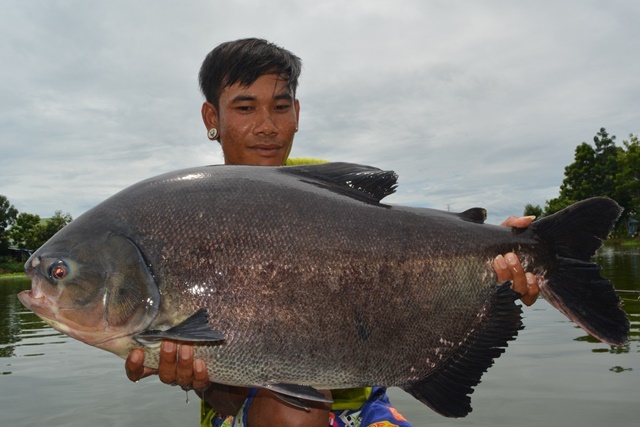 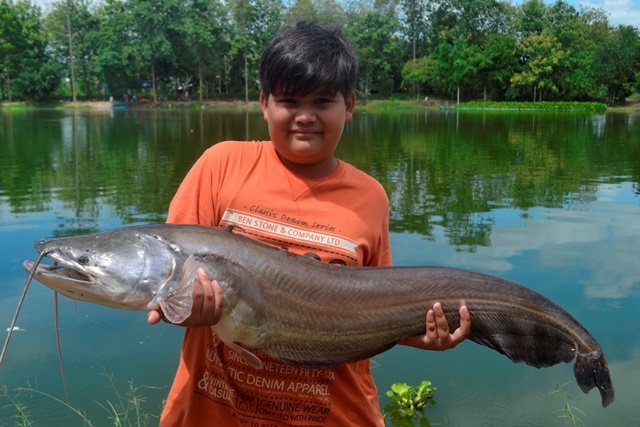 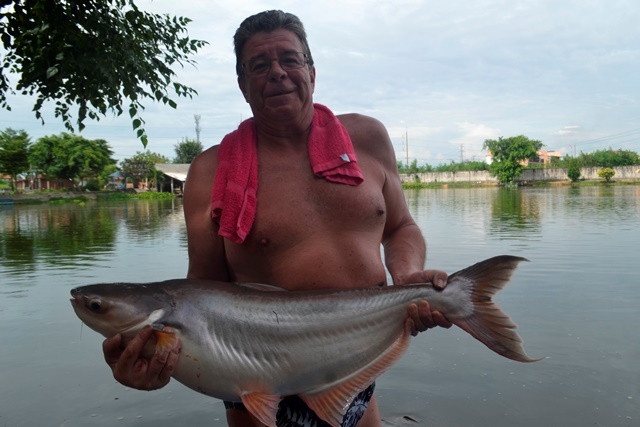 He also caught a very chunky Mekong catfish as well as a huge Chinese silver carp, In addition he had a variety of other species that included wallago attu, striped catfish, rohu, African walking catfish, as well as both Thai and Amazon redtails. 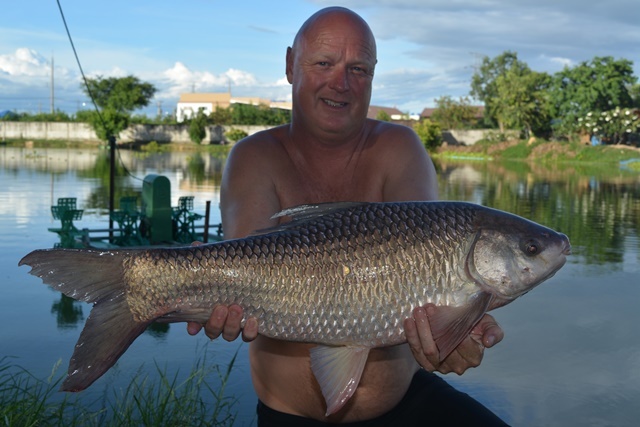 Dutch angler Ronald Megens was very impressed with his first session at Palm Tree vowing to come back next year with some friends. 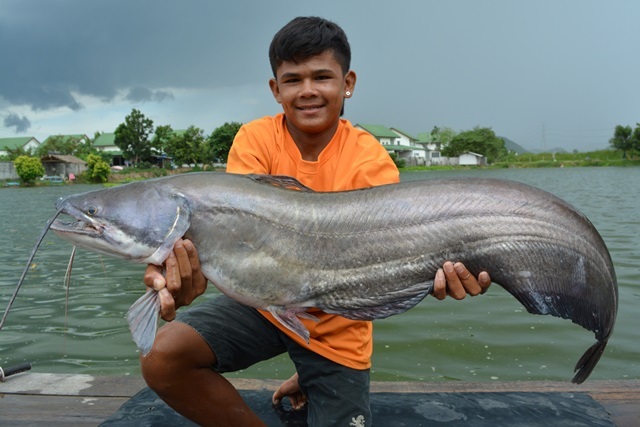 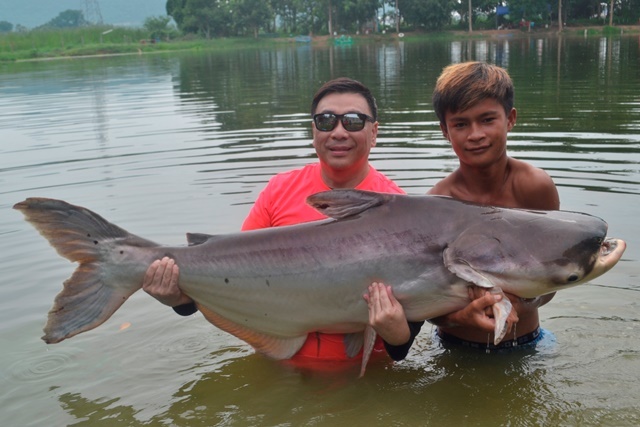 The pick of his many catches was an awesome Salween rita, but he also caught some big Thai and Amazon redtails, as well as Siamese carp, striped catfish and catfish shark. 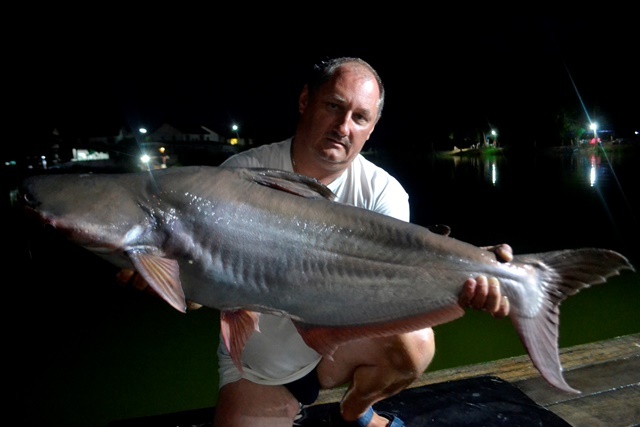 What a session first time visitor Tom Raven had not only joining the ever expanding Palm Tree Lagoon 300lb+ Catfish Club but also catching a monster alligator gar. 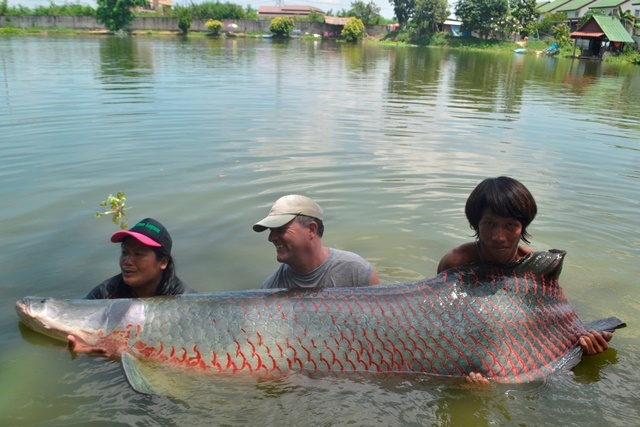 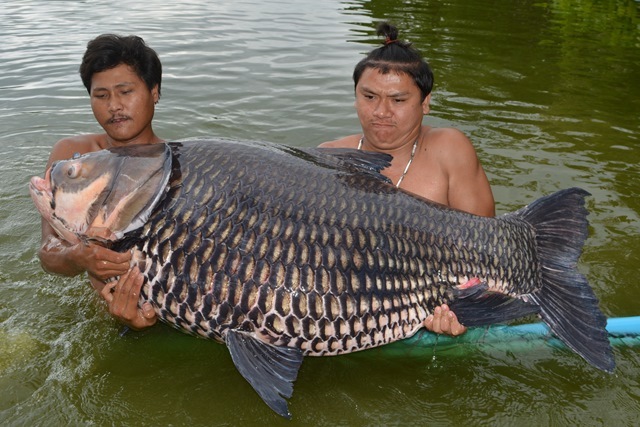 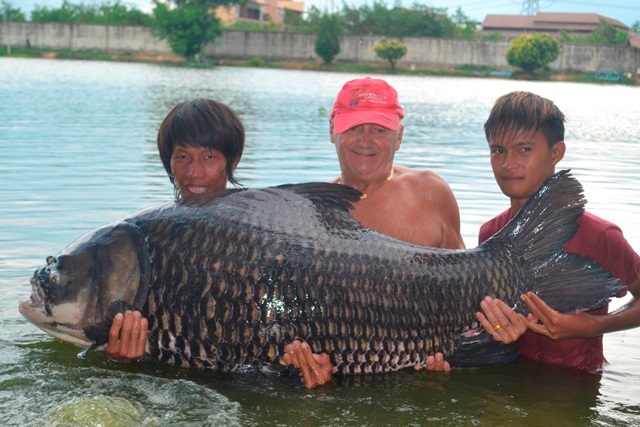 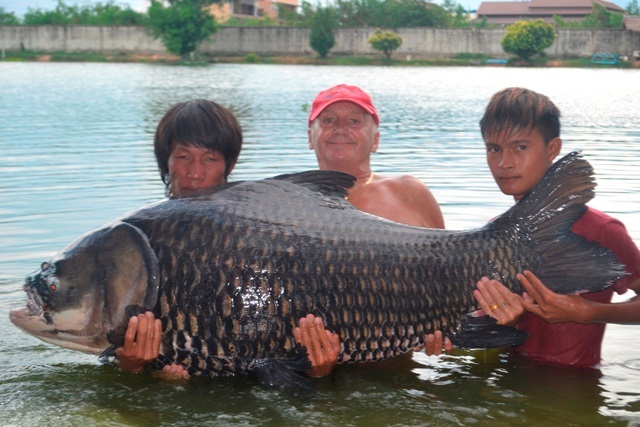 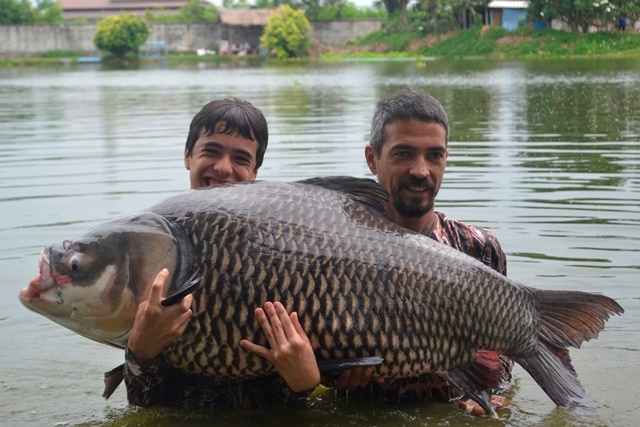 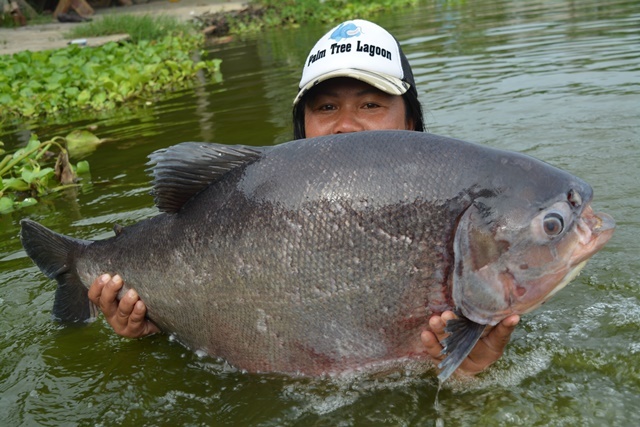 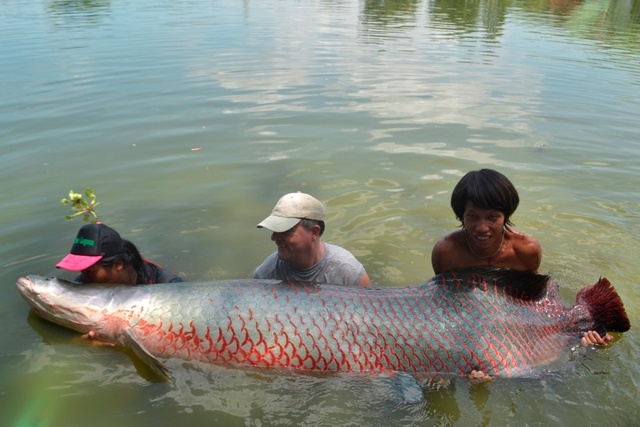 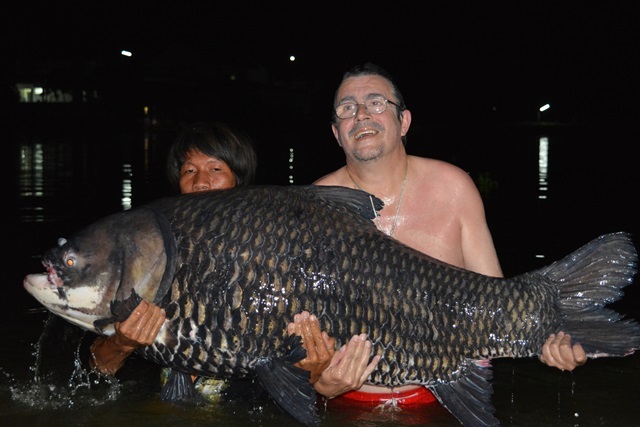 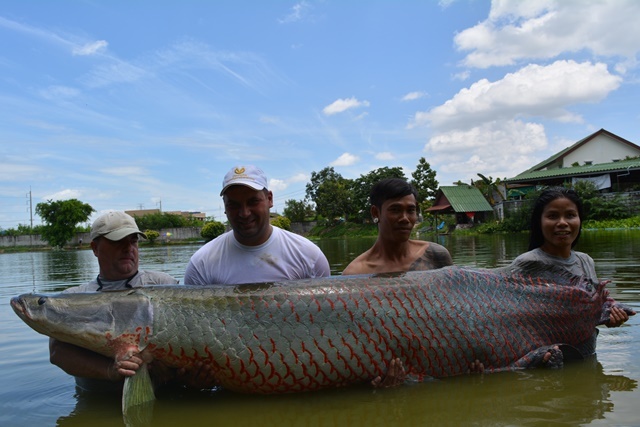 In addition to this he also caught Mekong catfish, Siamese carp, tambaqui, arapaima and Amazon redtail. 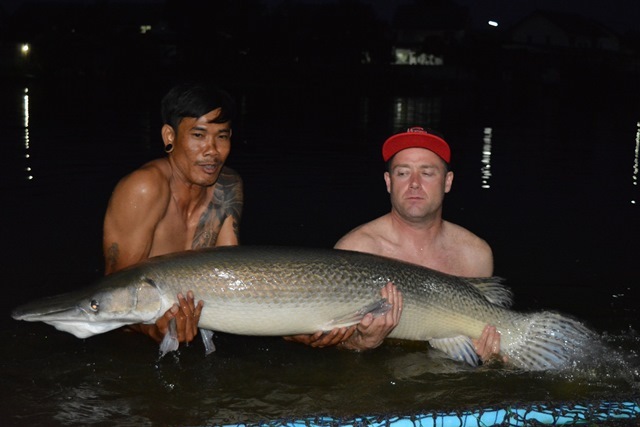 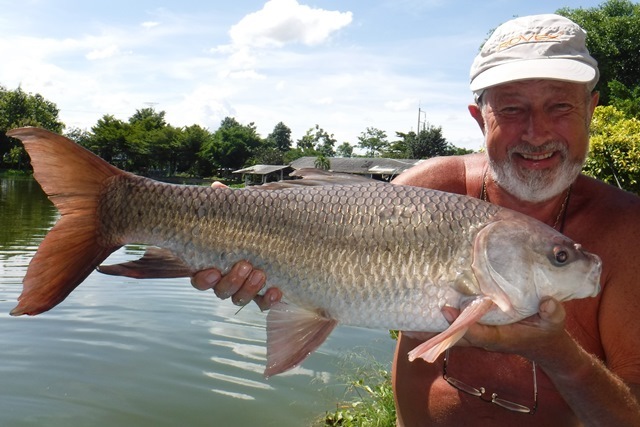 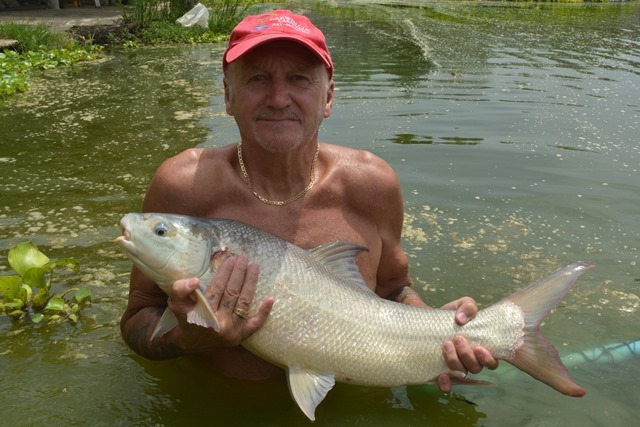 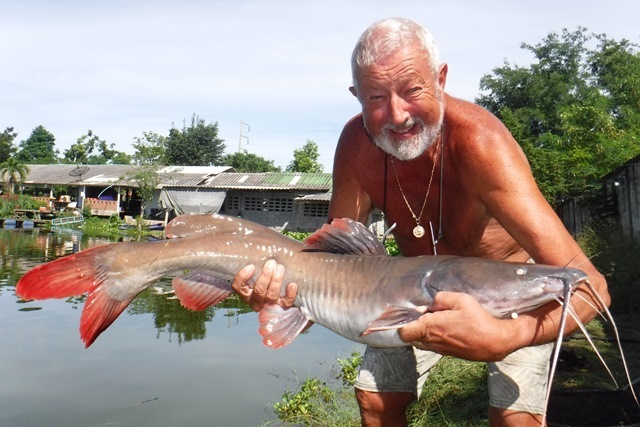 The Punch formerly known as John Harvey also made the trip up from Pattaya taking a few days off from running Castaway Fishing Park and catching a number of his favourite species rohu as well as a monster pb alligator gar and a huge mollycot. 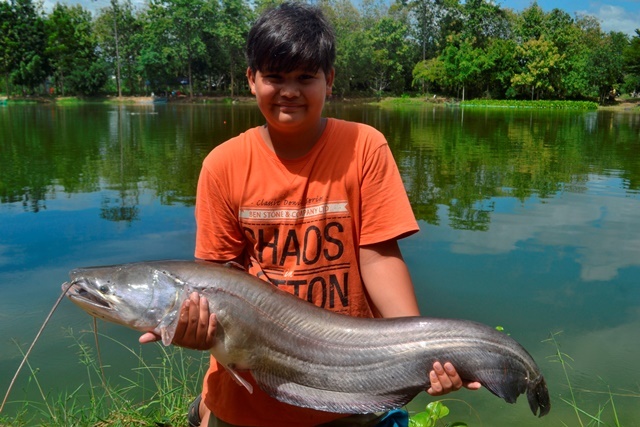 He also caught a new species for him in the shape of a lake record elephant ear gourami, as well as wallago attu, a pb tambaqui, catfish shark, arapaima, striped catfish and both Asian and Amazon redtail. 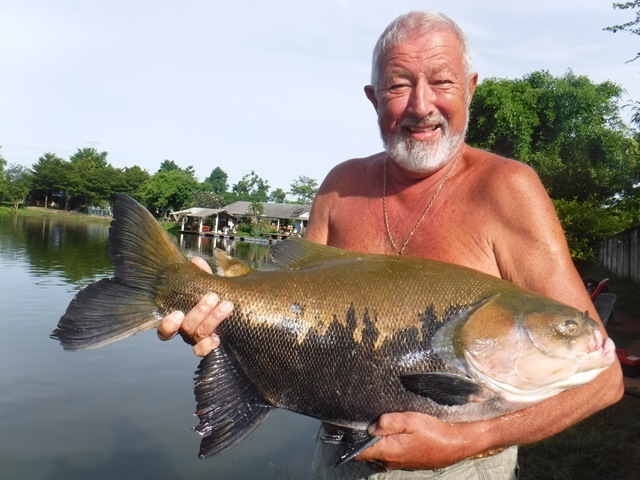 Another angler whose name eludes me enjoyed his session that was topped off by a 130lb+ Siamese carp as well as a truly awesome black shark minnow. 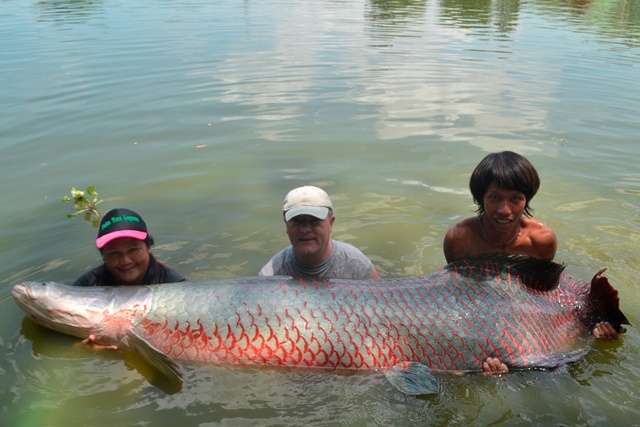 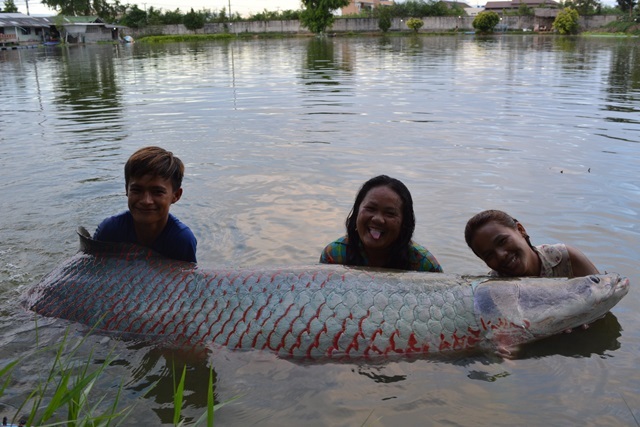 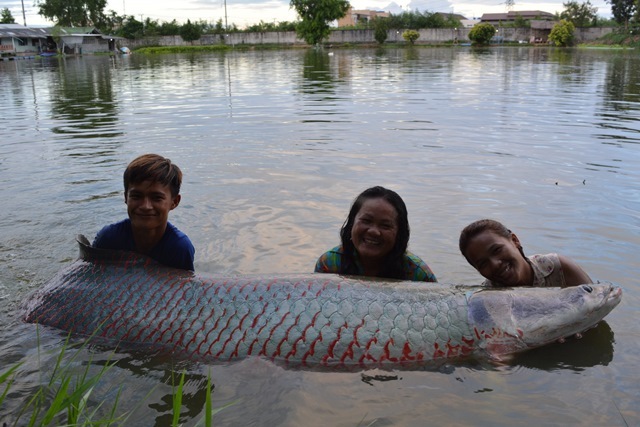 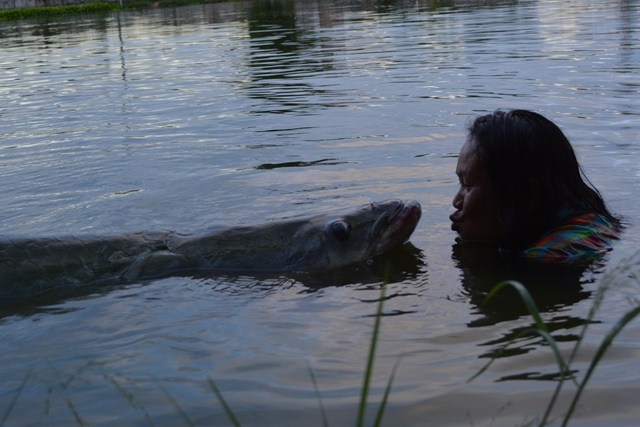 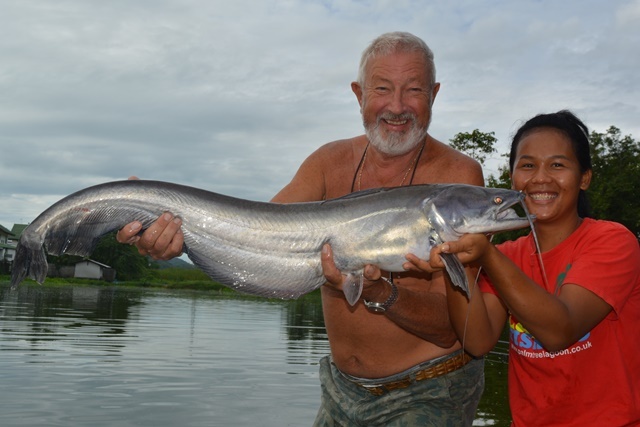 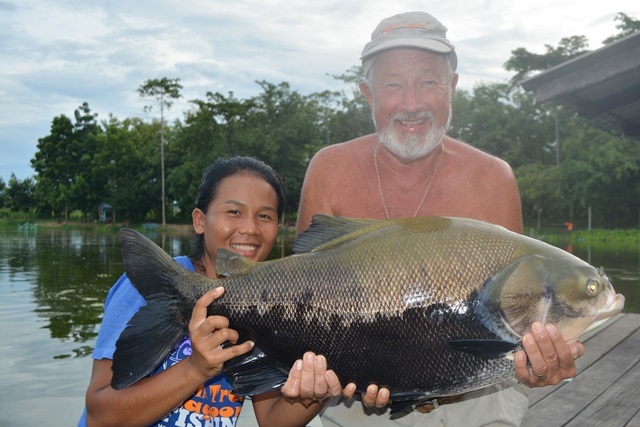 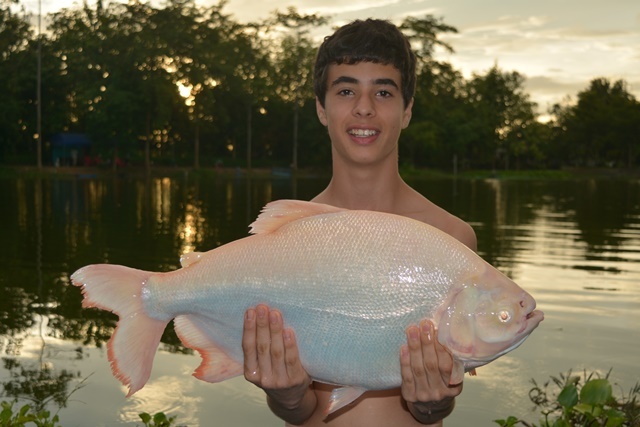 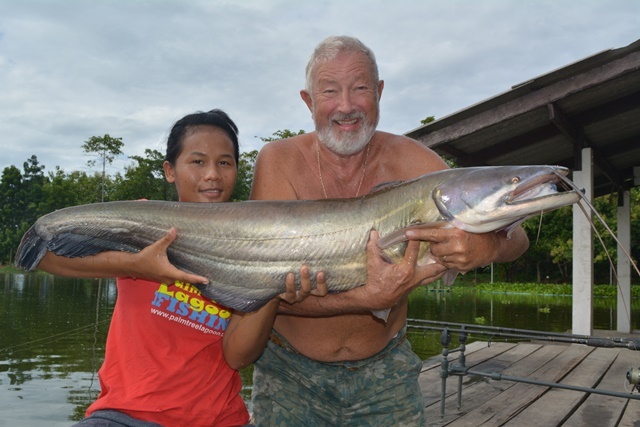 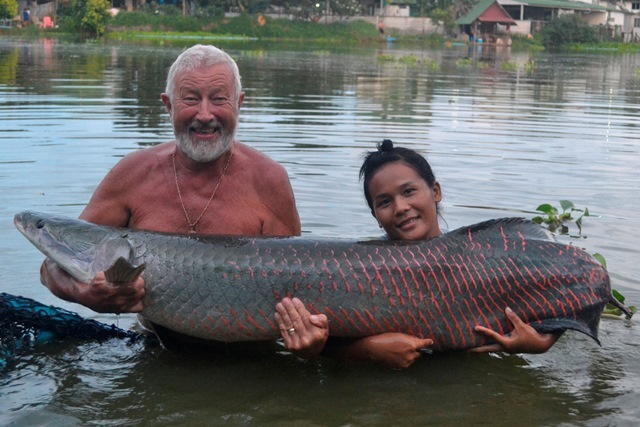 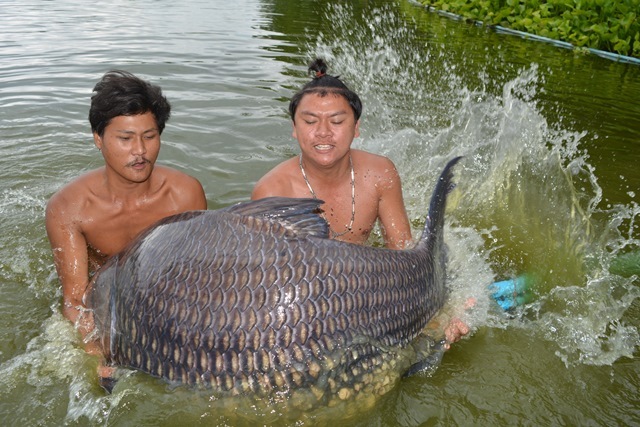 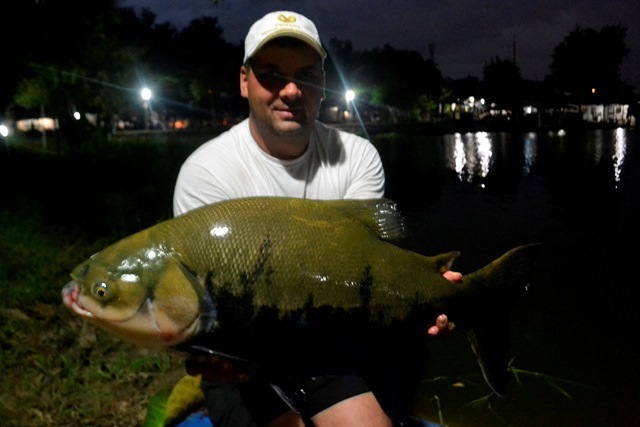 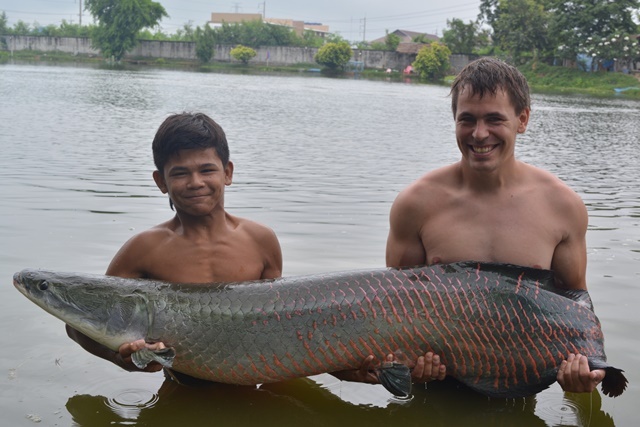 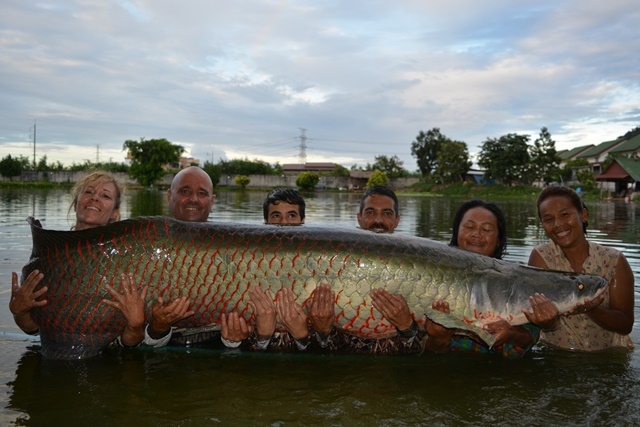 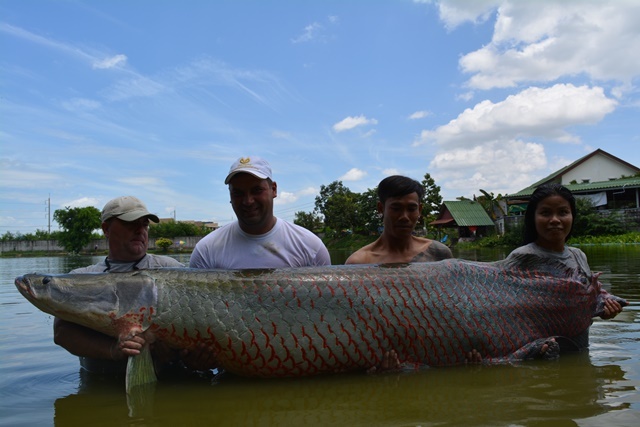 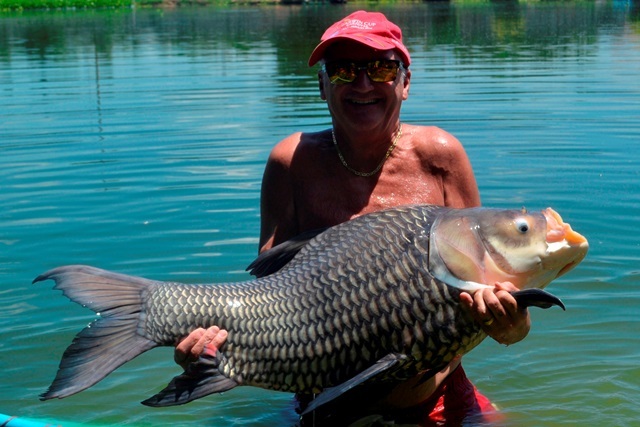 He also caught arapaima his target fish as well as vundu catfish, and both Amazon and Thai redtails. 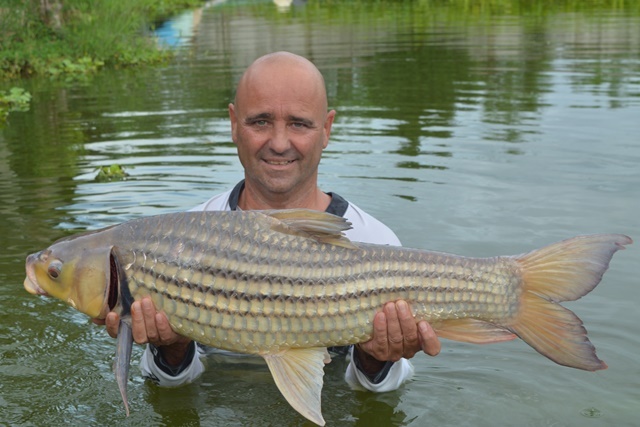 David Hunt finally made in back to Palm Tree after a long absence with his partner Mhel. 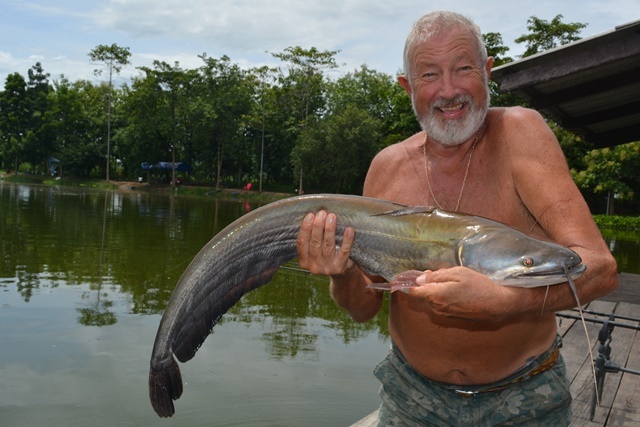 Judging by the smiles he was certainly still enjoying his fishing catching numerous species that included tambaqui, Juliens golden price carp, Siamese carp, rohu, striped catfish, catfish shark, as well as both Asian and Amazon redtails. 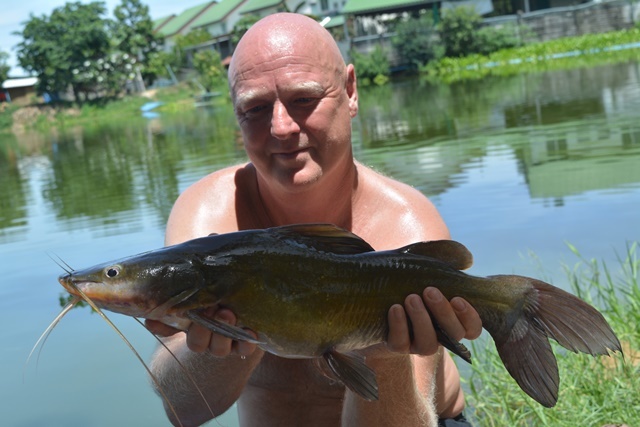 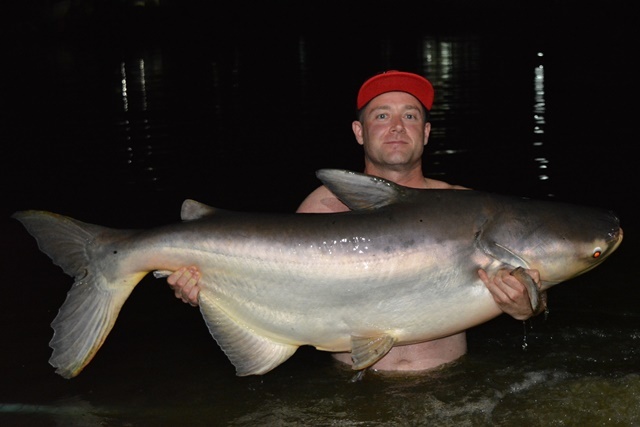 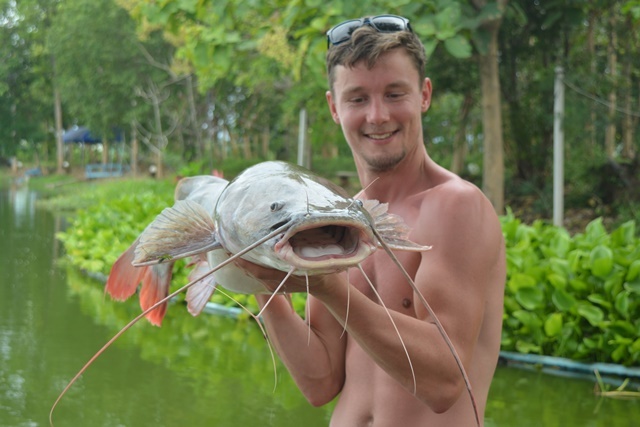 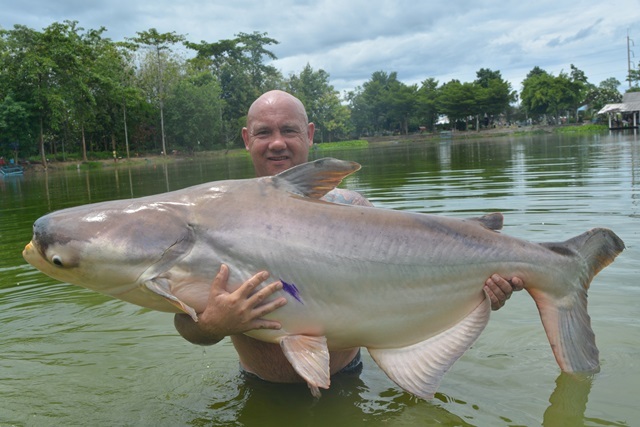 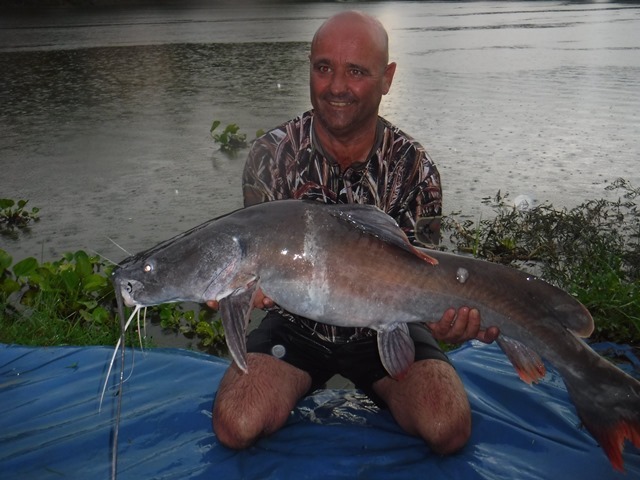 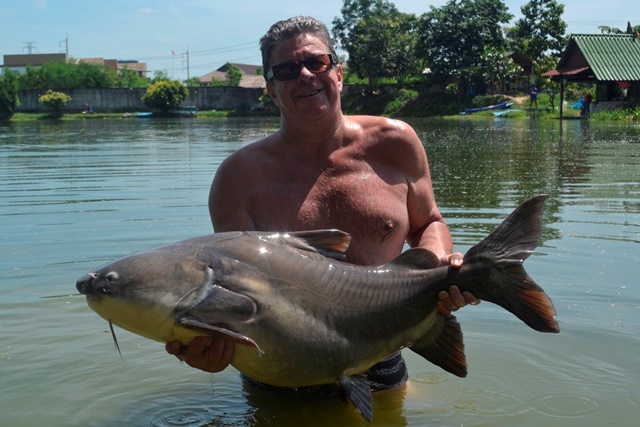 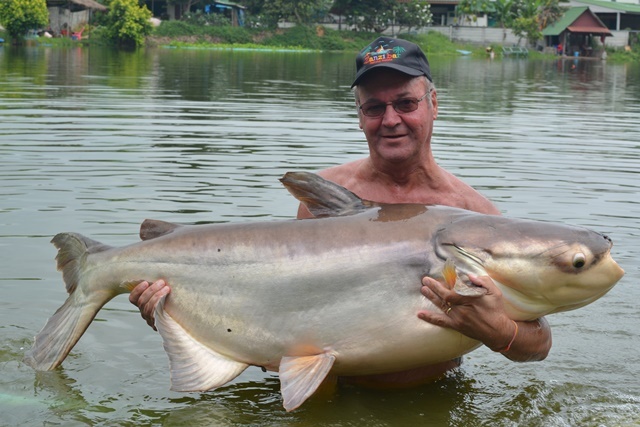 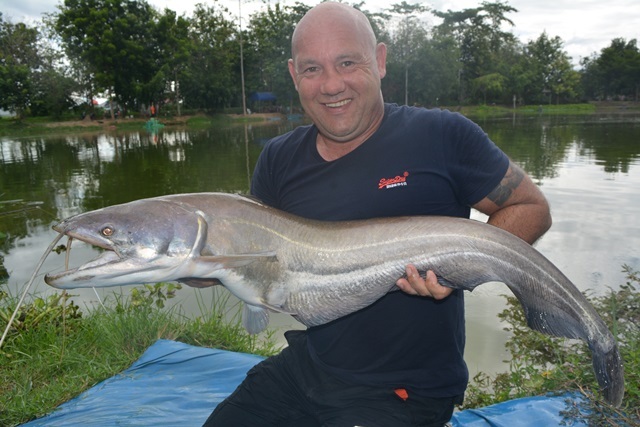 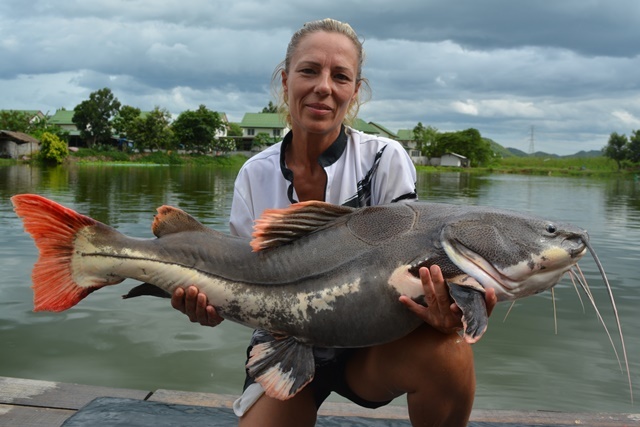 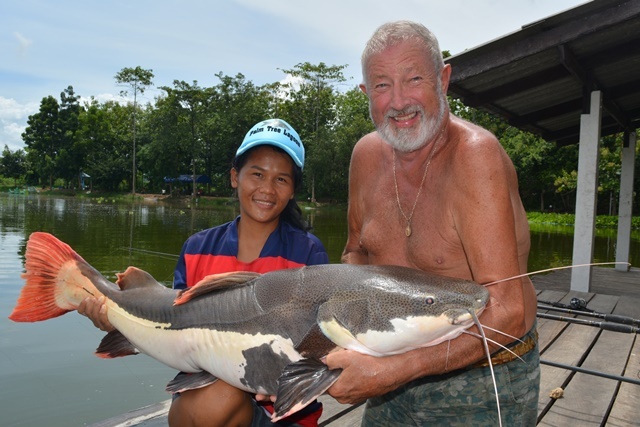 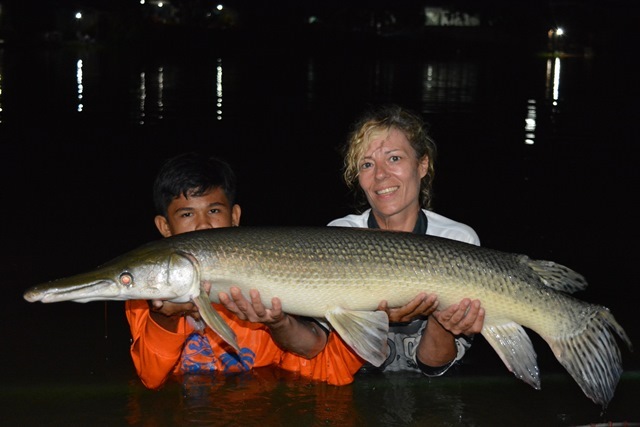 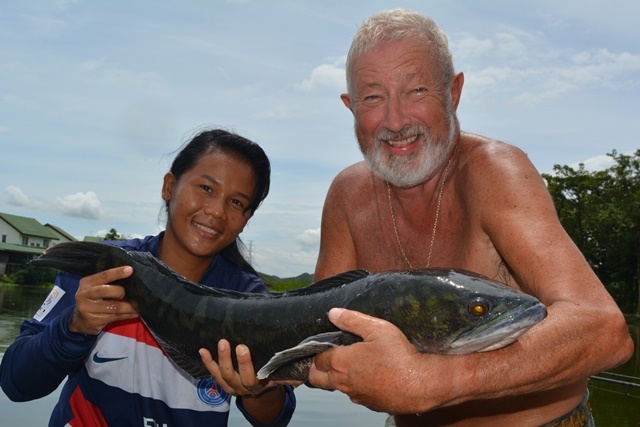 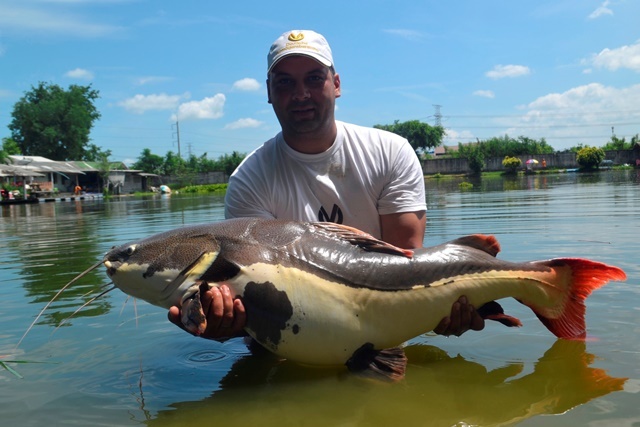 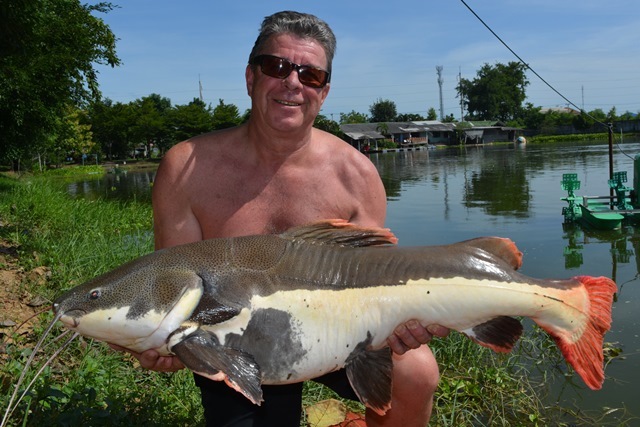 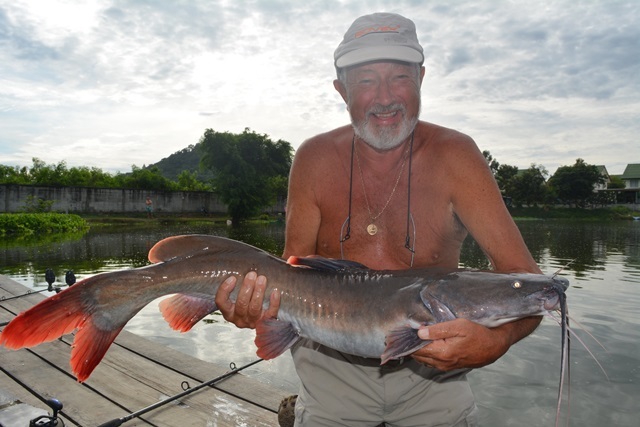 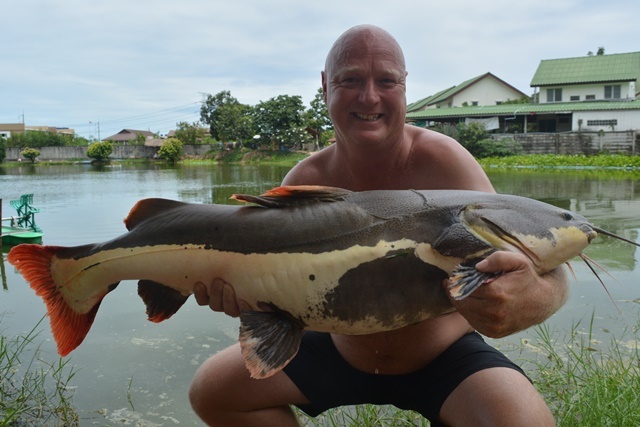 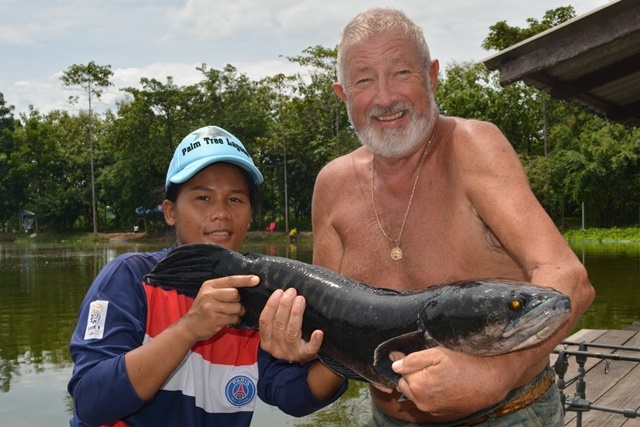 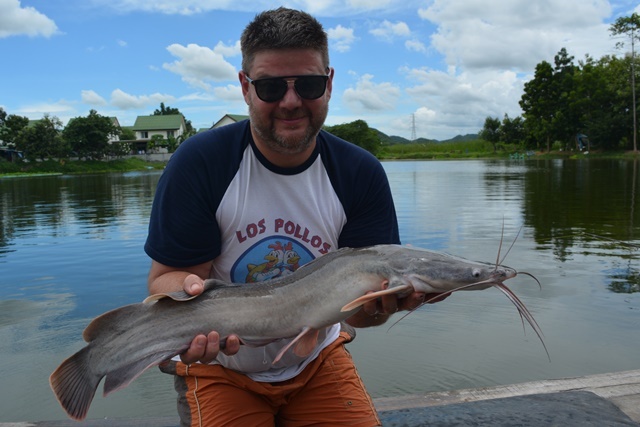 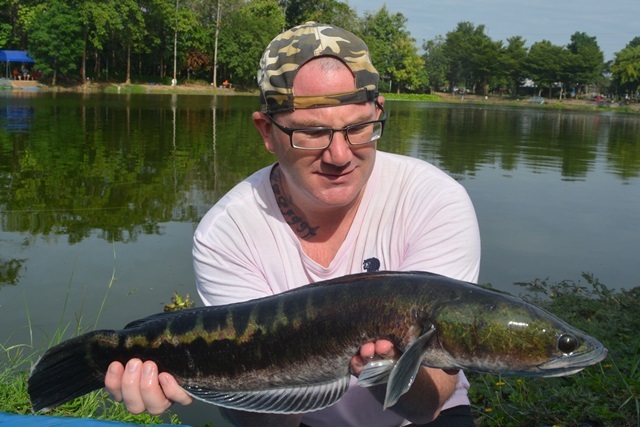 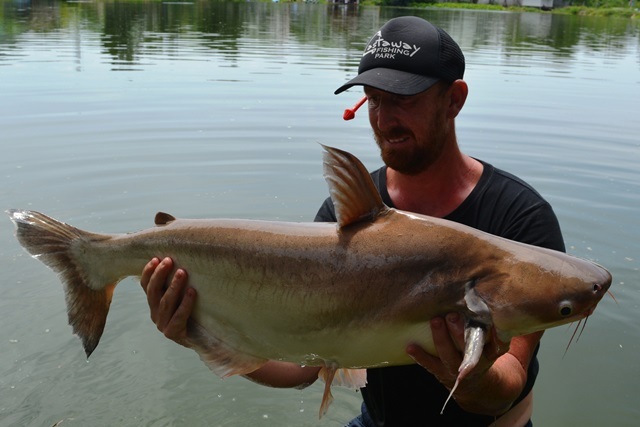 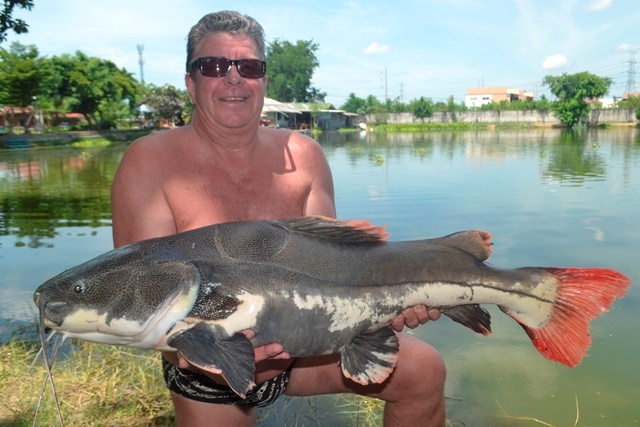 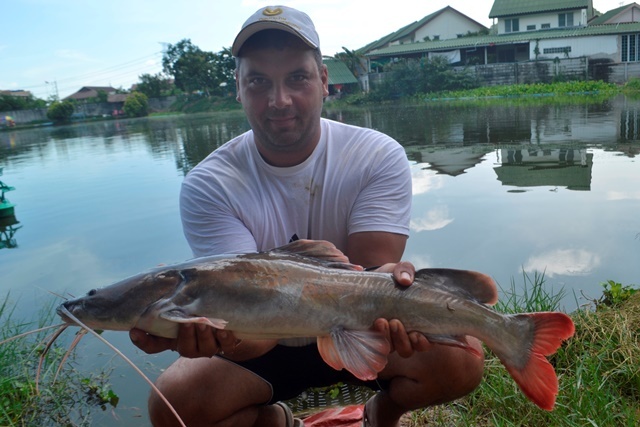 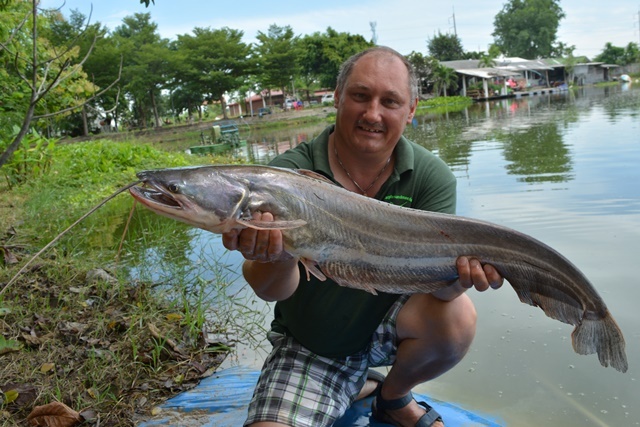 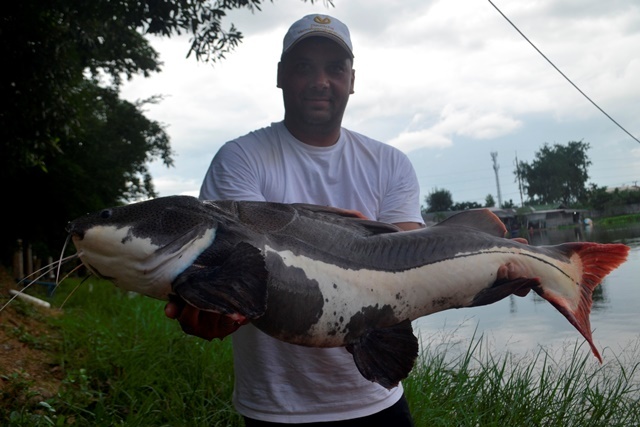 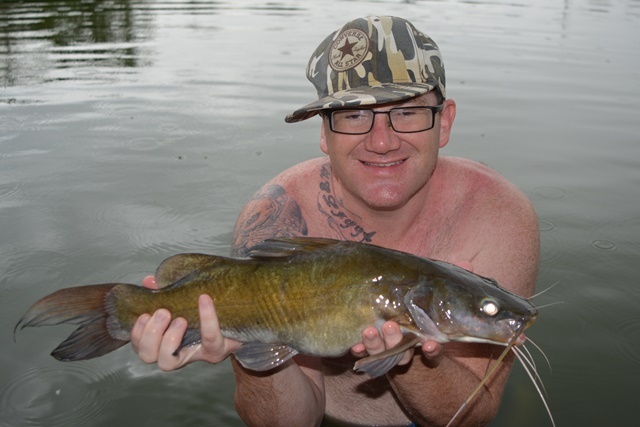 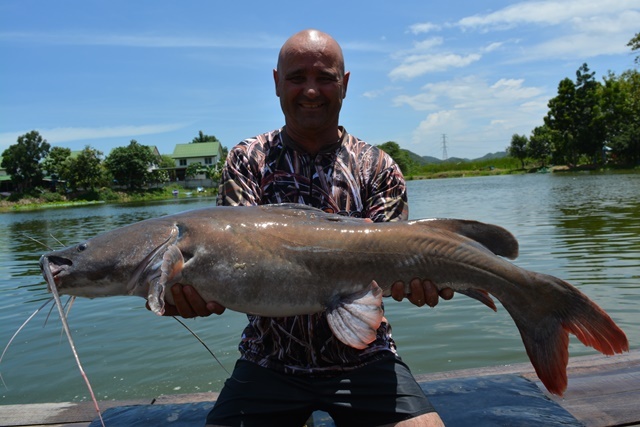 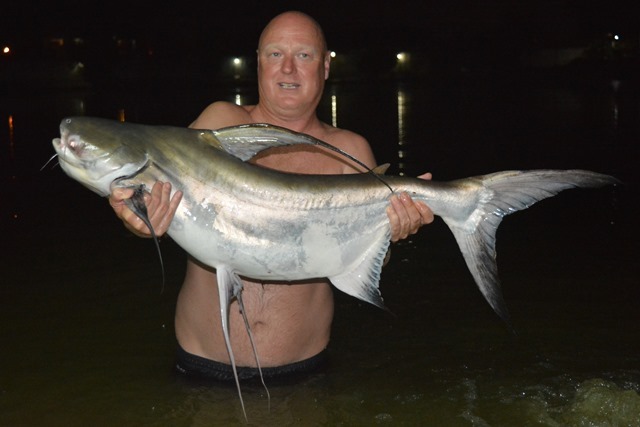 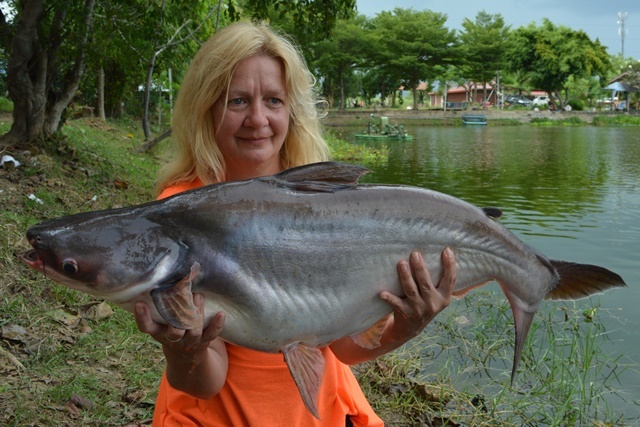 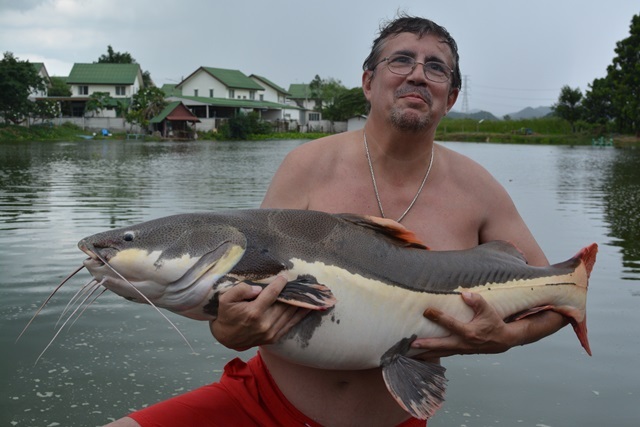 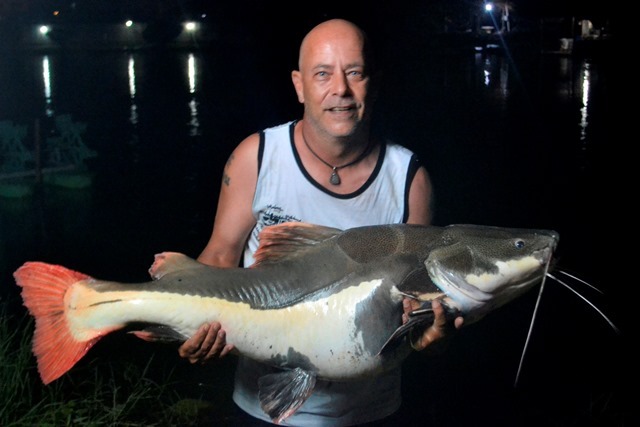 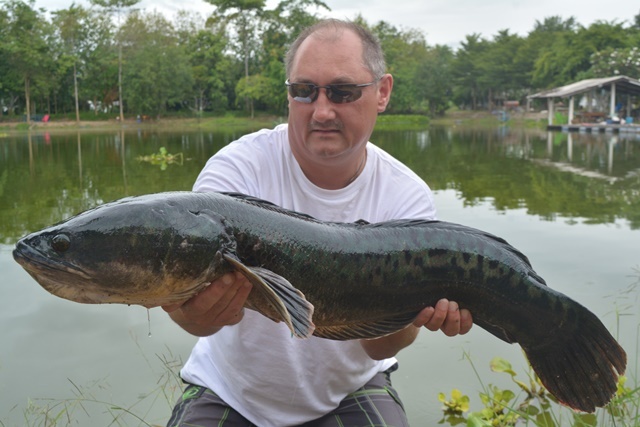 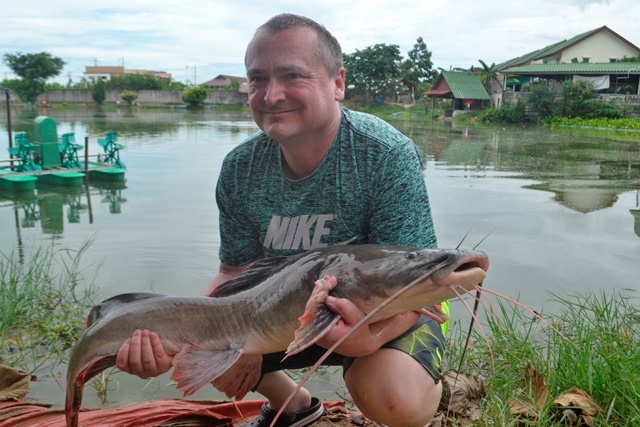 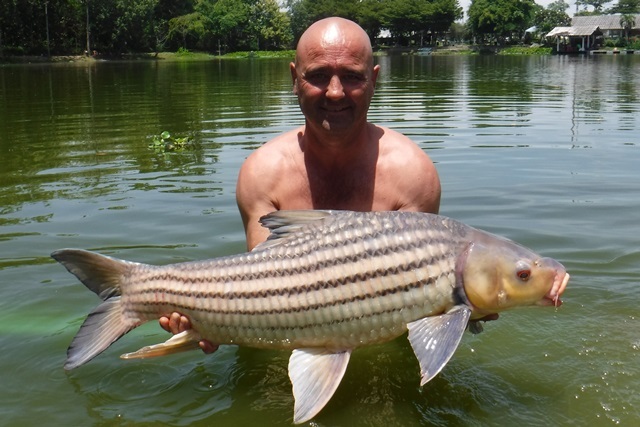 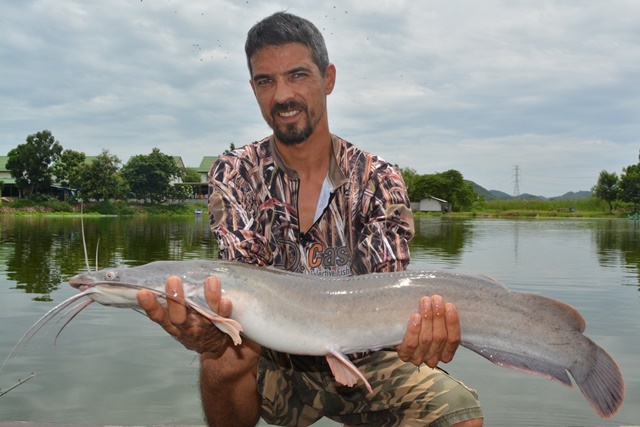 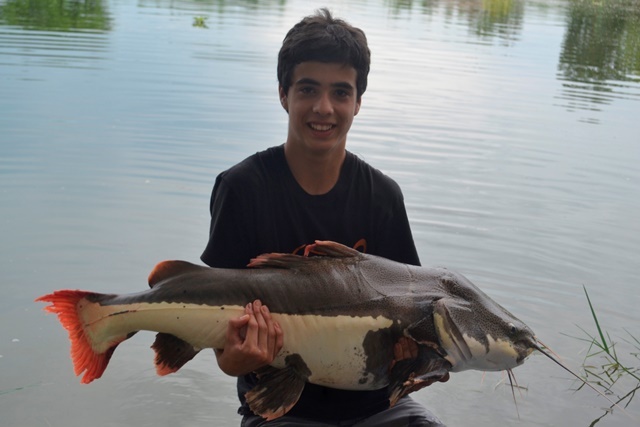 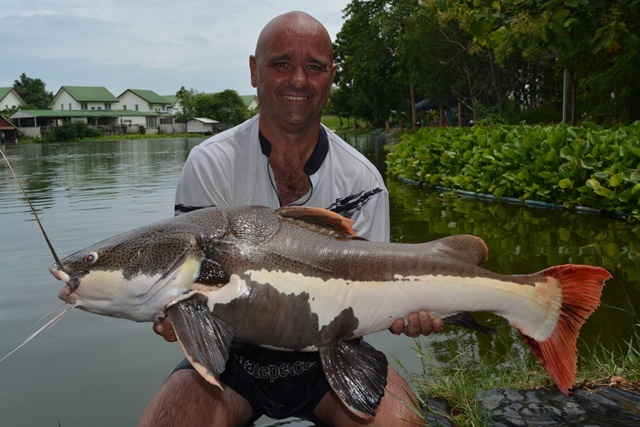 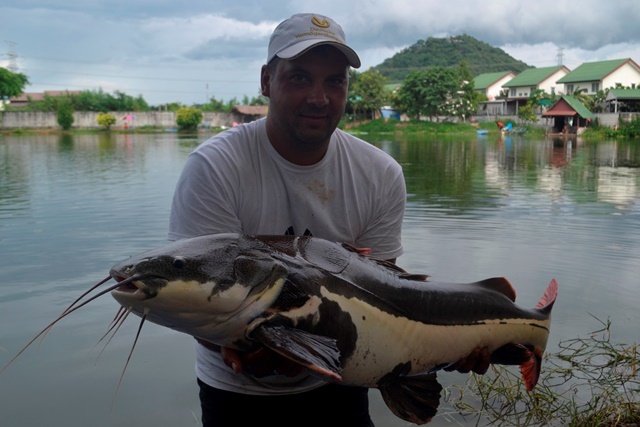 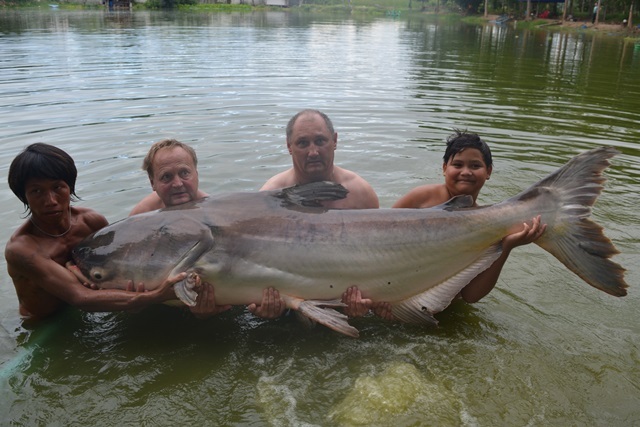 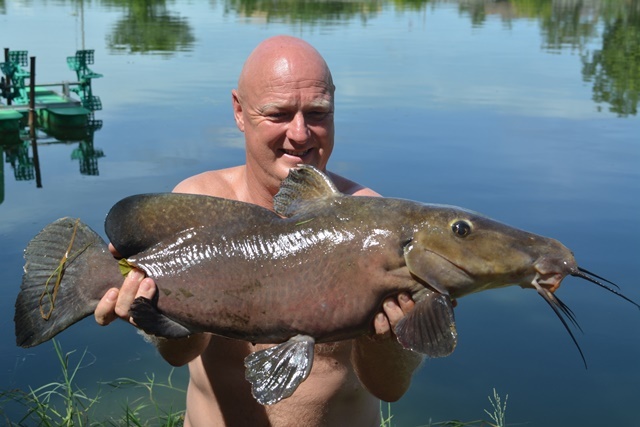 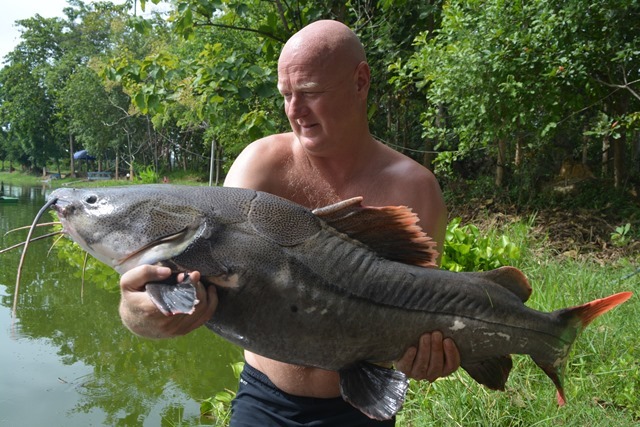 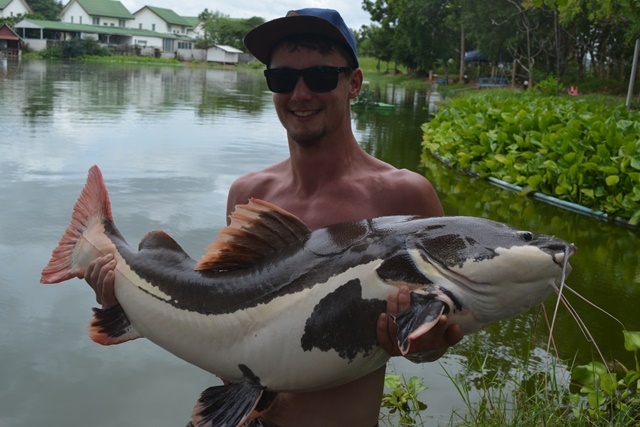 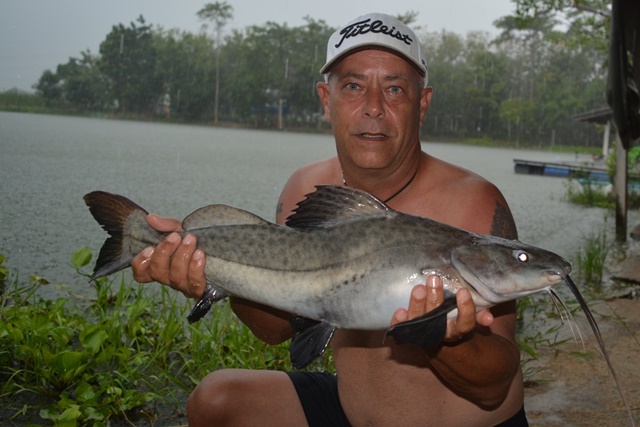 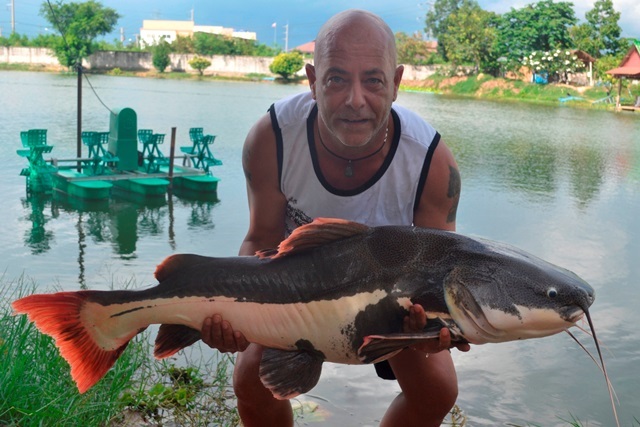 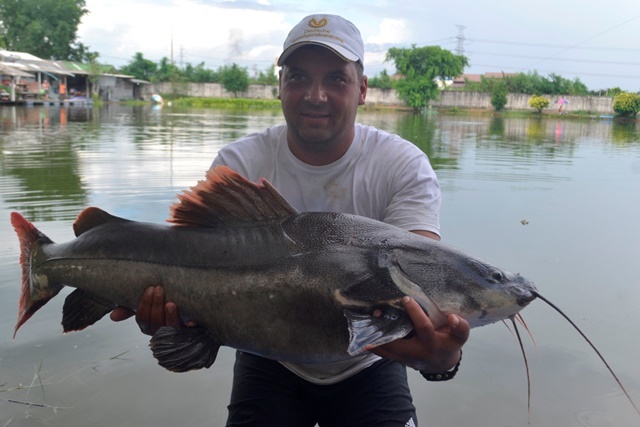 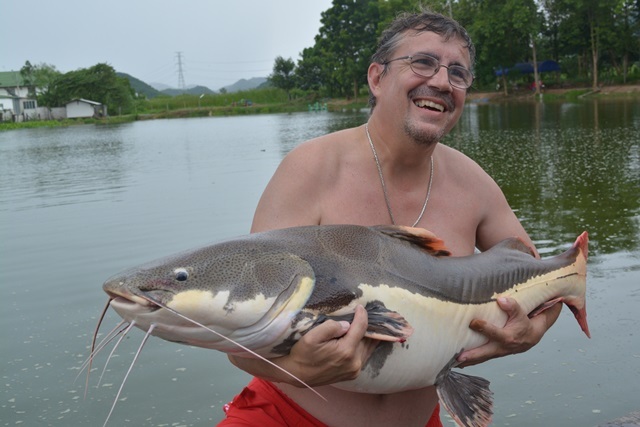 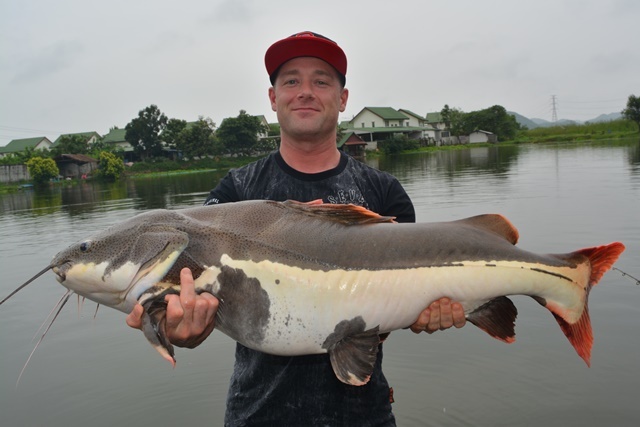 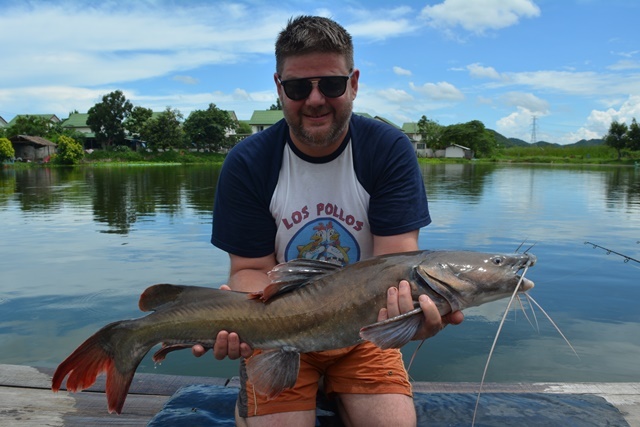 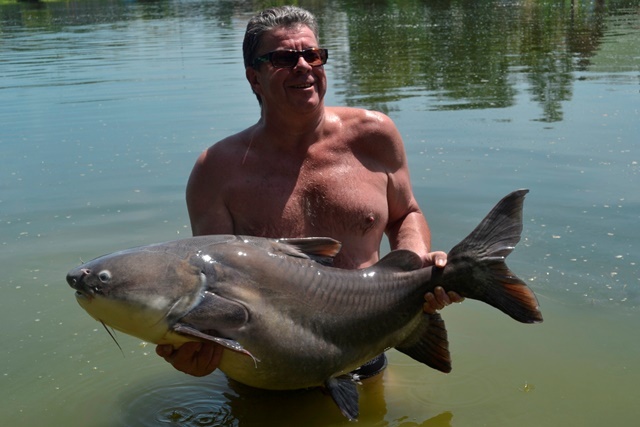 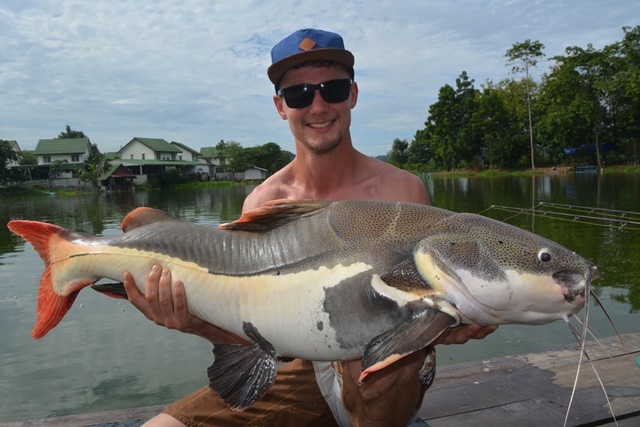 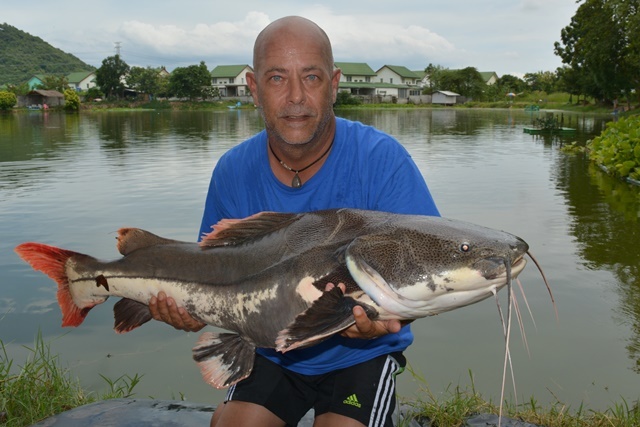 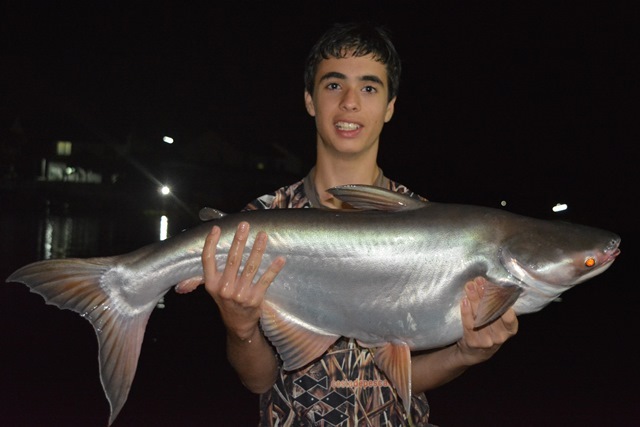 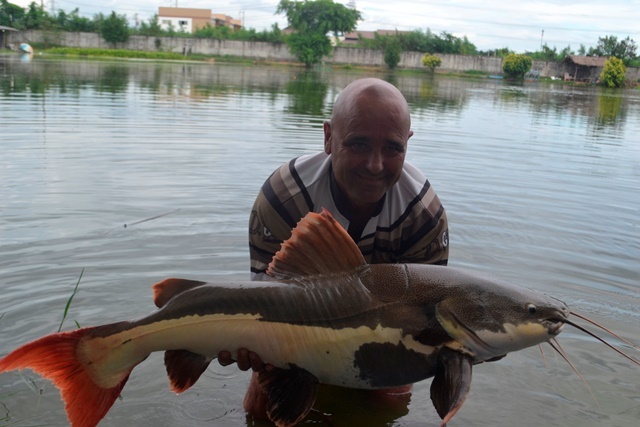 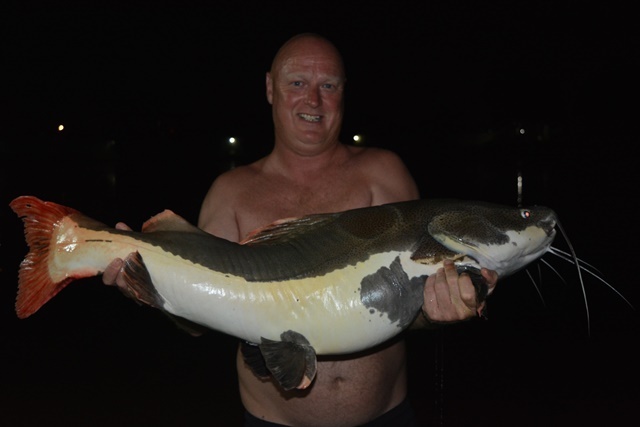 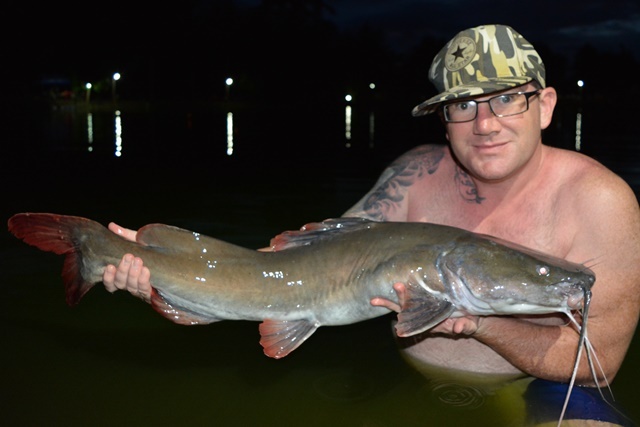 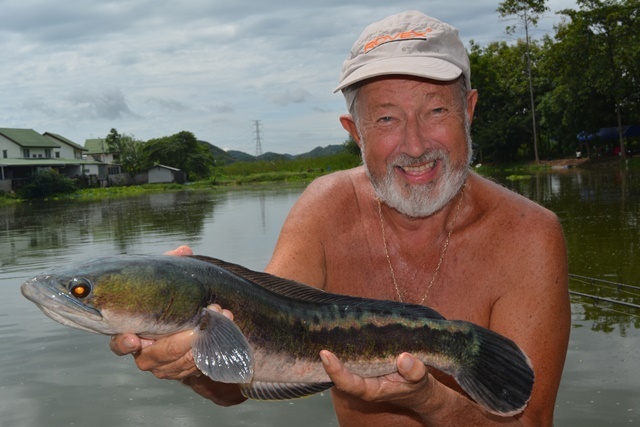 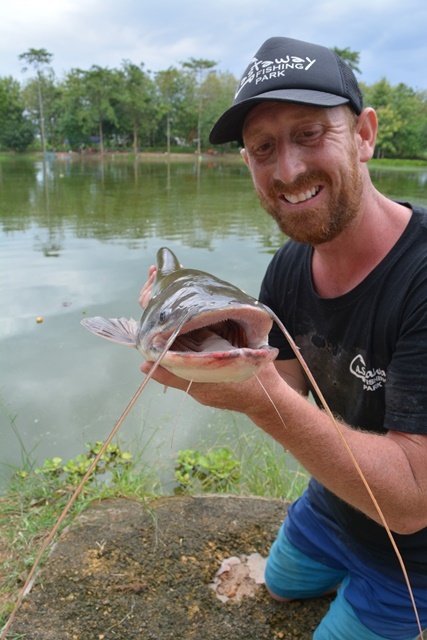 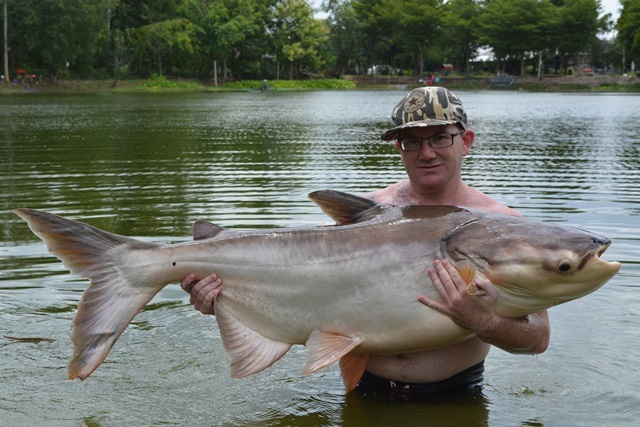 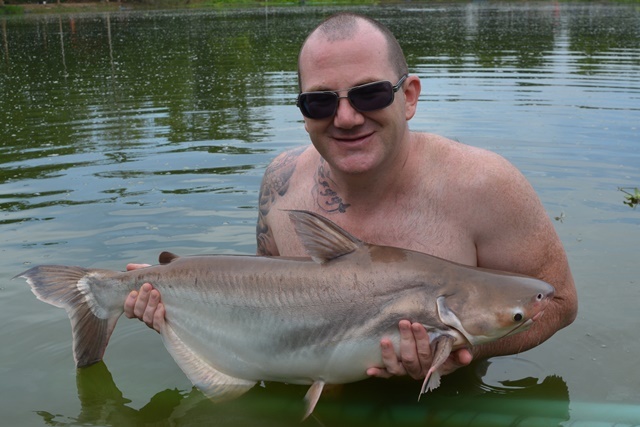 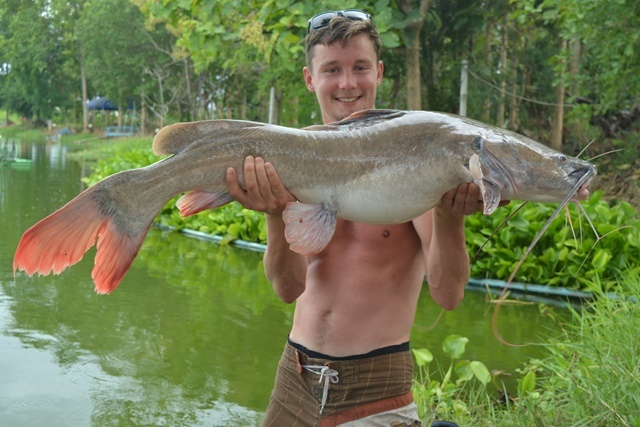 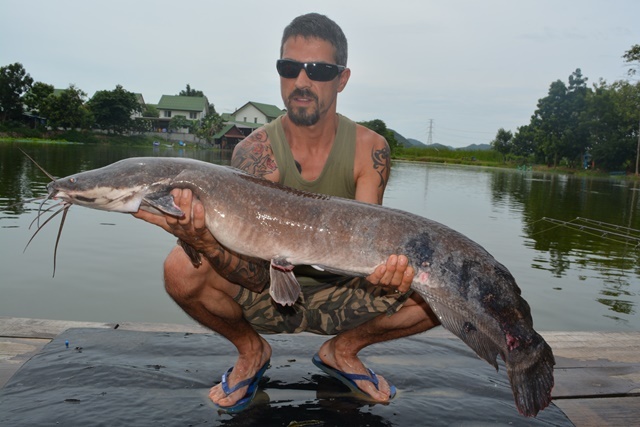 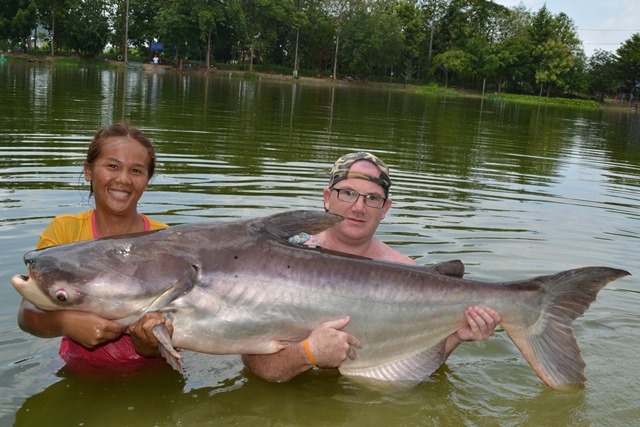 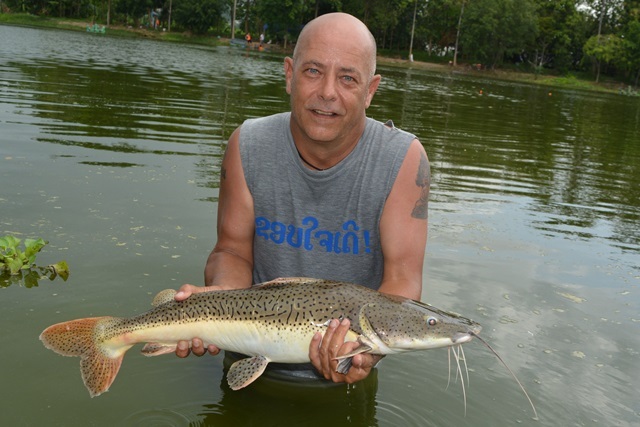 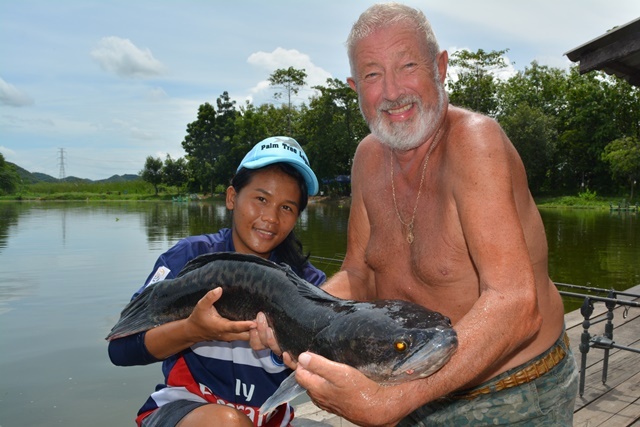 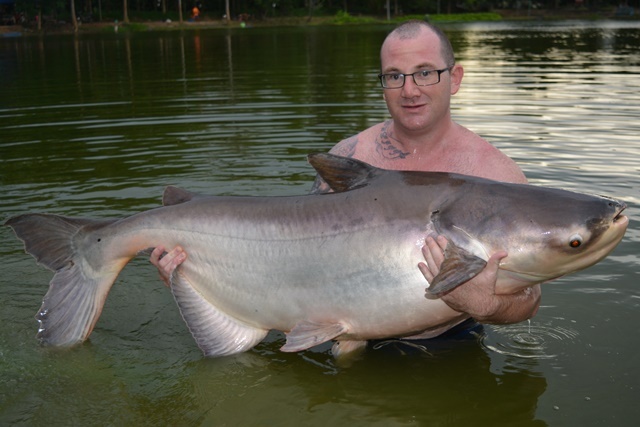 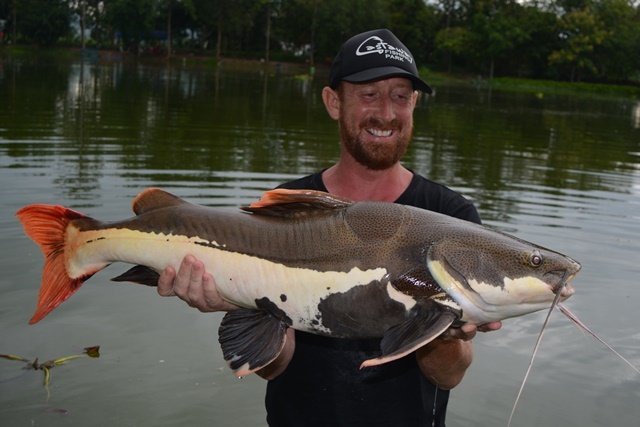 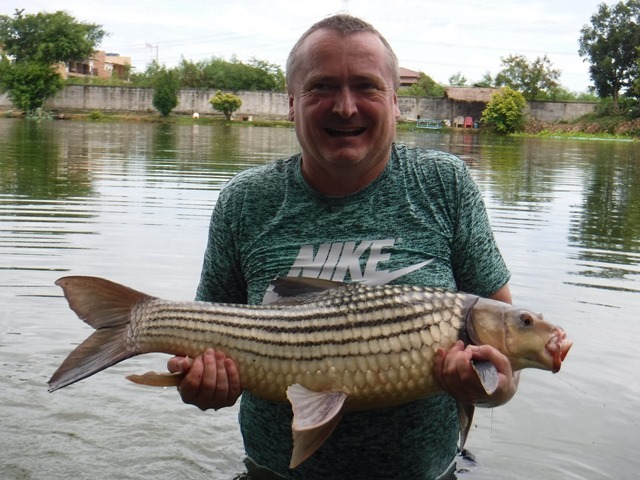 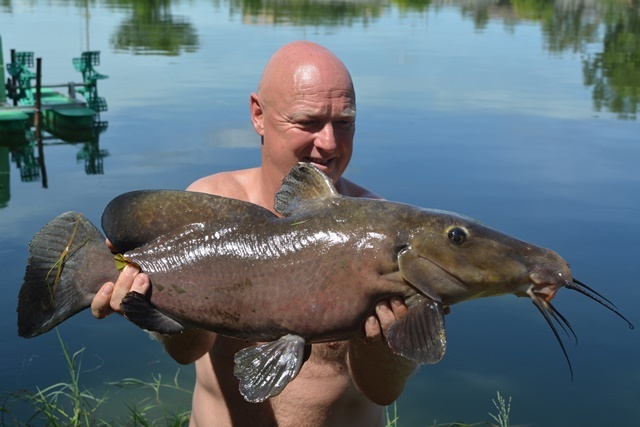 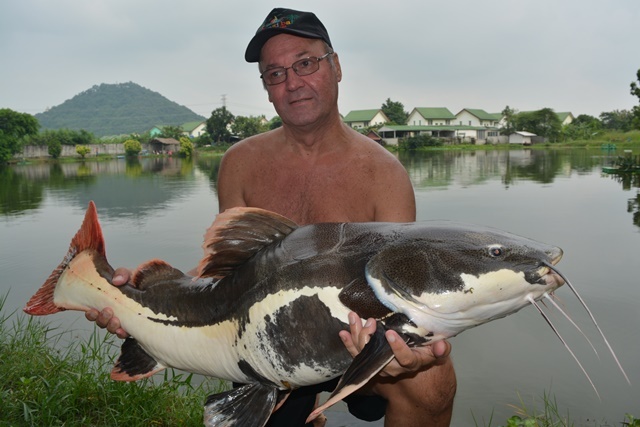 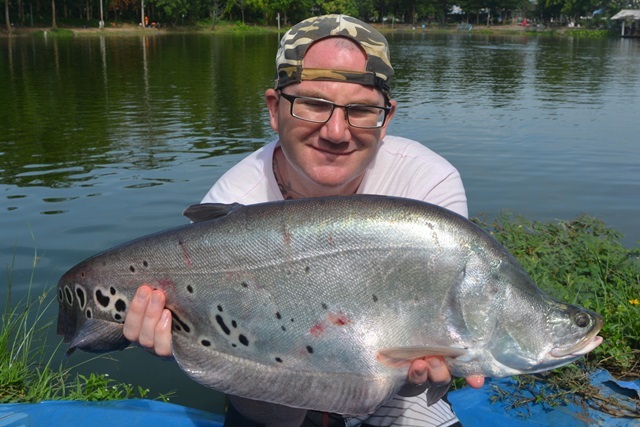 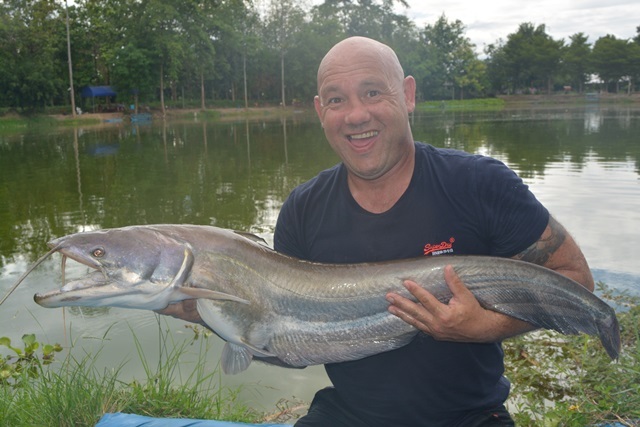 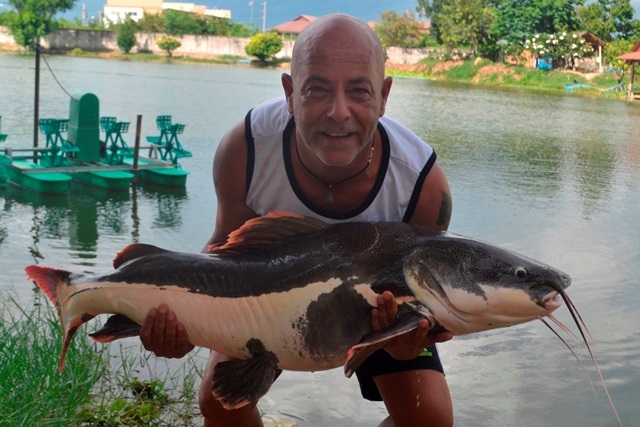 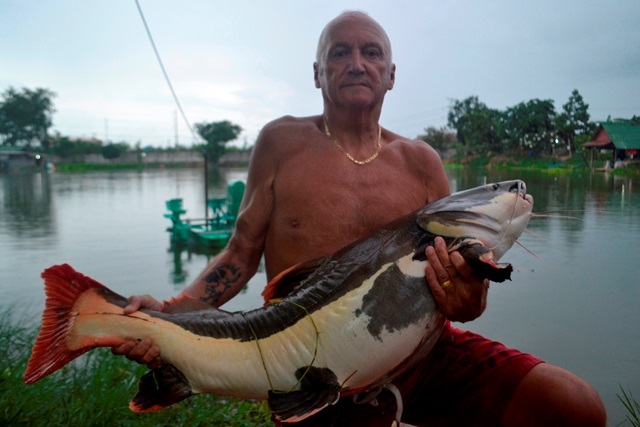 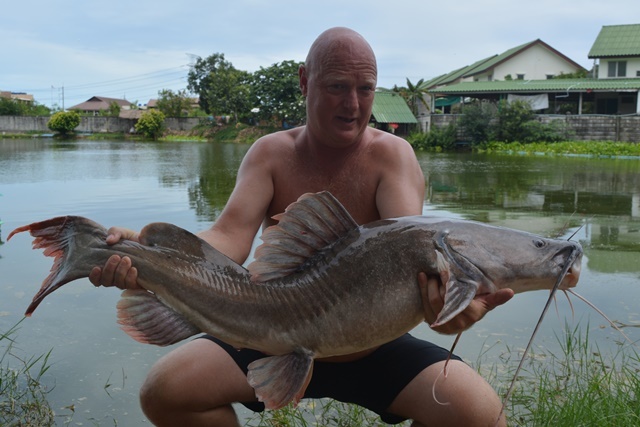 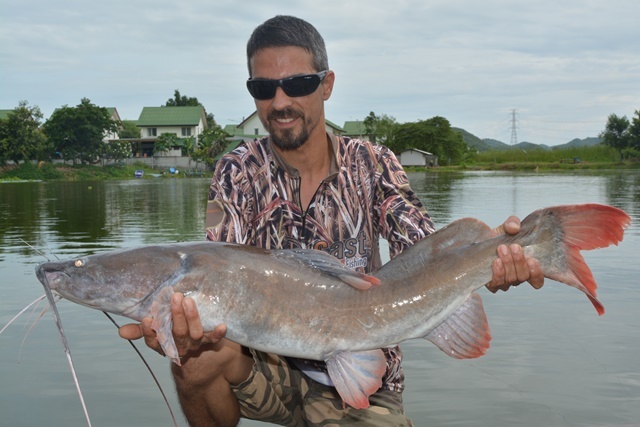 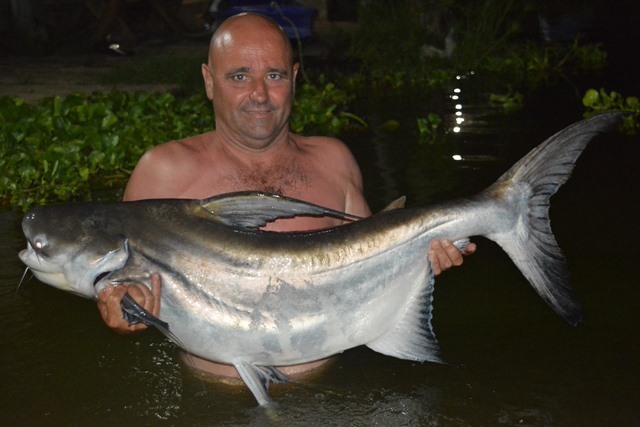 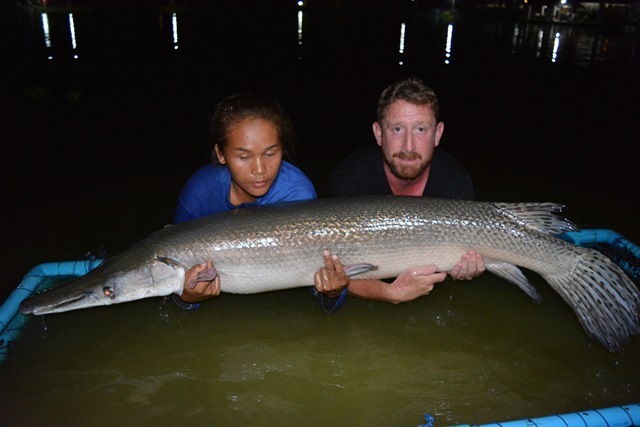 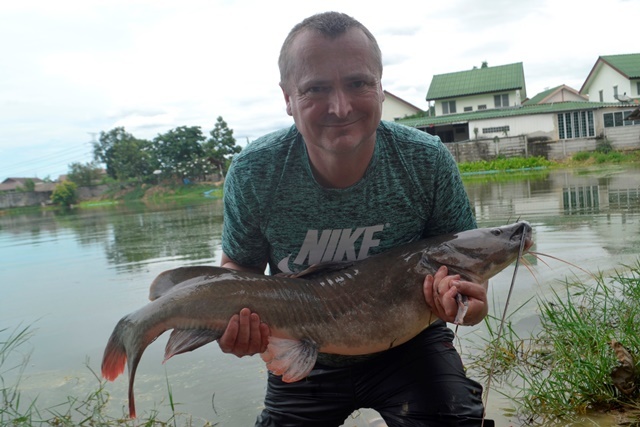 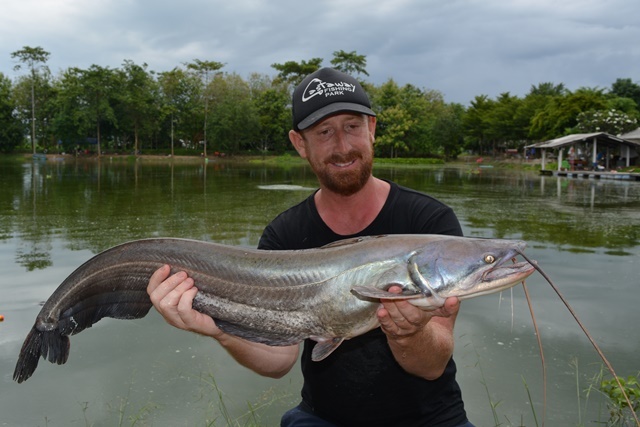 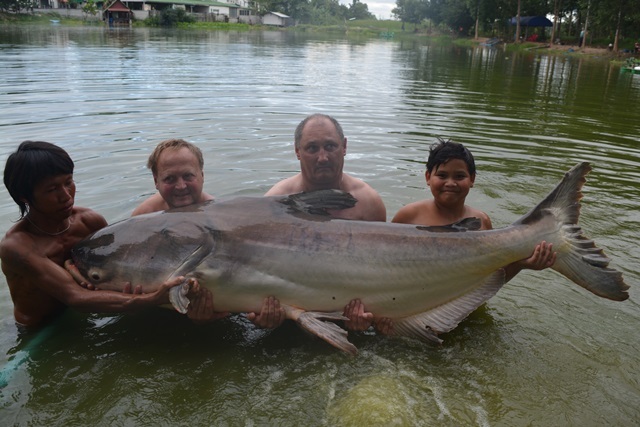 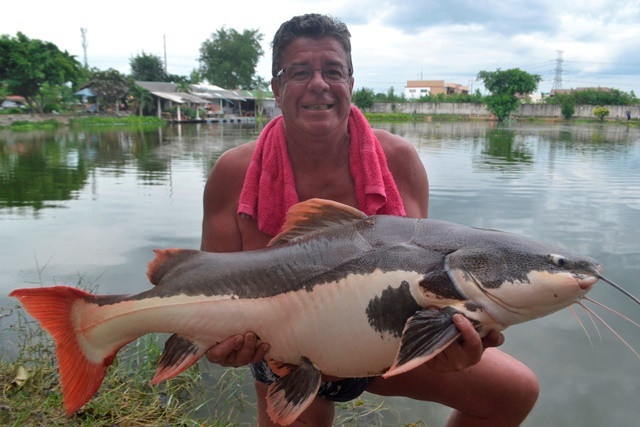 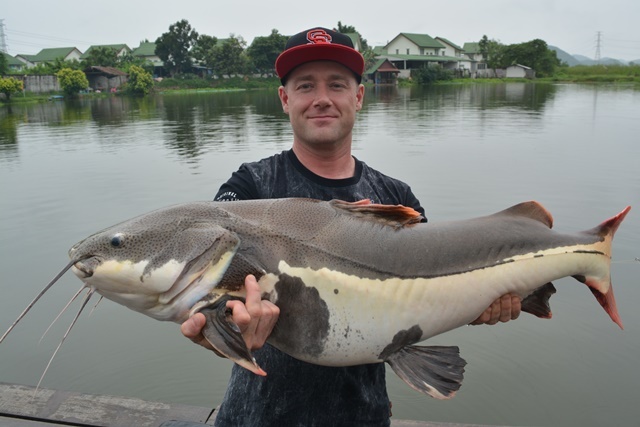 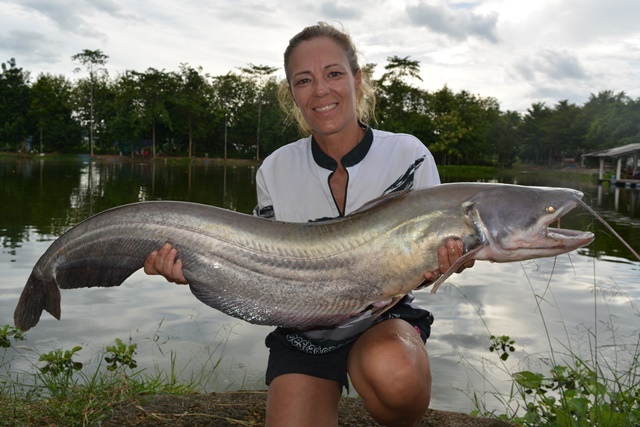 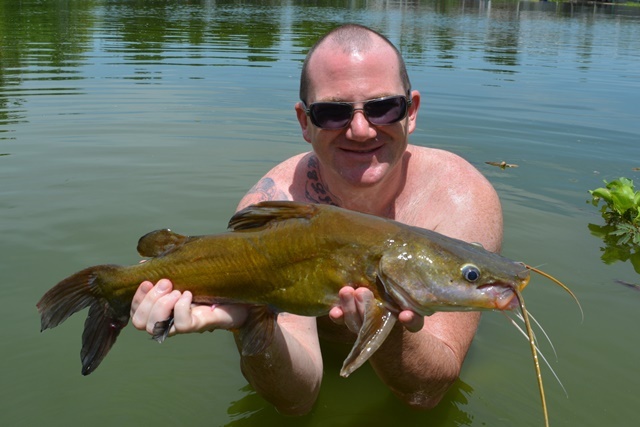 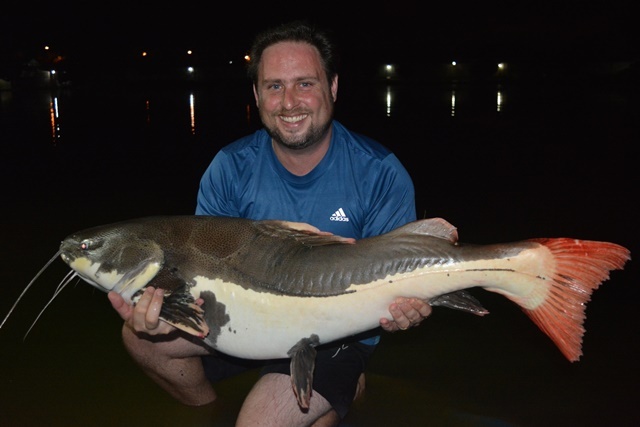 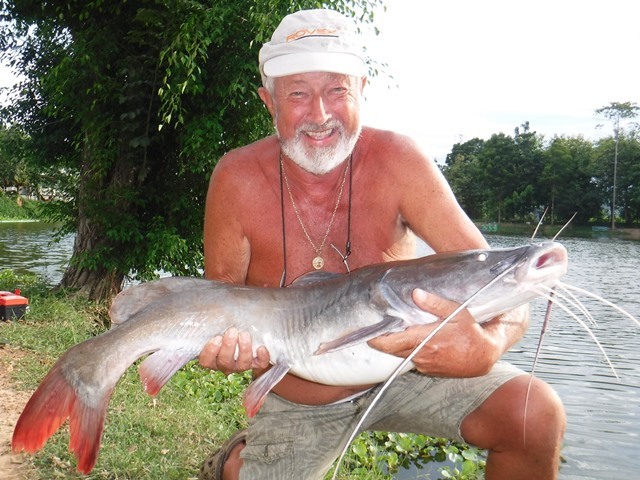 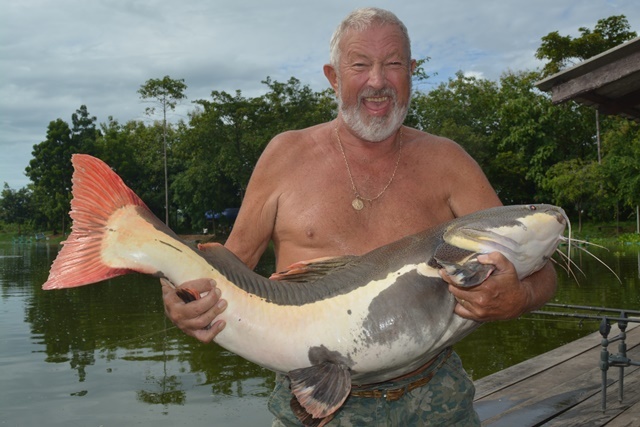 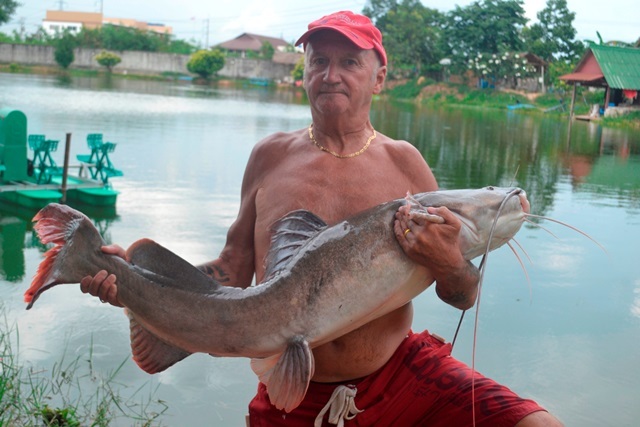 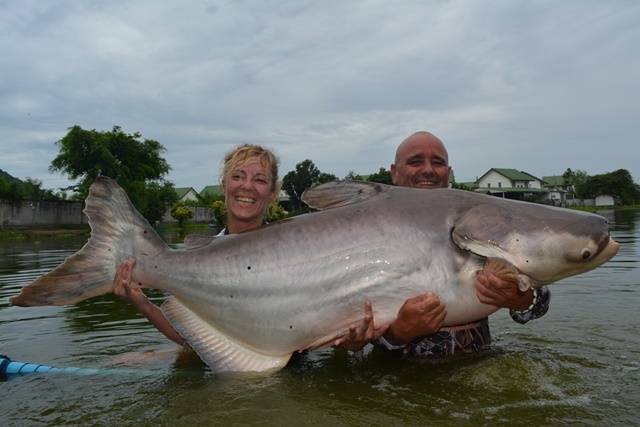 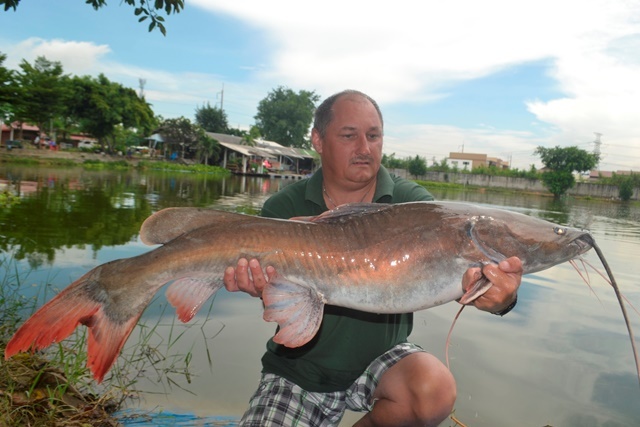 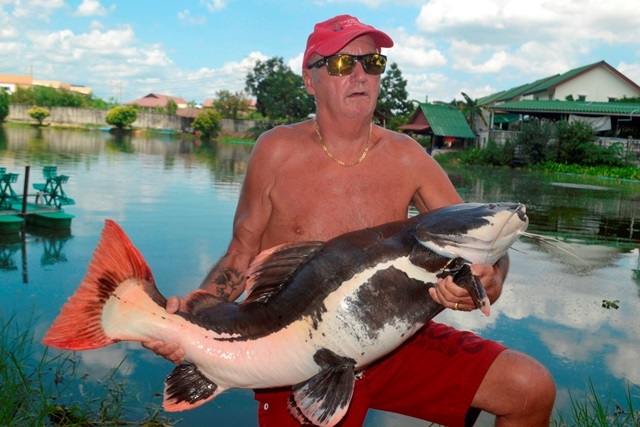 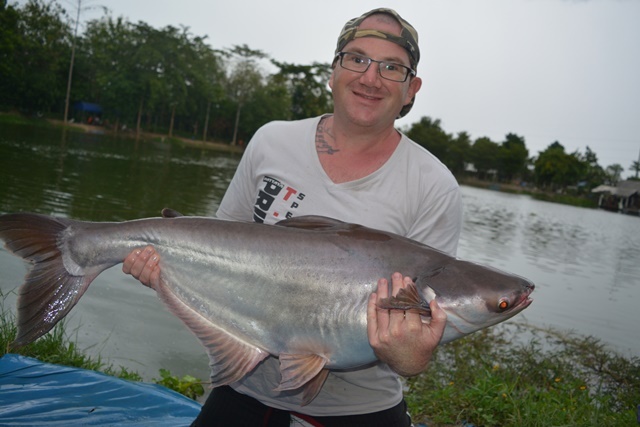 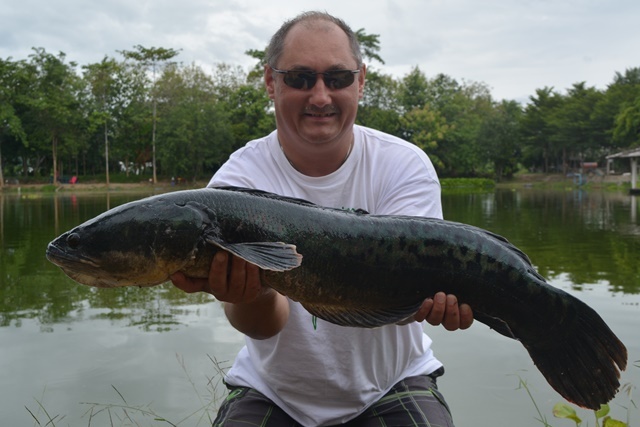 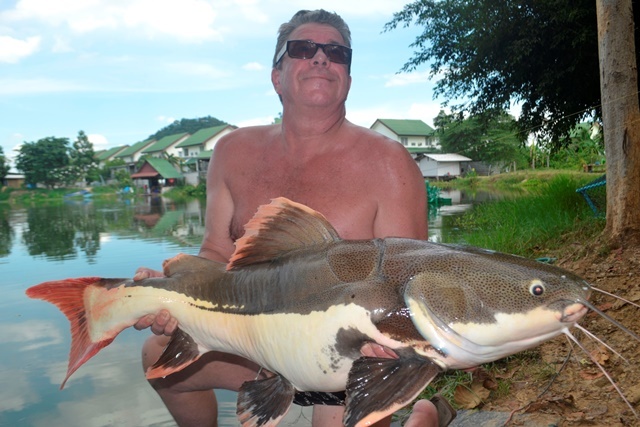 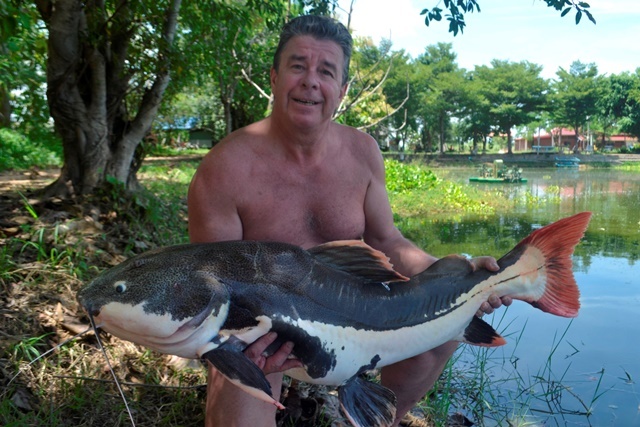 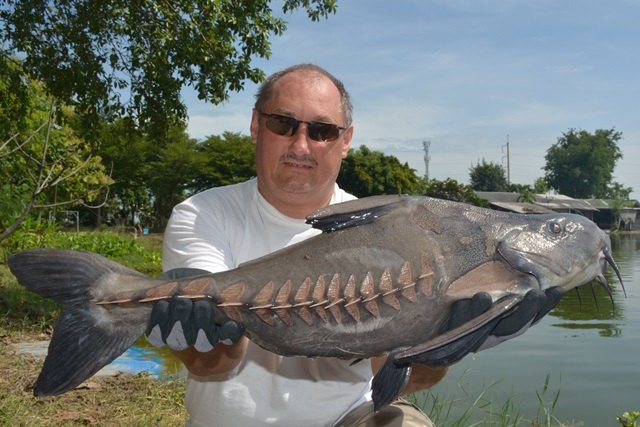 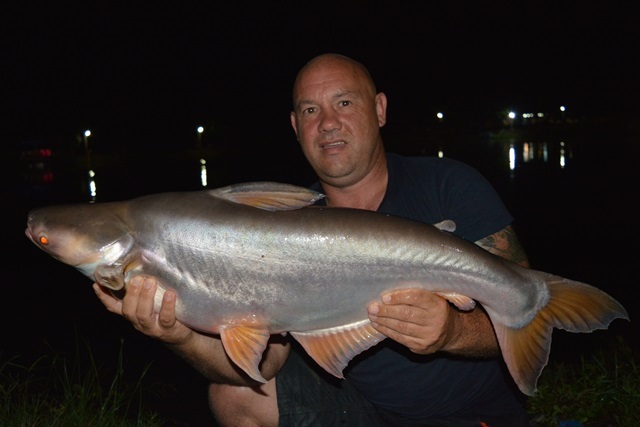 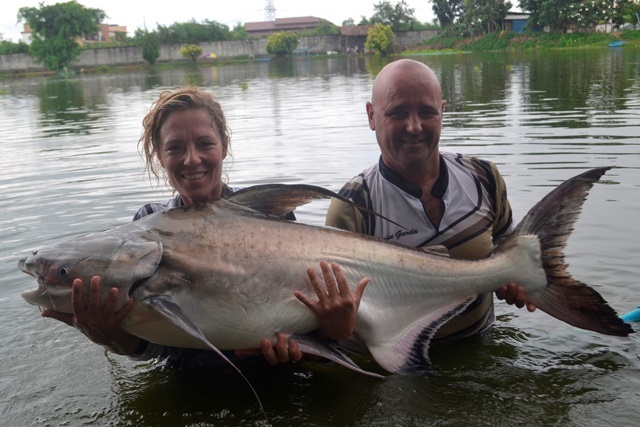 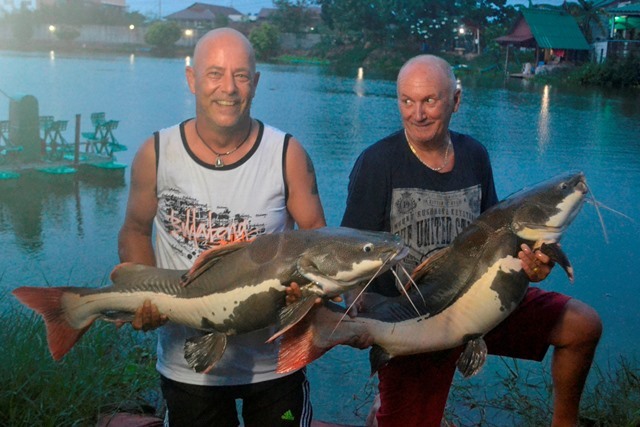 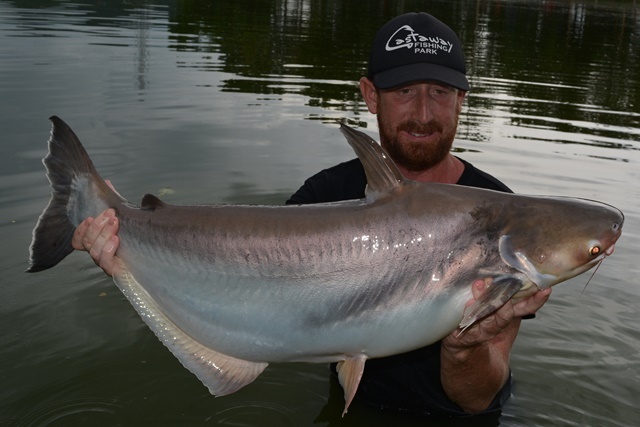 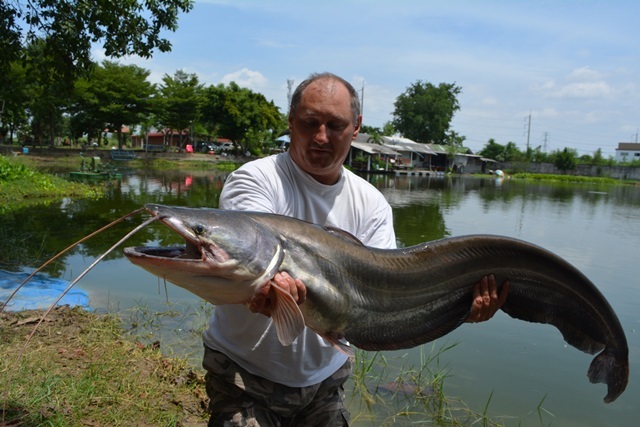 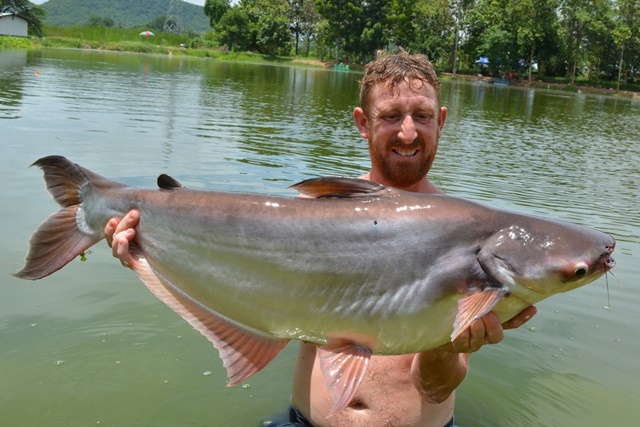 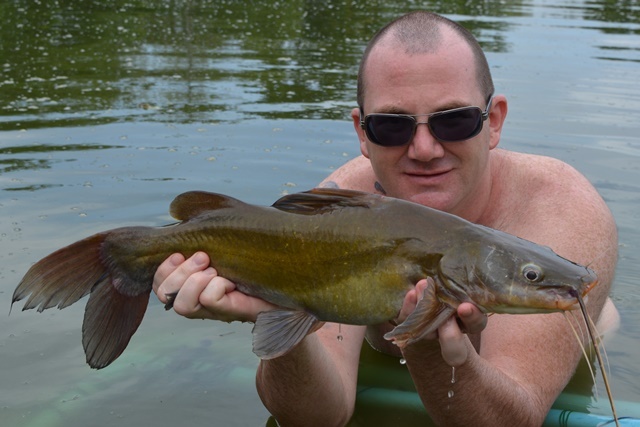 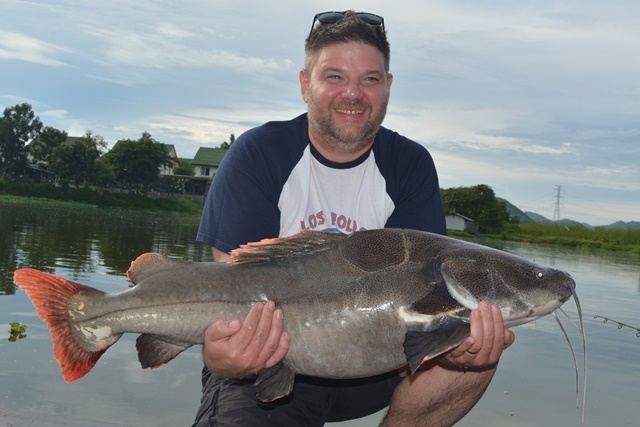 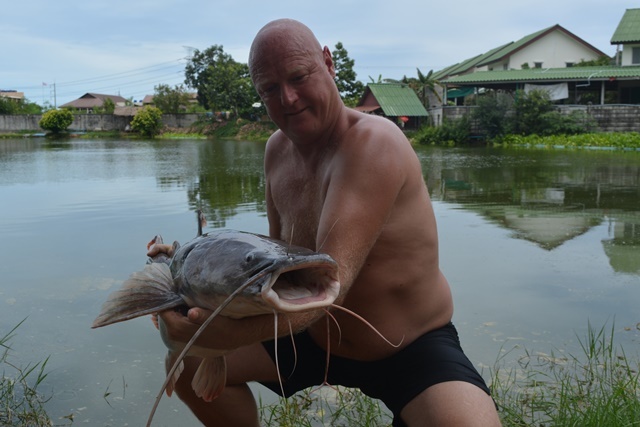 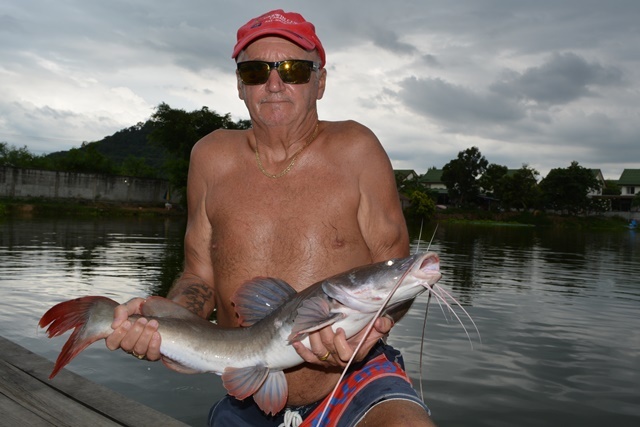 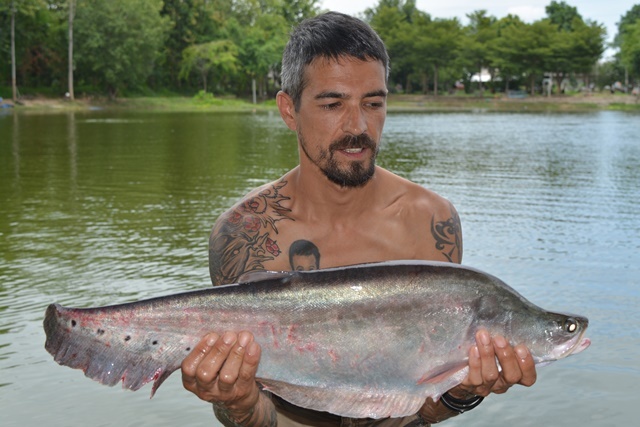 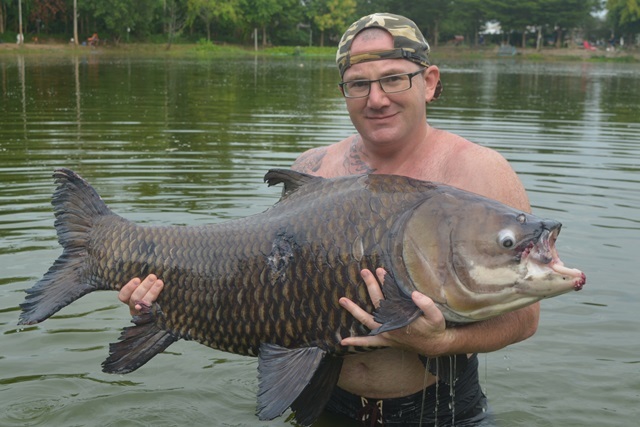 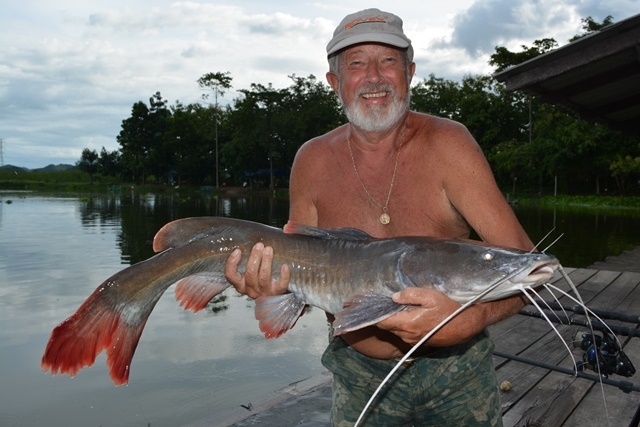 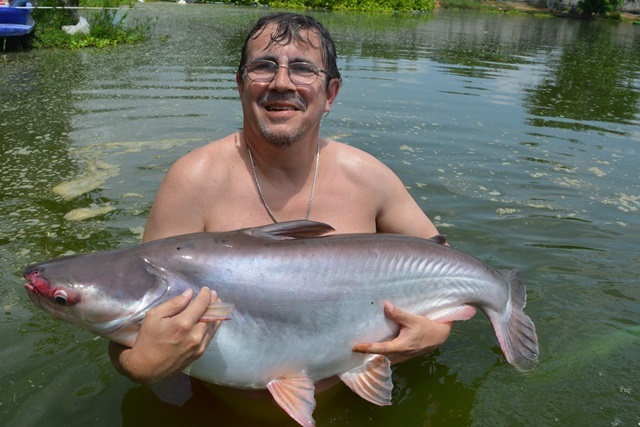 John from Shooters Bar in Pattaya was also back during the month catching a number of different species such as a rare vulture catfish, leopard catfish, rohu, Siamese carp, striped catfish, catfish shark, as well as both Amazon and Thai redtails. 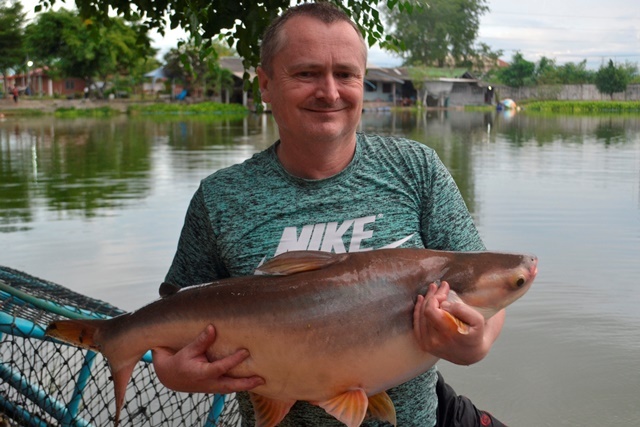 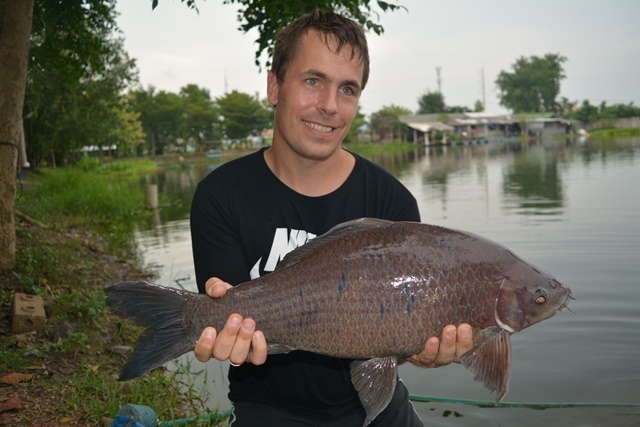 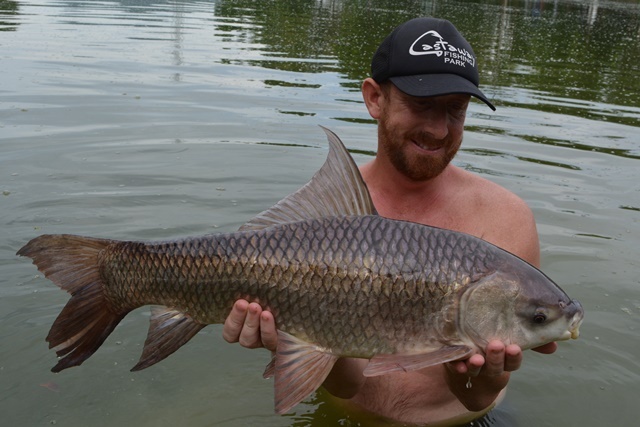 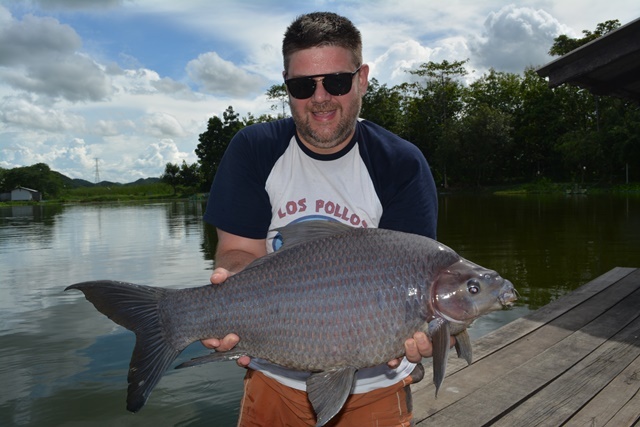 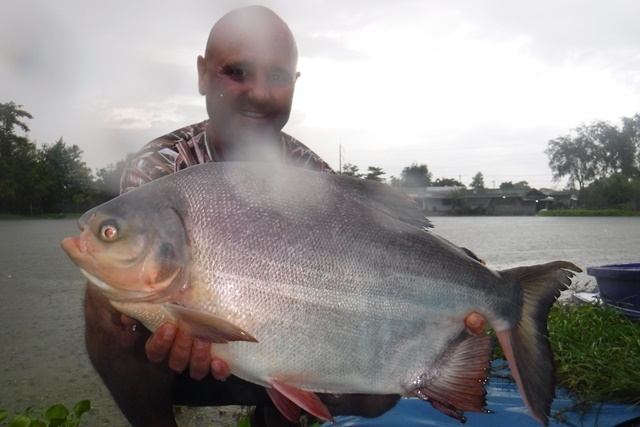 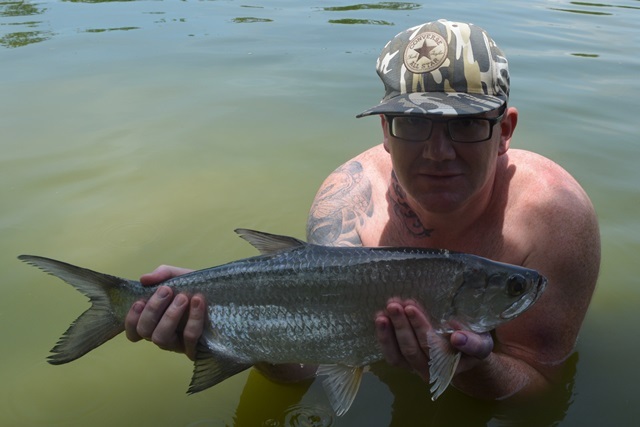 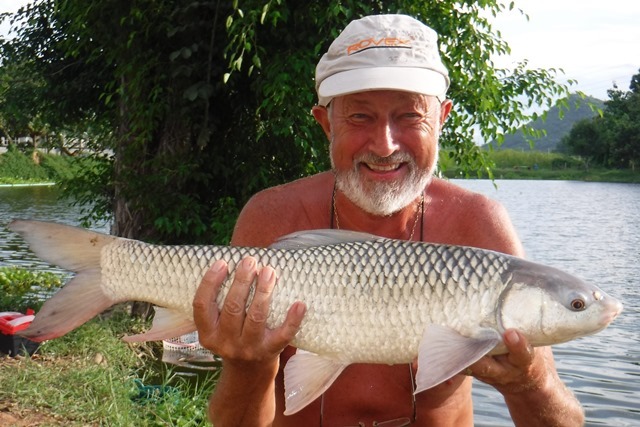 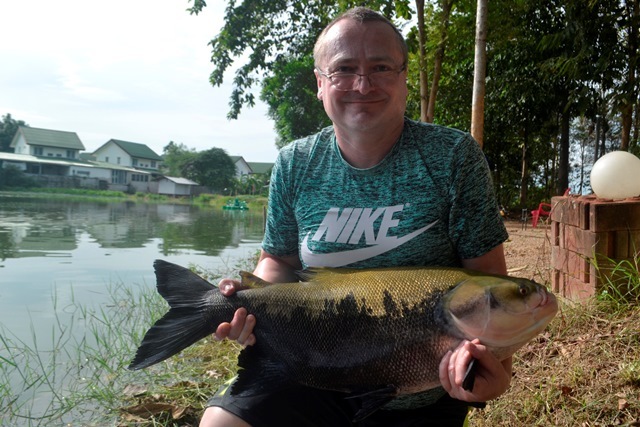 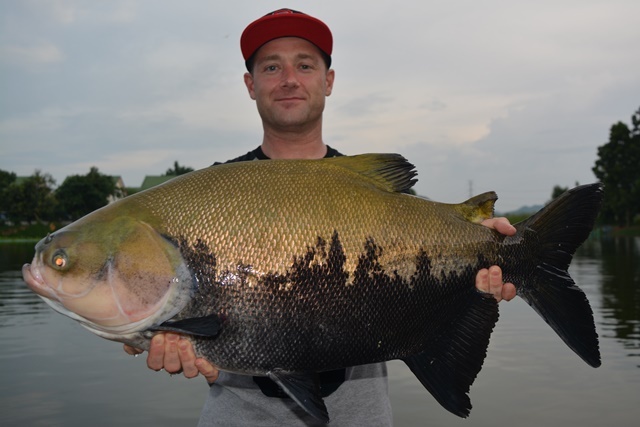 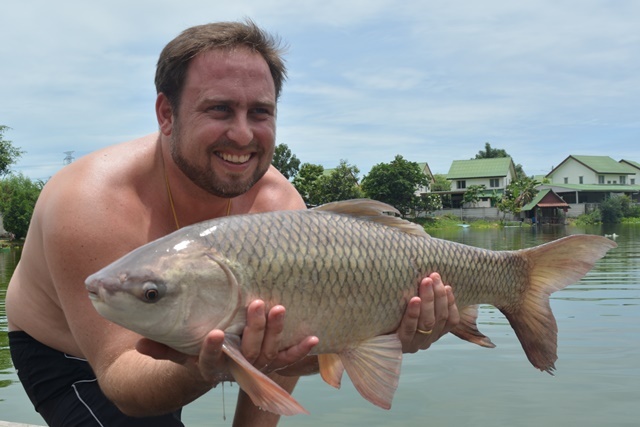 Jukka made his first visit to Palm Tree this month and they had a good session catching a variety of species that included tambaqui, albino chao phraya, rohu, Mekong catfish, vundu catfish, parapatinga as well as both Amazon and Asian redtails. 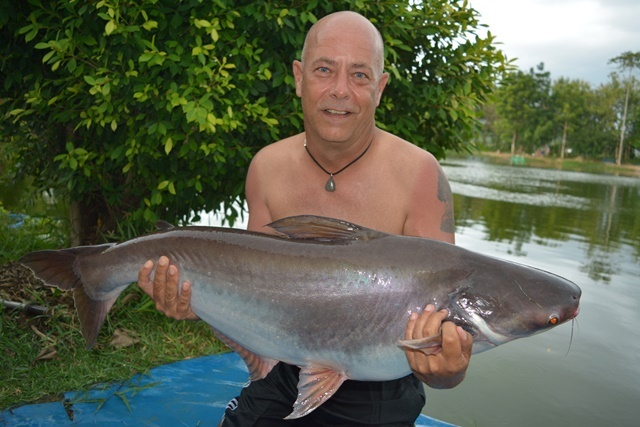 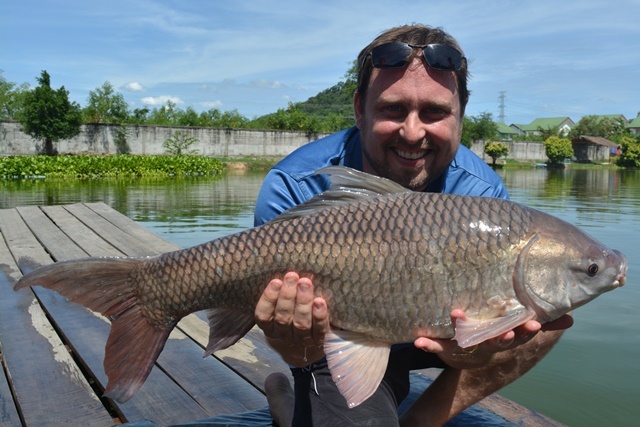 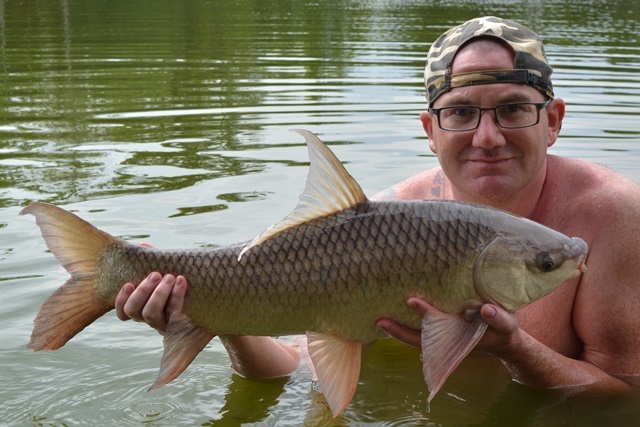 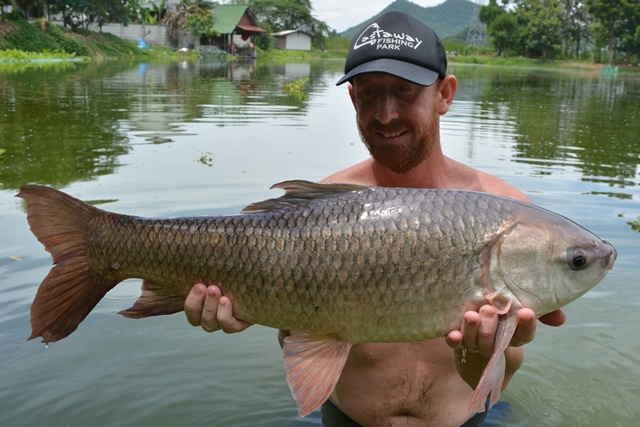 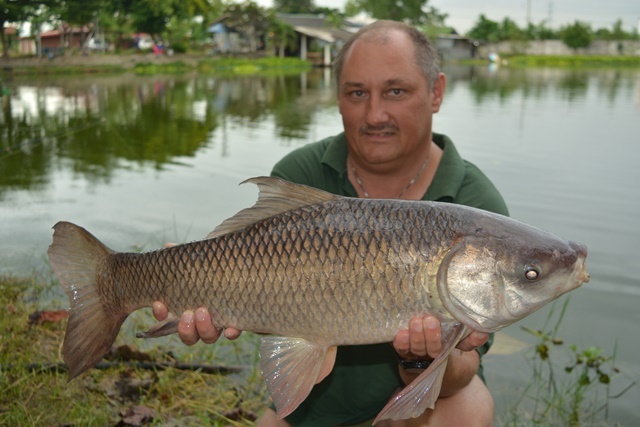 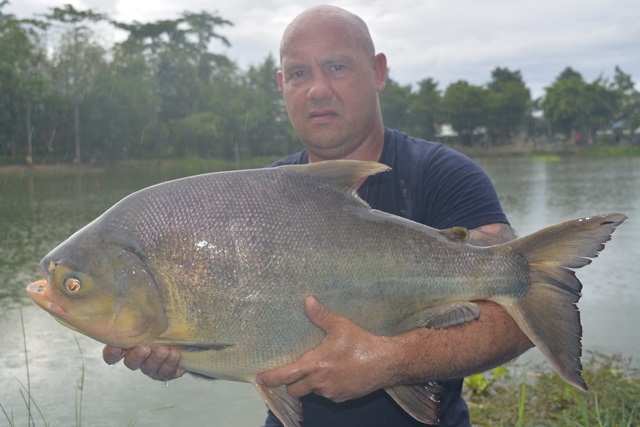 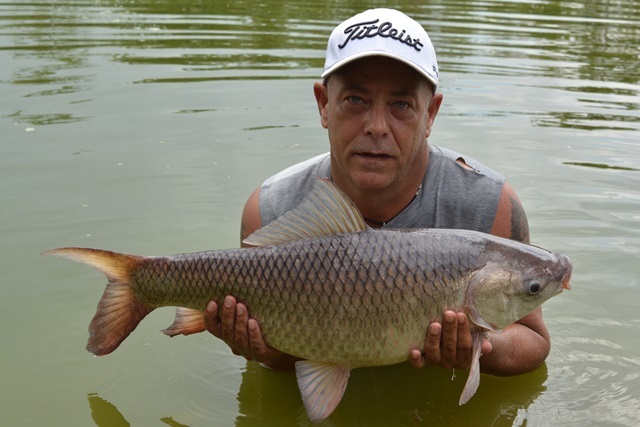 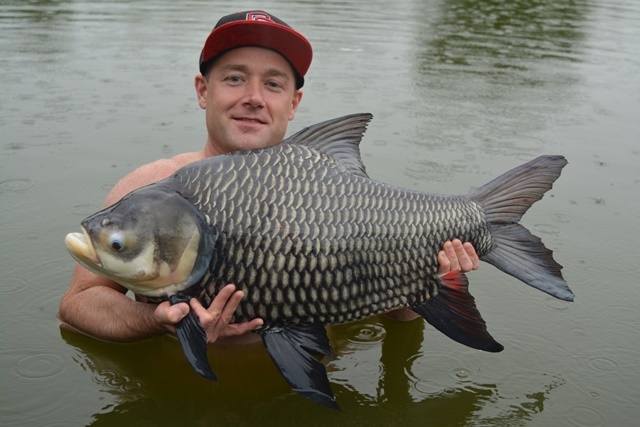 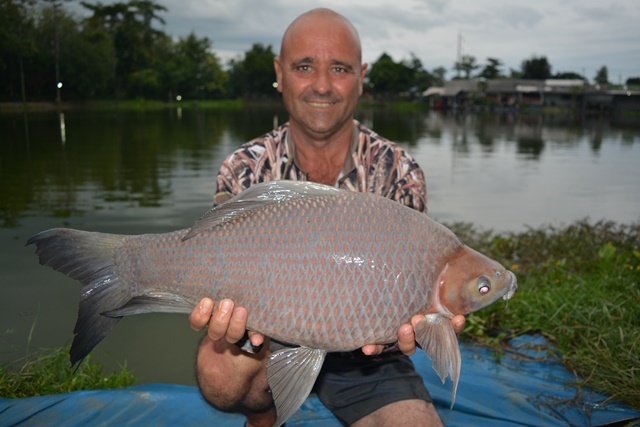 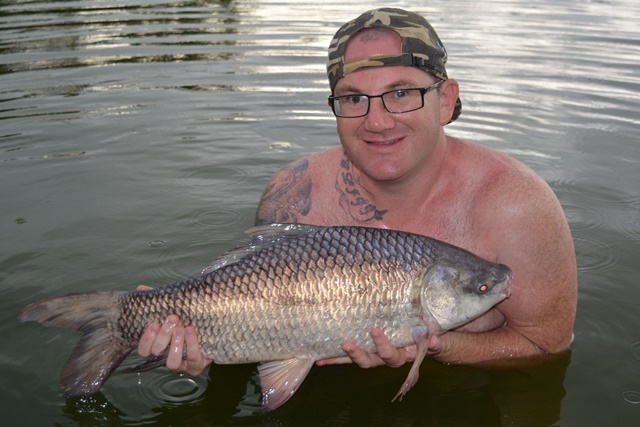 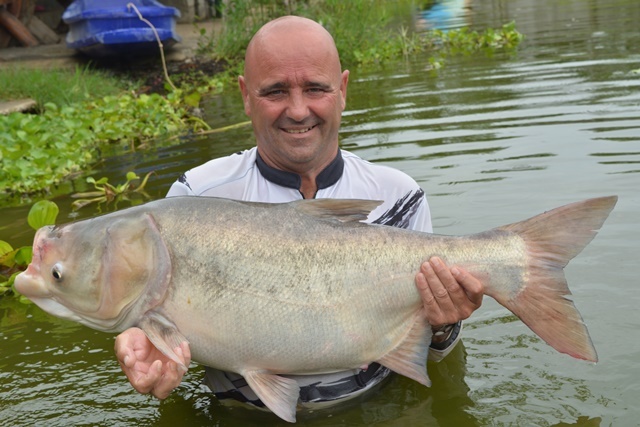 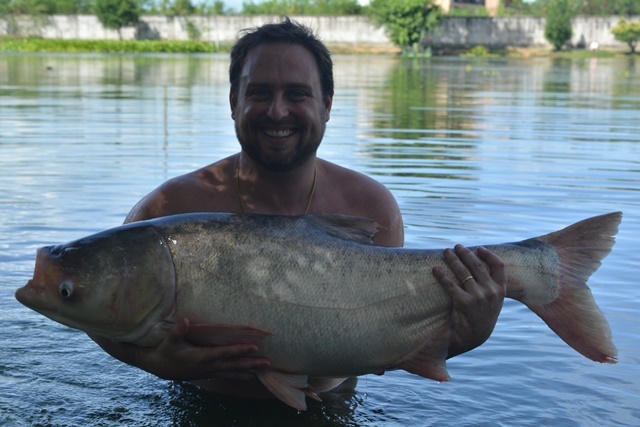 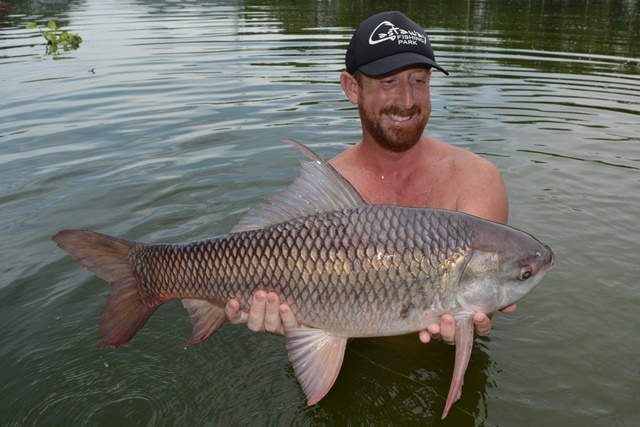 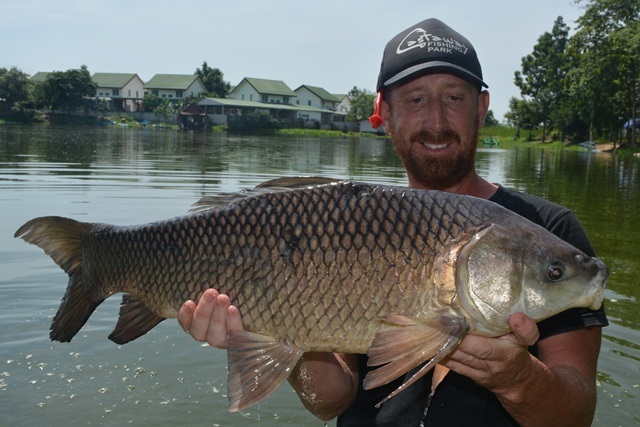 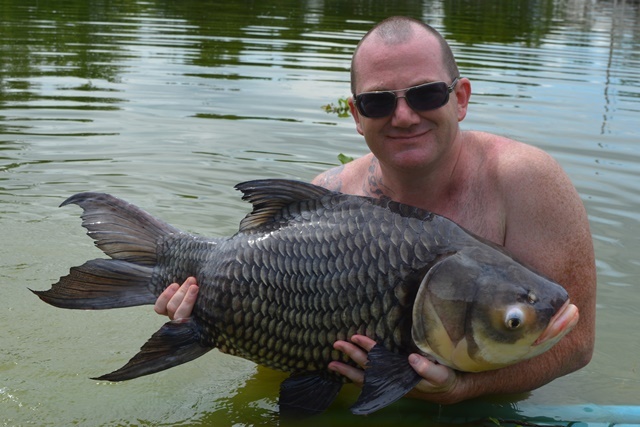 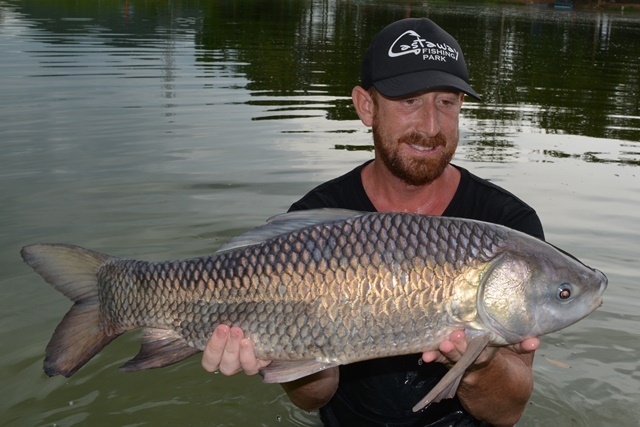 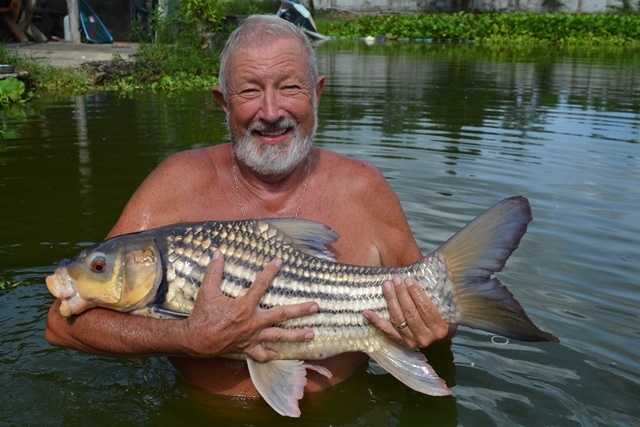 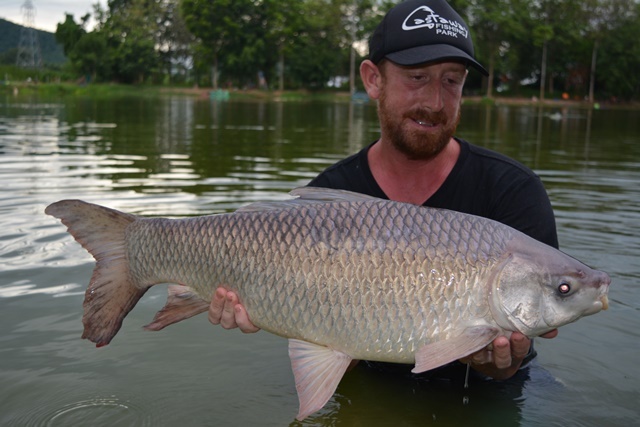 Daz Hant also returned this month and enjoyed his catches of Mekong catfish, wallago attu, pacu, Siamese carp and striped catfish. 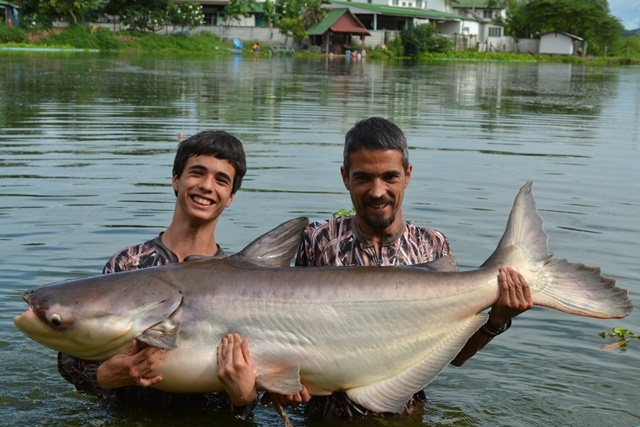 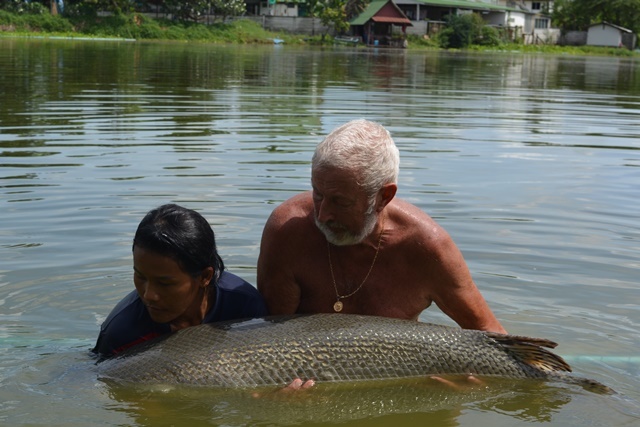 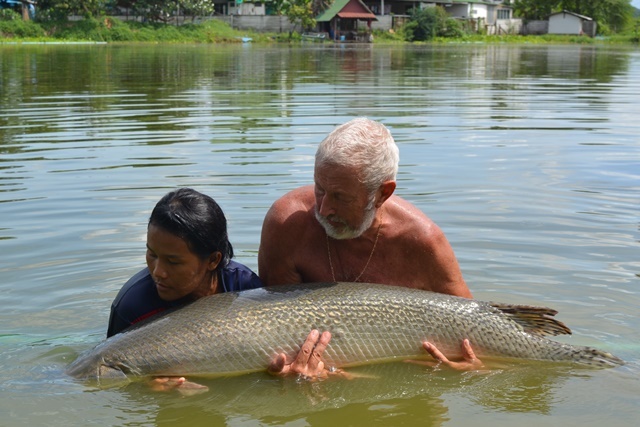 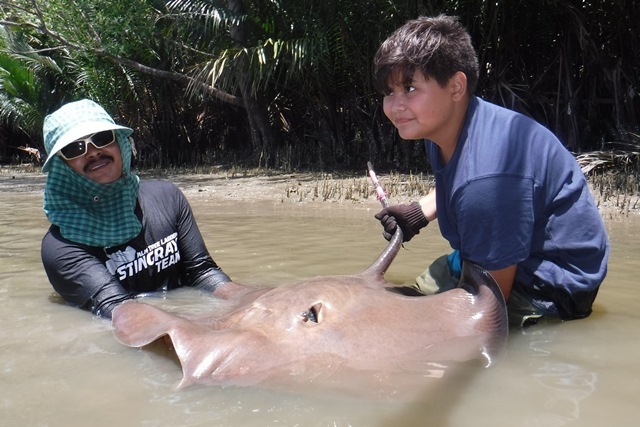 Harald Klein and his son Dani turned their hand at giant freshwater stingray fishing on the Mae Klong river and were successful in there quest even if it was only a relatively small one. 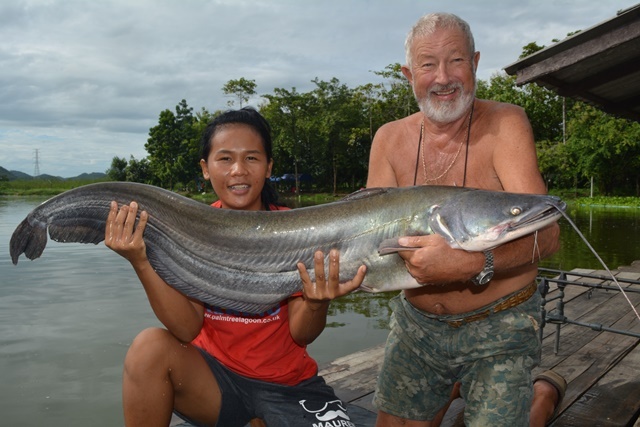 First time customer Anders Noes Rosedal was all smiles with his catches of Arapaima, bearded labeo and giant featherback. 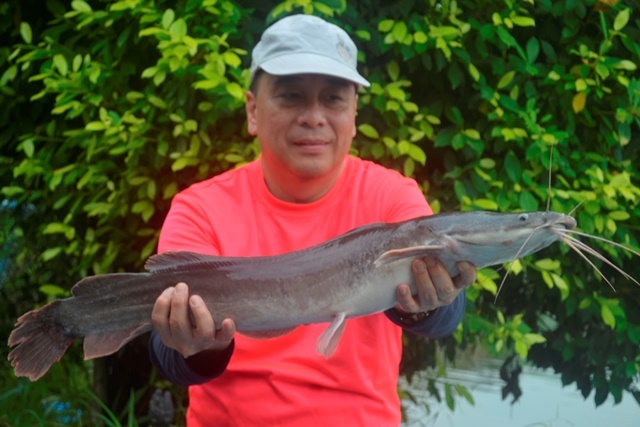 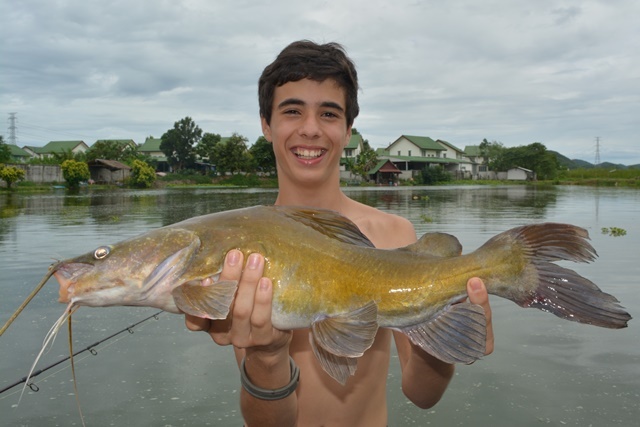 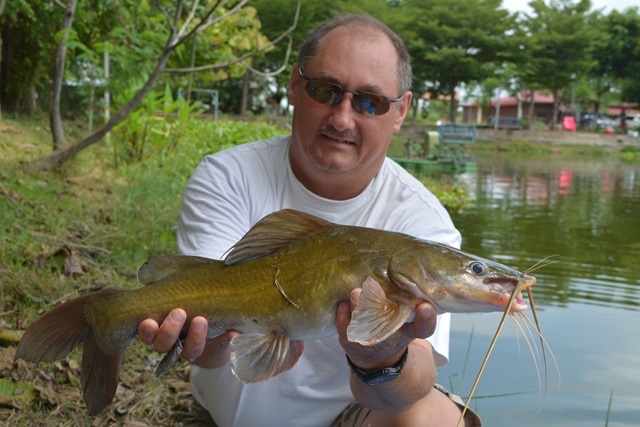 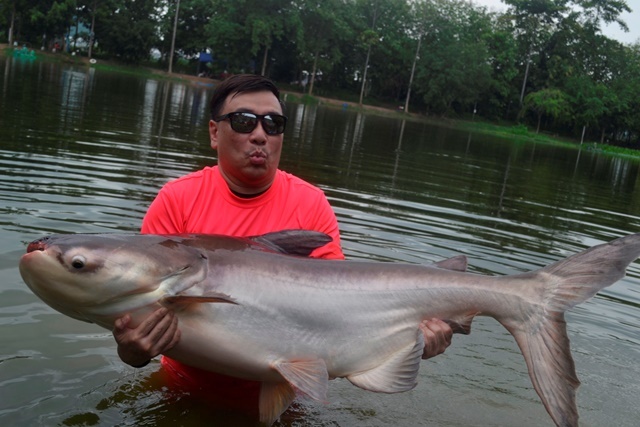 Tap of Bangkok Guiding Service was back with customer George Koo who caught Mekong catfish and vundu catfish. 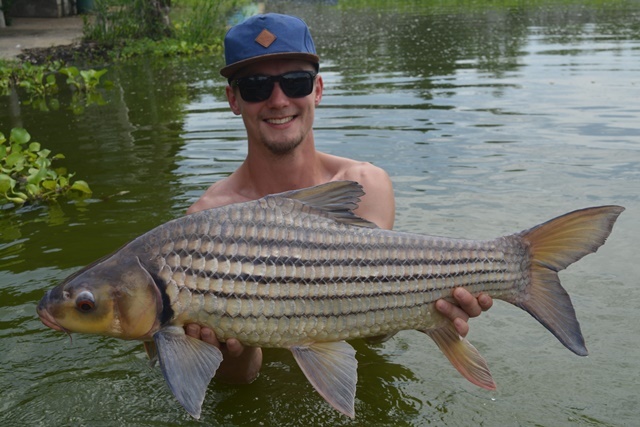 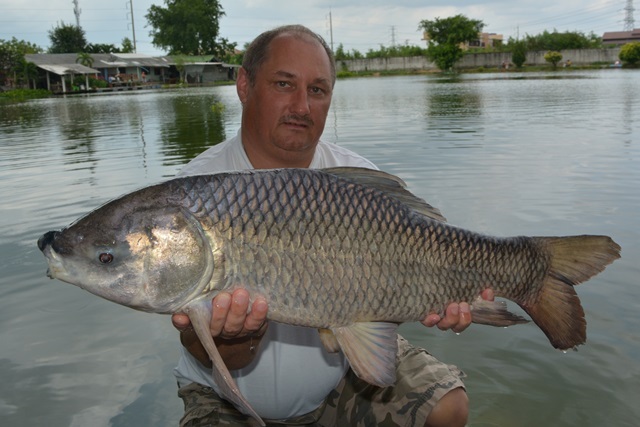 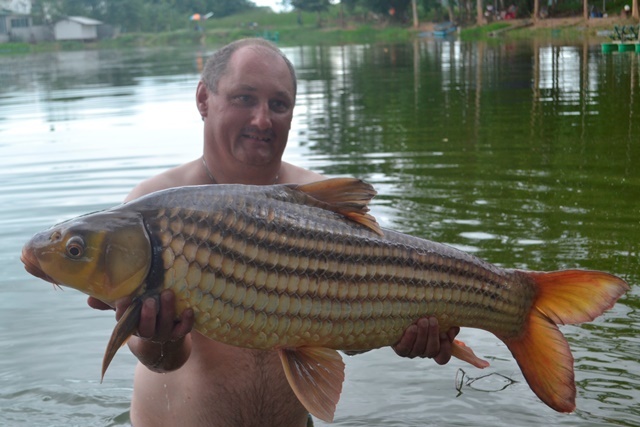 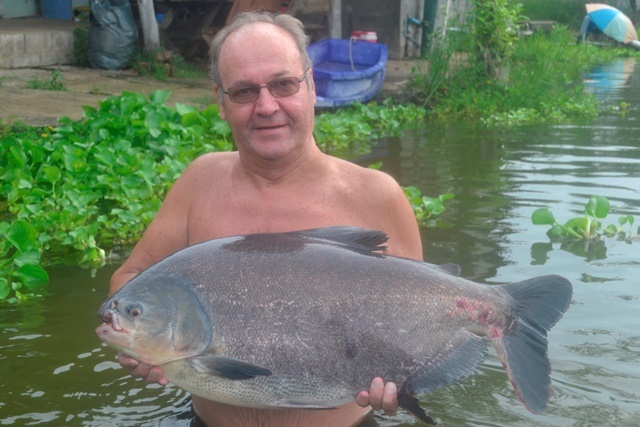 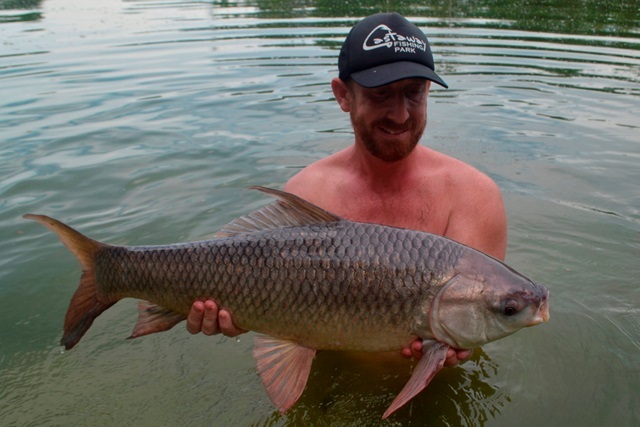 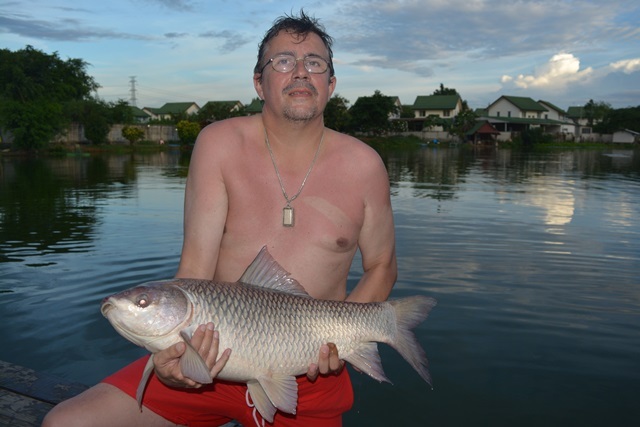 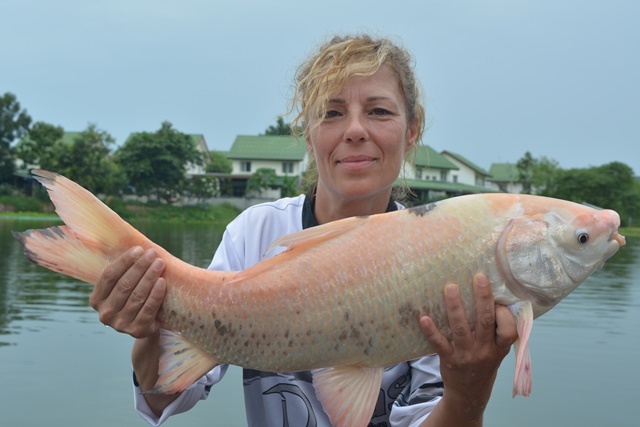 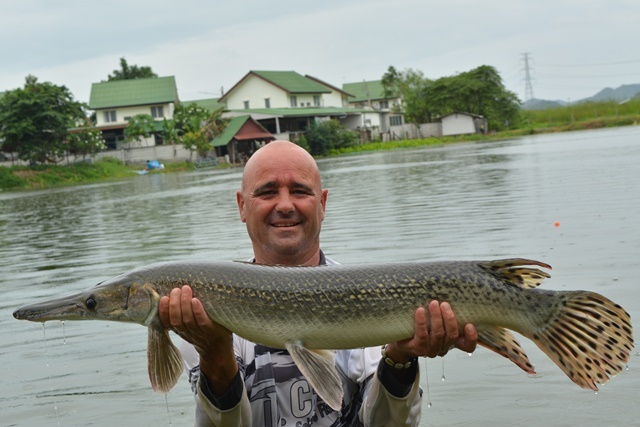 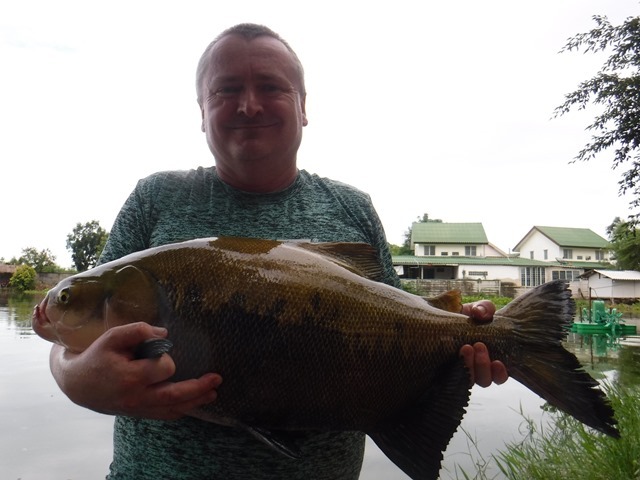 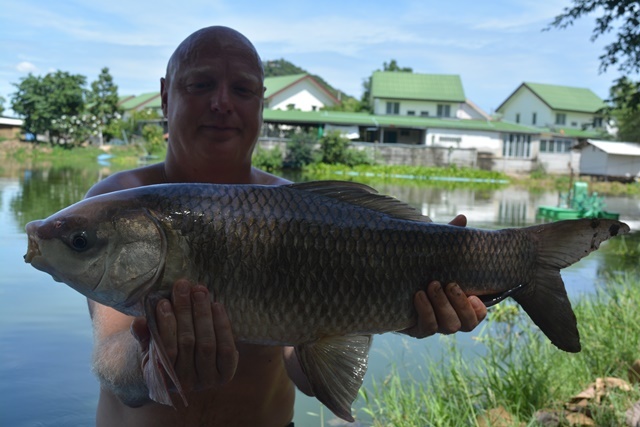 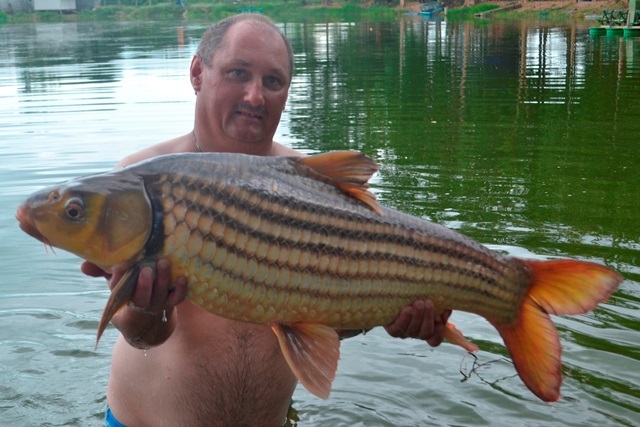 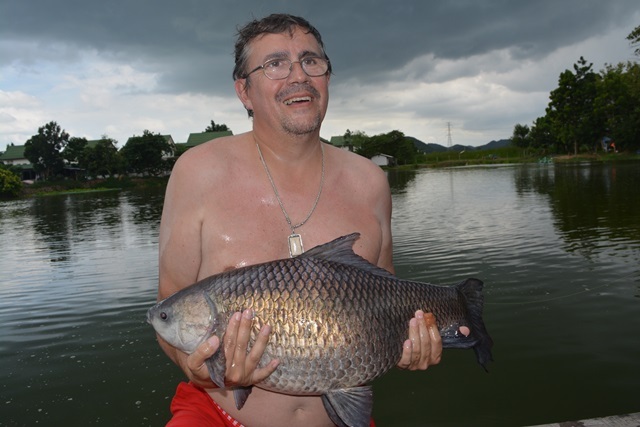 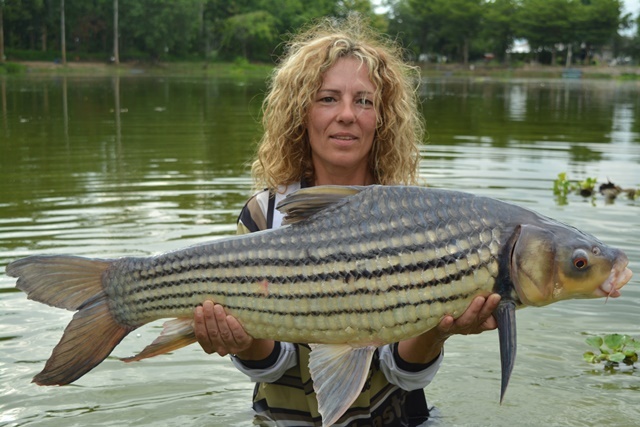 A returning Russian customer caught a nice Mekong that was not too keen on having it's photo taken.